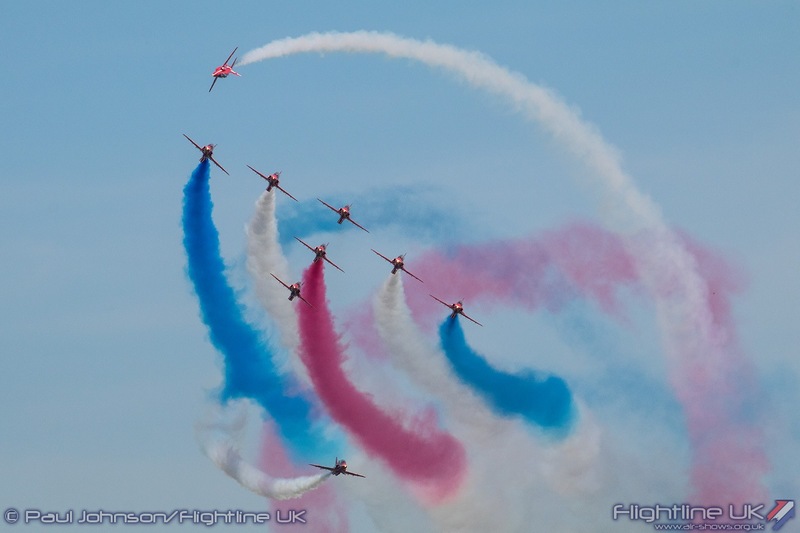 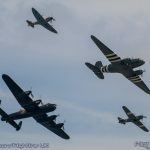 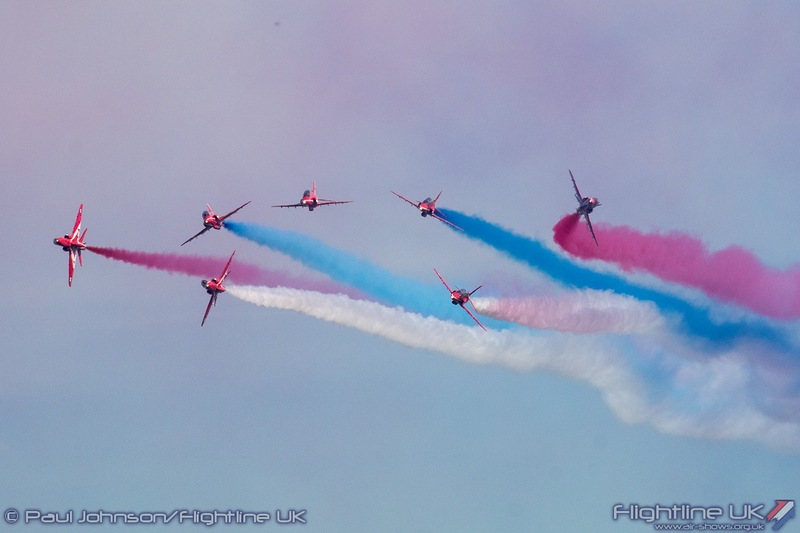 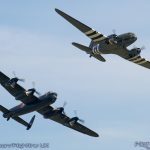 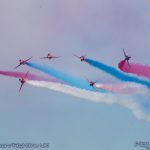 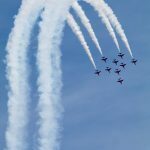 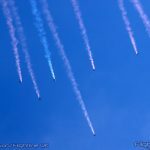 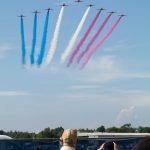 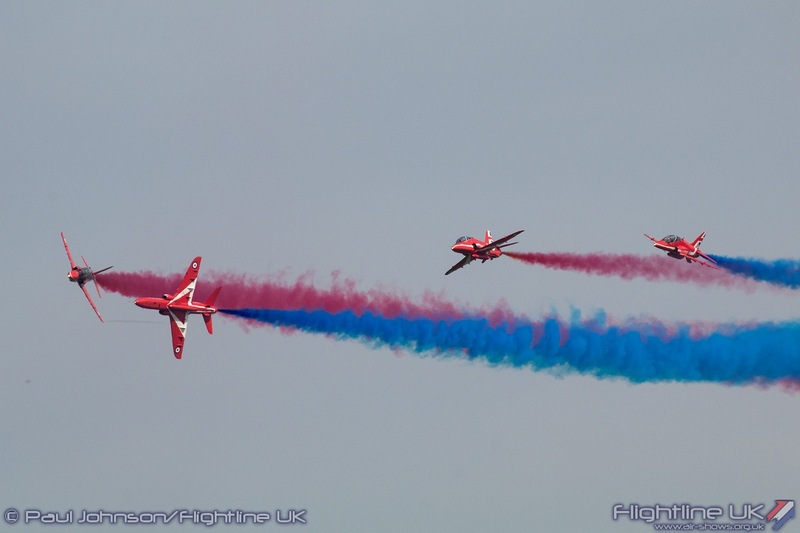 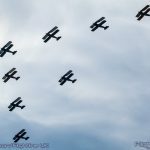 The RAF Cosford Air Show was easily one of the most anticipated events of the Royal Air Force Centenary year. 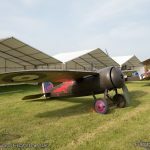 One of the centrepieces of the RAF100 project, it had been in planning for well over a year with some very ambitious plans for both the flying and static displays which told the story of the service. 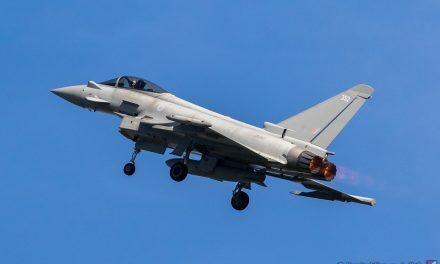 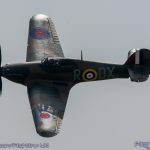 Those plans clearly struck a chord with the public with the event completely selling out and a record crowd of 60,000 descending on the Royal Air Force’s base for technical training. 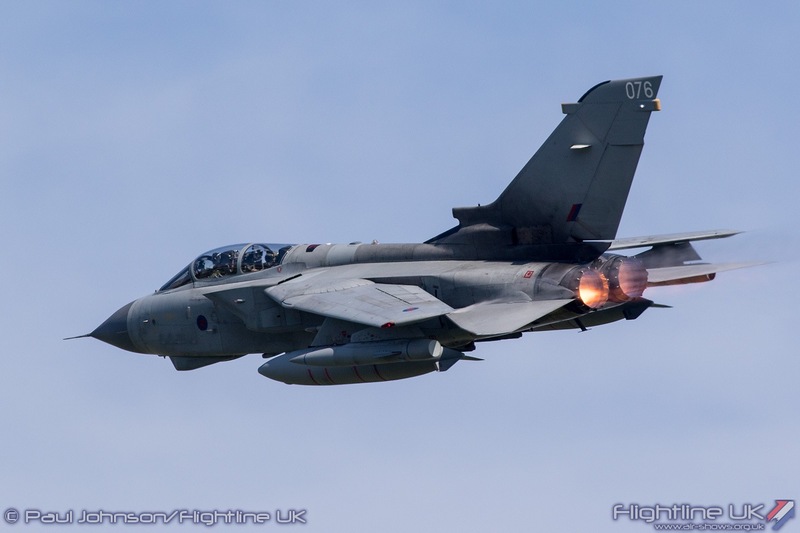 When Lord Trenchard presided over the formation of the Royal Air Force he saw the need for high quality technical training for its personnel. 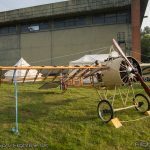 100 years later, RAF Cosford in Shropshire is a world class centre for Engineering as home to No 1 School of Technical Training. 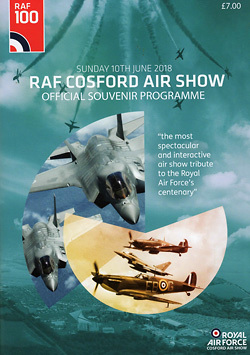 Cosford is therefore uniquely suited to hosting one of the key events in the centenary year as it can showcase not only the aviation aspects, but also so many of the other trades vital to the provision of air power both at home and deployment overseas. 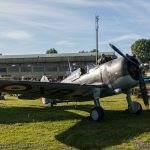 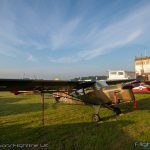 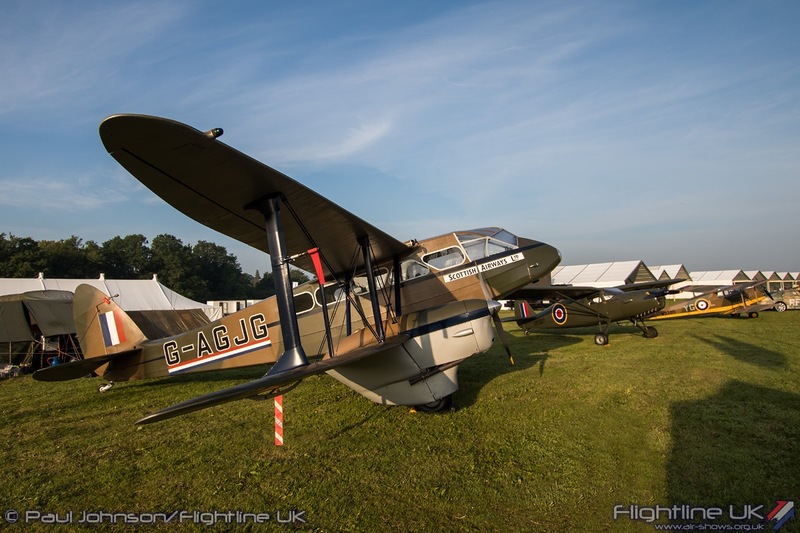 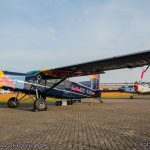 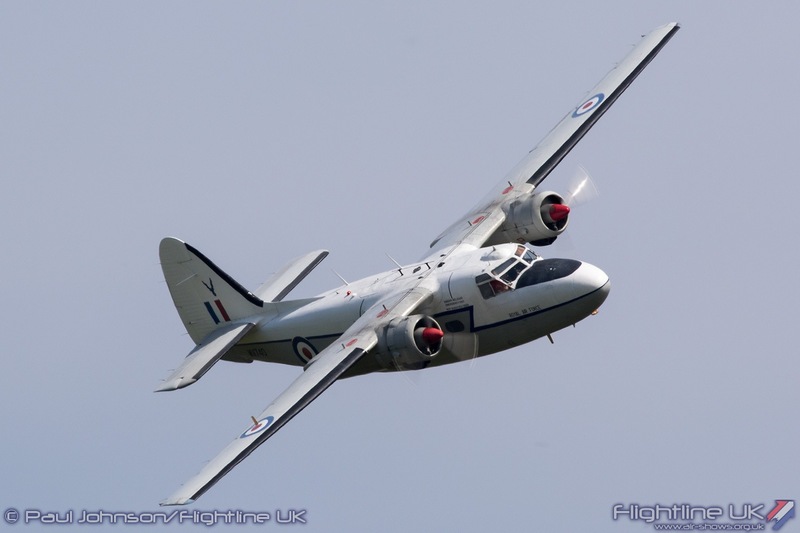 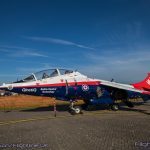 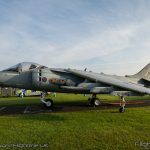 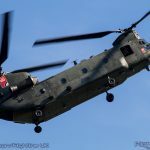 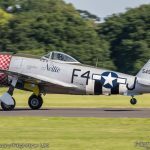 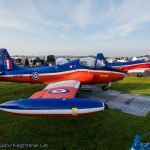 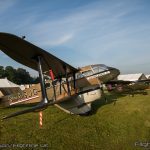 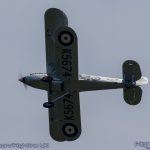 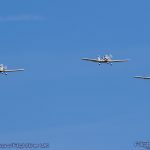 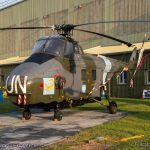 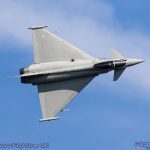 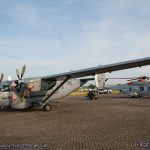 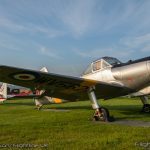 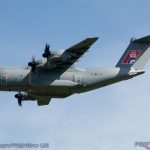 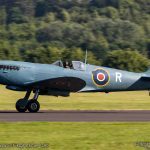 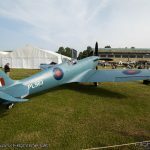 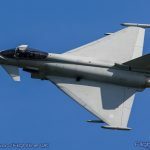 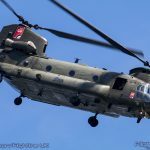 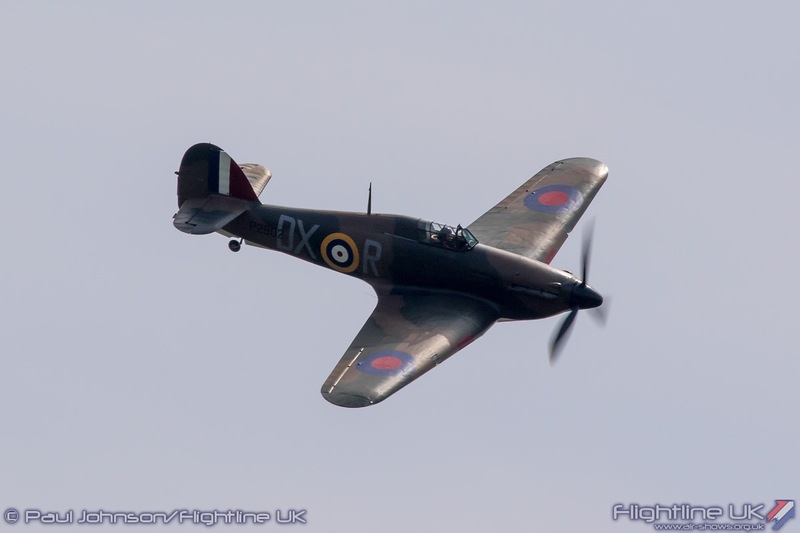 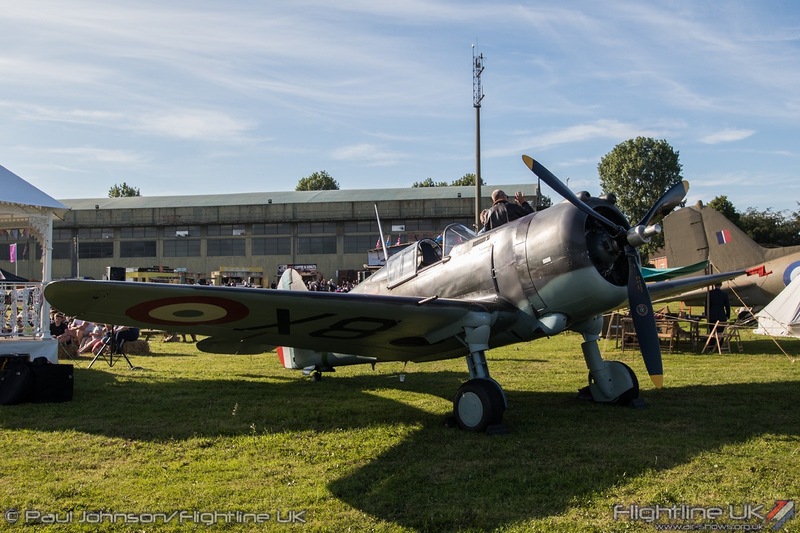 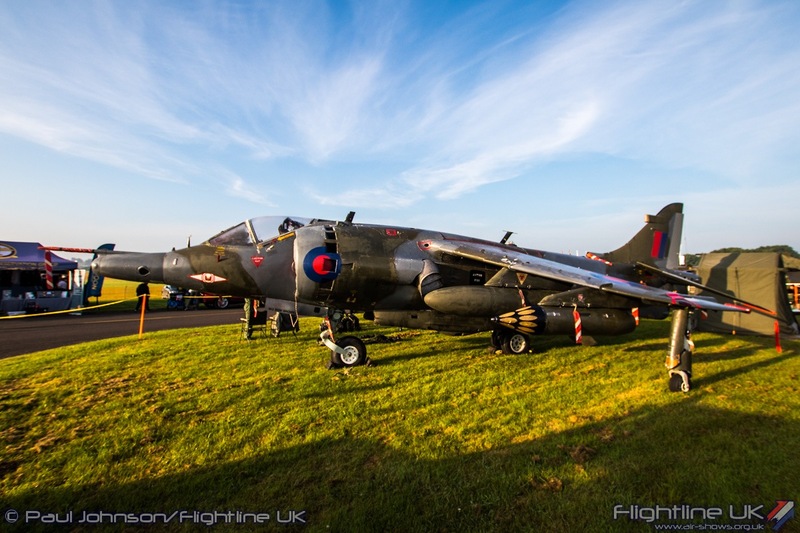 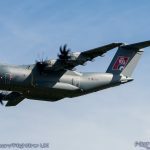 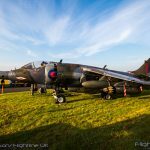 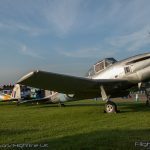 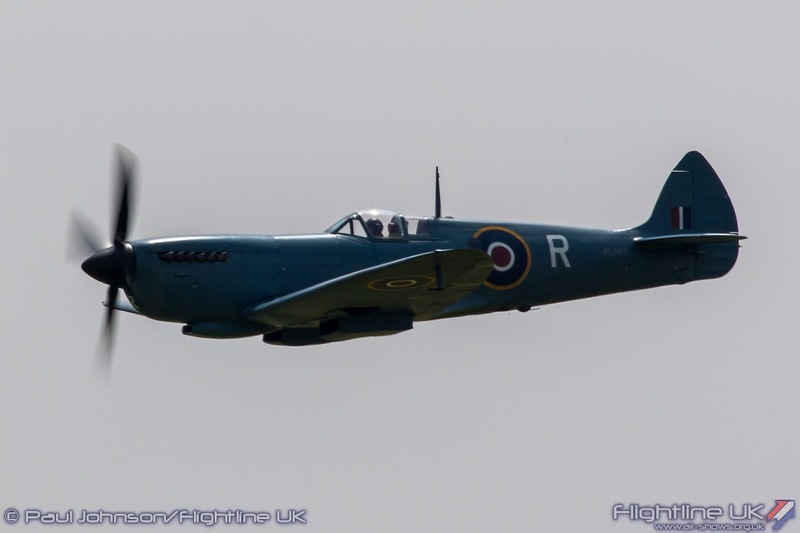 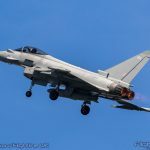 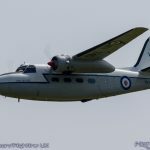 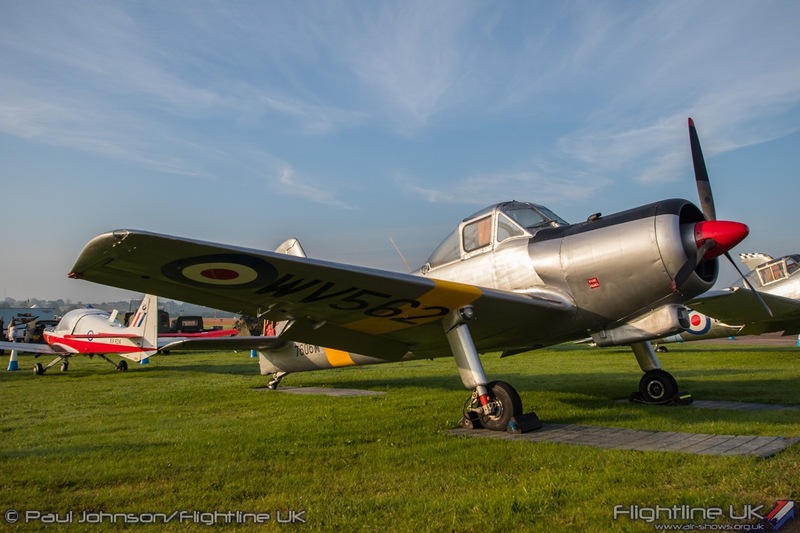 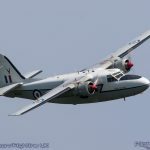 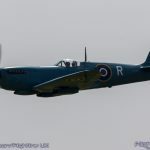 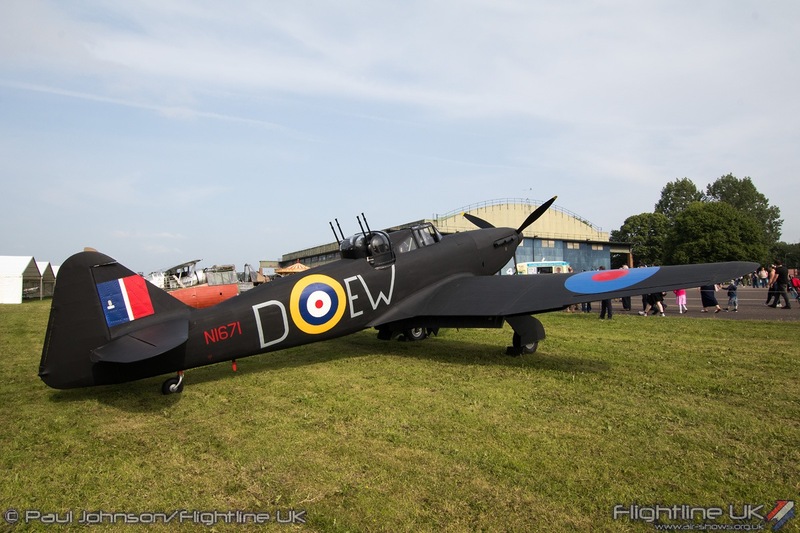 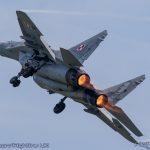 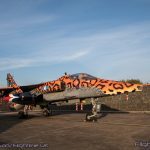 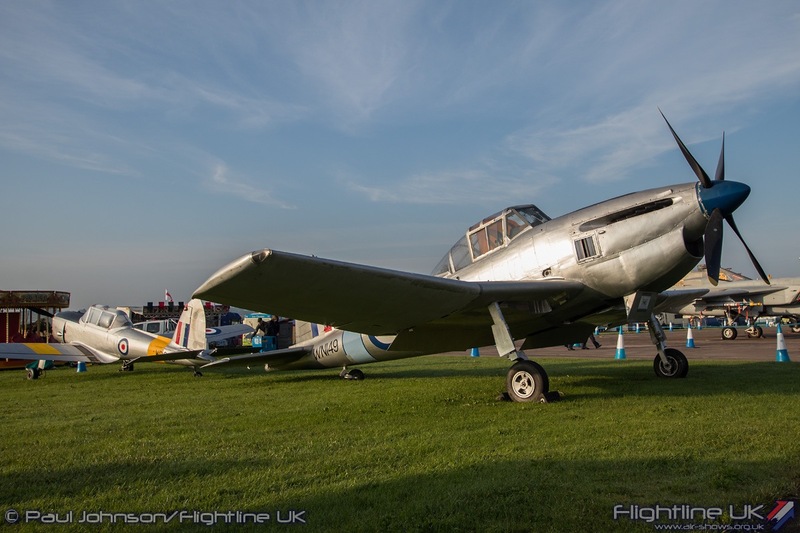 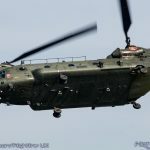 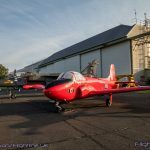 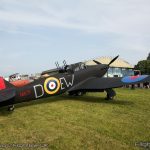 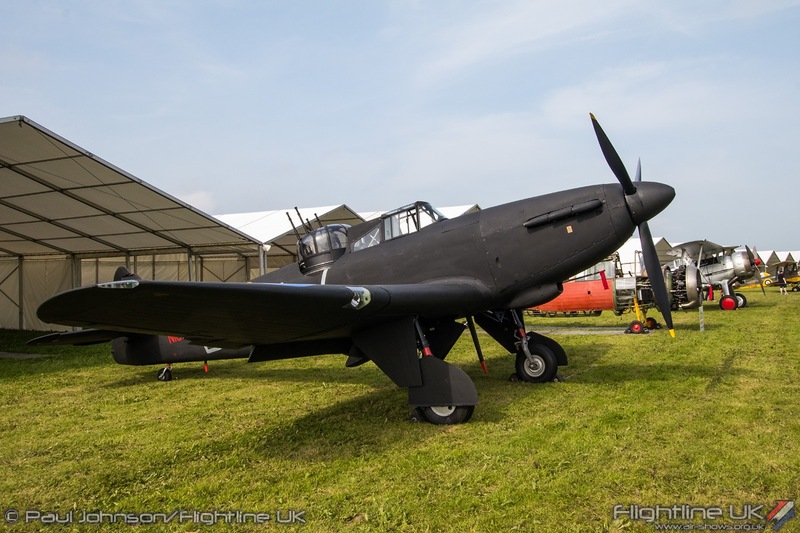 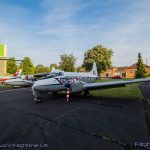 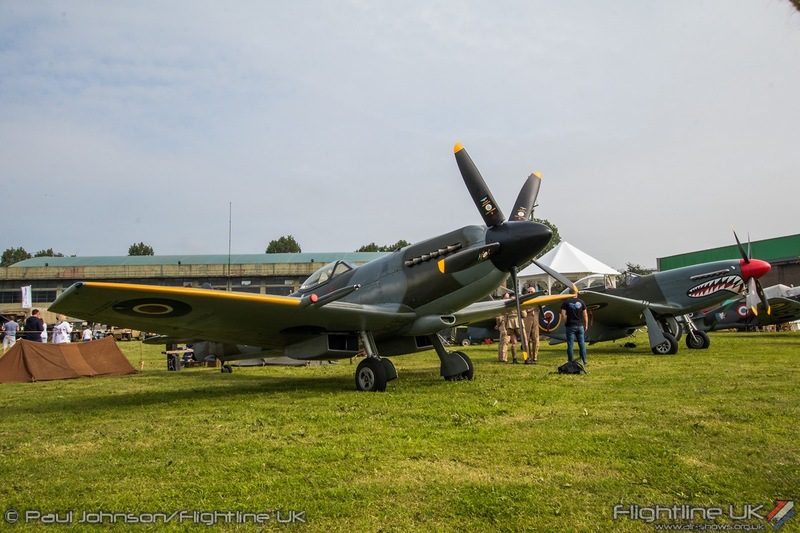 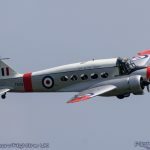 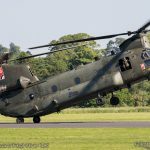 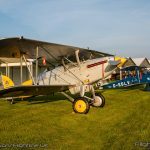 The RAF Cosford Air Show 2018 certainly proved to be a popular event. 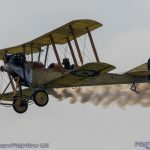 The event’s exciting plans for the centenary celebrations and the added buzz of RAF100 across wider media clearly enthused many with online tickets selling out well in advance of the event. 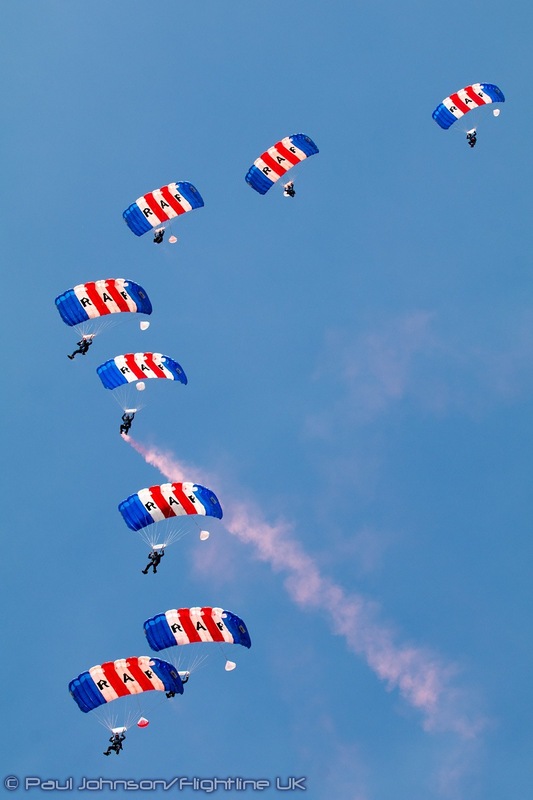 In the days before the event, local outlets too began to sell out leading to a predicted record crowd of nearly 60,000 attending the show. 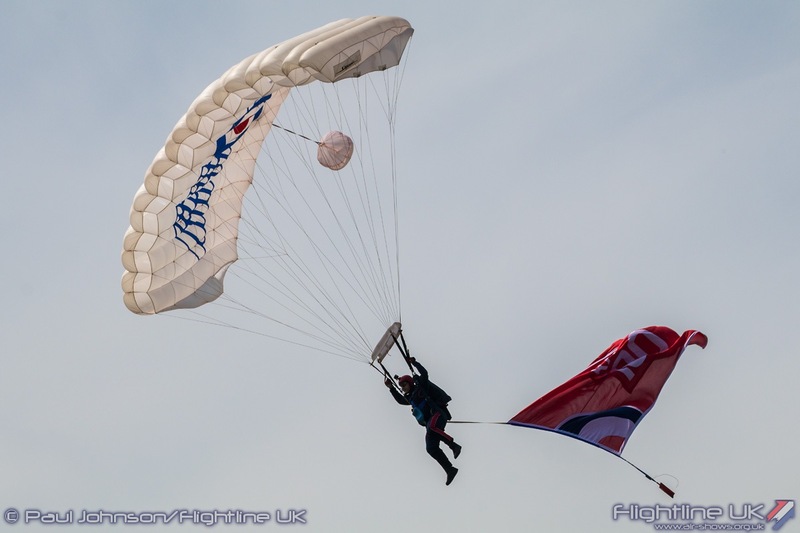 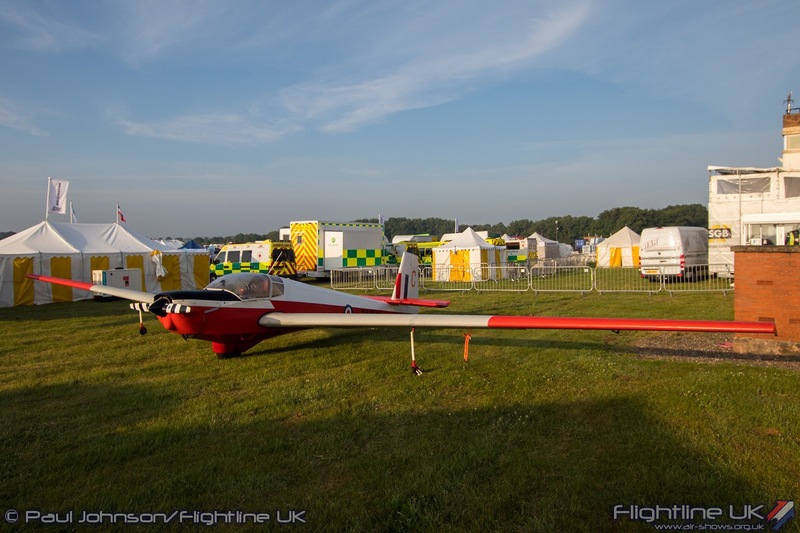 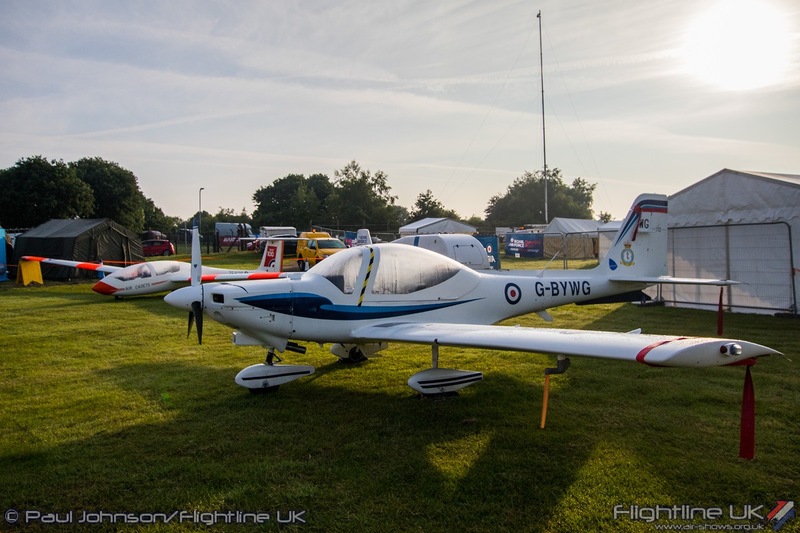 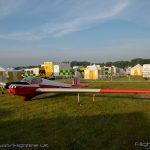 A sell-out is always superb news for the event as it supports the RAF charities but it all creates challenges for the logistical exercise of getting people in and out of the event. 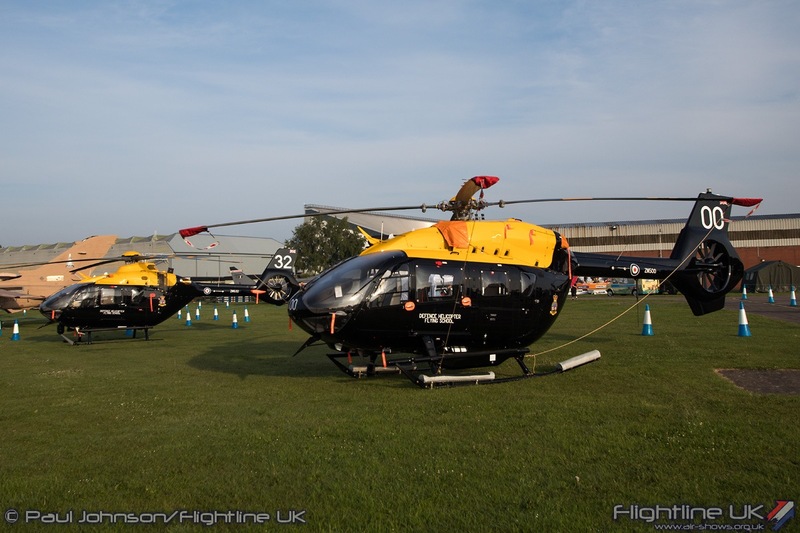 Cosford has really worked on its traffic management in recent years but there is always a limit to what is possible. 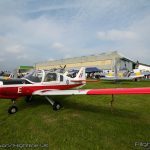 The news of the sell-out did mean that many arrived at Cosford earlier and that queues on the roads surrounding Cosford started much sooner than usual. 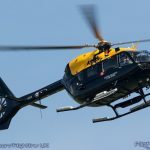 This had knock-on effects as more and more arrived later on leading to some quite substantial delays on the approach roads and plenty of frustration for those stuck in them. 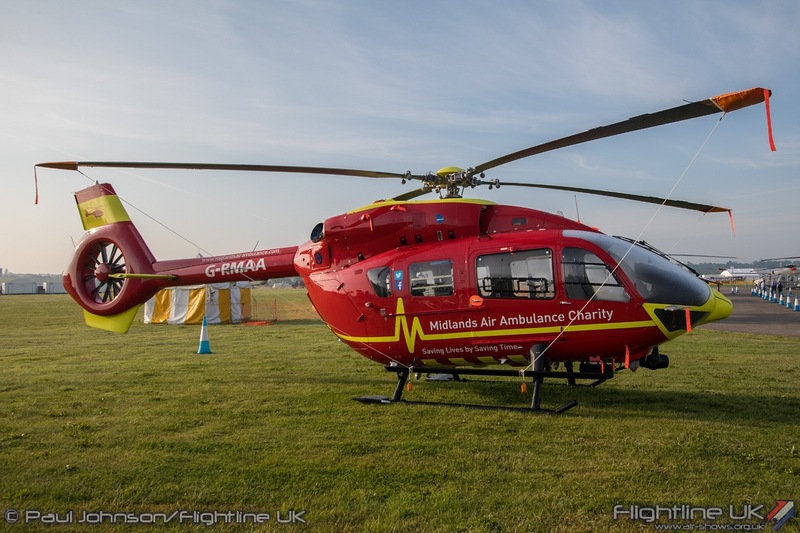 Getting out too has always been a little sticky but this year the exit plans were hit by a serious accident on the A41 towards Wolverhampton forcing almost everyone heading south or east to divert onto the M54 slowing things down considerably. 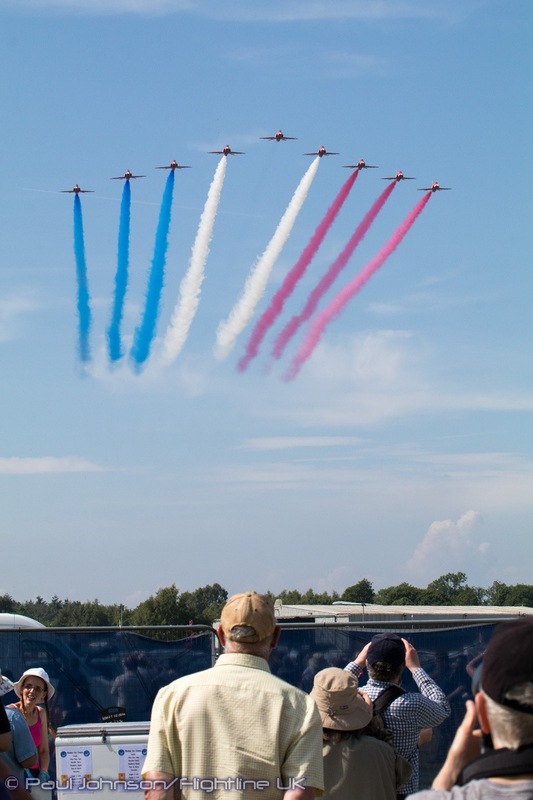 The mantra of the RAF100 project is “Commemorate, Celebrate and Inspire” and these words were very much at the heart of what RAF Cosford wanted to portray at the Air Show. 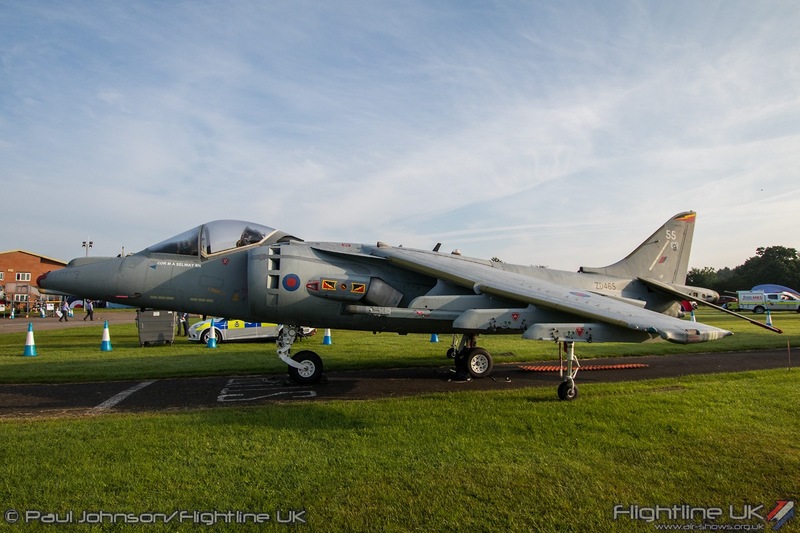 Cosford always excels at showing off the different trades which are taught at the base through its hangar displays. 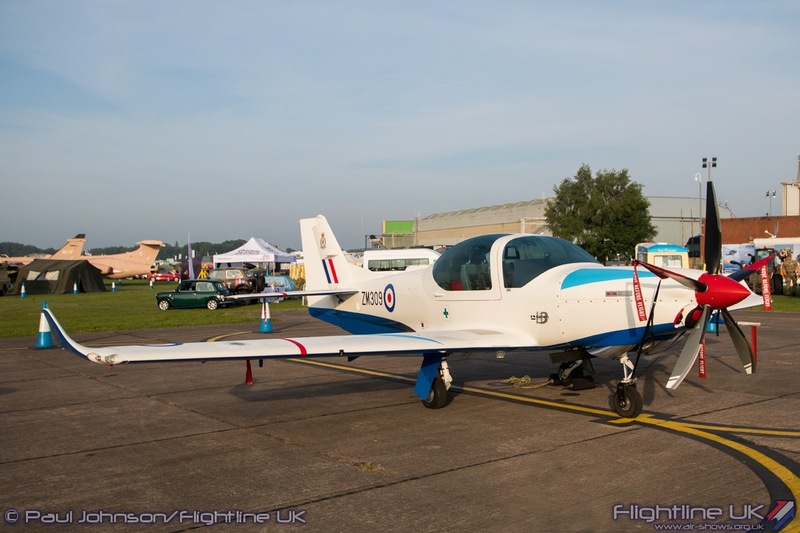 Cosford’s own exhibits were joined by industry with a strong focus on Science, Technology, Engineering and Mathematics (STEM) activities to provide the “inspirational” element alongside the RAF village. 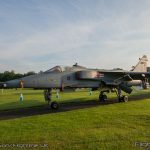 One of the outstanding features of the 2018 RAF Cosford Air Show was the RAF100 static display. 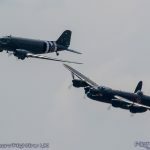 It was a truly unique spectacle that is unlikely ever to be repeated on such a scale. 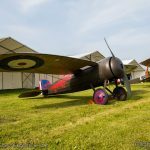 The display saw aircraft, support equipment and re-enactors brought together to highlight four major themes of the past 100 years; Policing the Empire (1918-1938), World at War (1939-1945), Age of Uncertainty (1945-1999) and The New Millennium (2000-present). 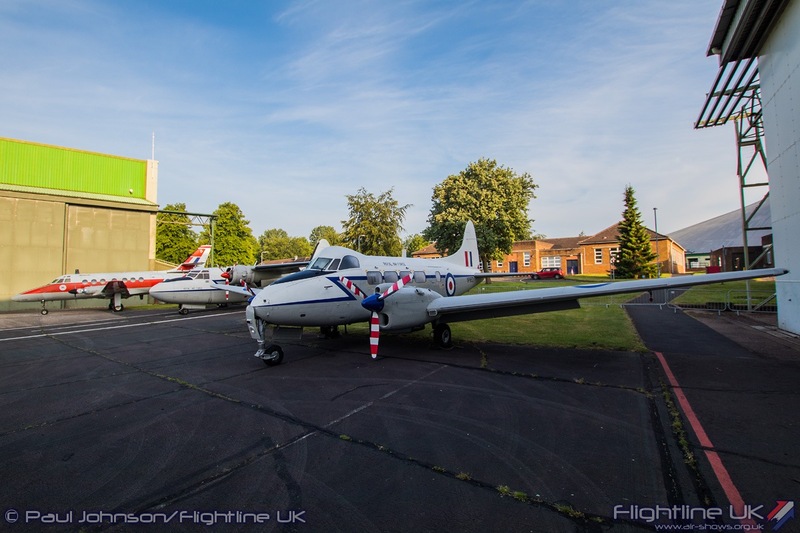 Aircraft came from all over the UK with airworthy airframes joined by aircraft brought in by road and from the co-located RAF Museum. 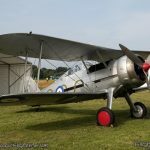 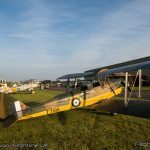 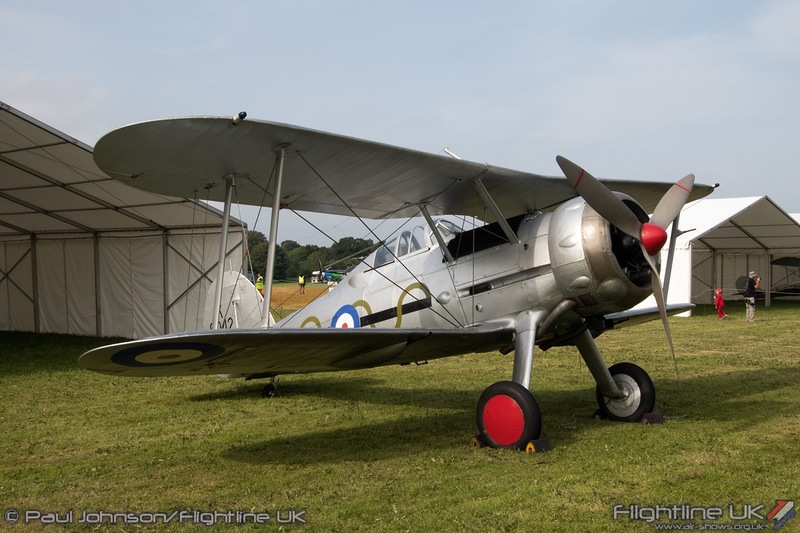 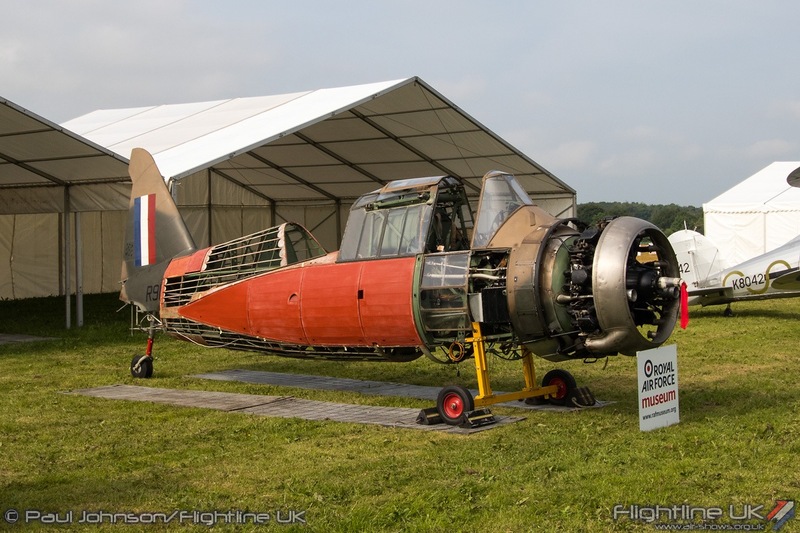 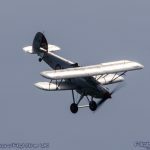 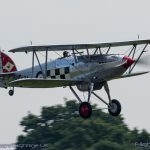 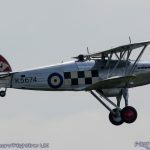 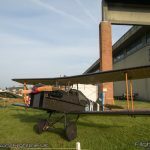 The latter’s contribution was superb with their Sopwith 1½ Strutter, Bristol M1C, Bolton-Paul Defiant, Westland Lysander restoration project, Gloster Gladiator and the Gloster F9/40 Meteor all brought outside for the display. 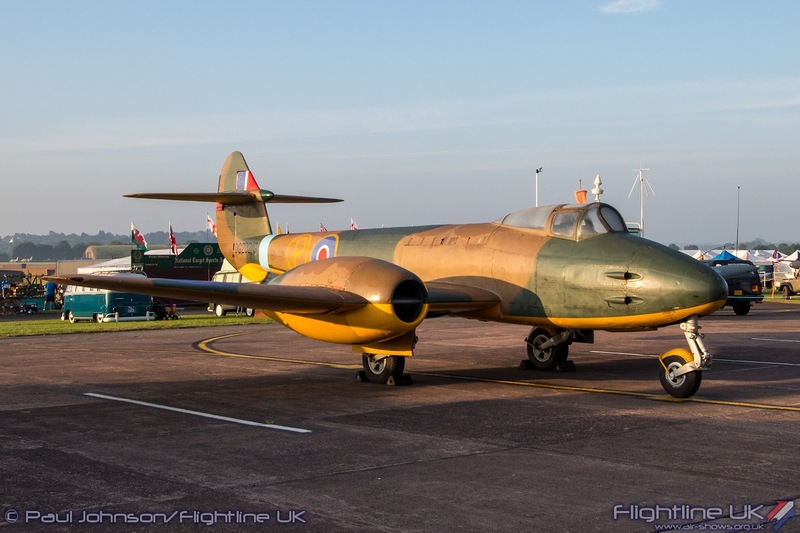 Some of the “roaded-in” aircraft were equally noteworthy with the Bolton-Paul Balliol from the Bolton-Paul Association, GJD Services’ Hawker Hunter T7, the Yorkshire Helicopter Preservation Group’s Westland Whirlwind HAR10 and the Cornwall Aviation Heritage Center’s English Electric Lighting F53 all attracting much attention. 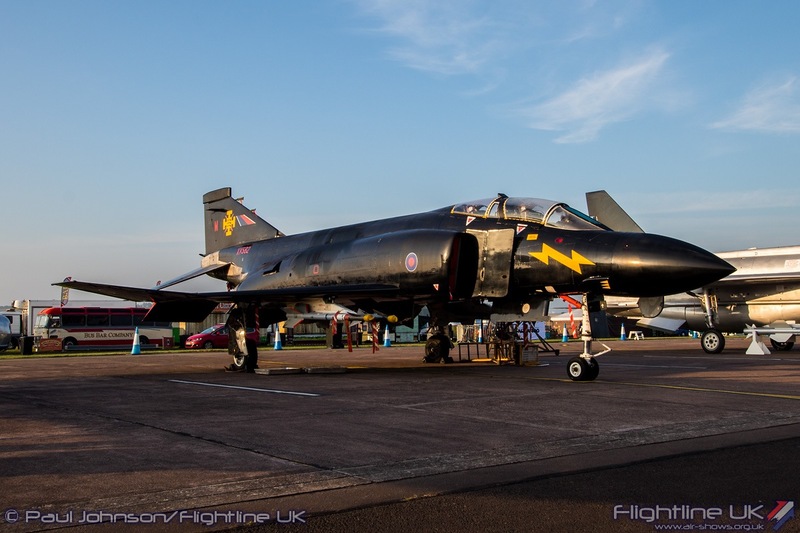 However, it was the McDonnell Douglas F-4K Phantom FG1 “Black Mike” that was perhaps the star turn. 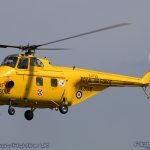 The airframe will be familiar to anyone who attended the RAF Leuchars Airshows as it was often on static display for cockpit visits. 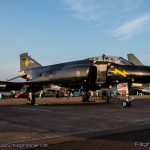 Now under the hands of the British Phantom Aviation Group the aircraft was one of the first arrivals at Cosford over the winter. 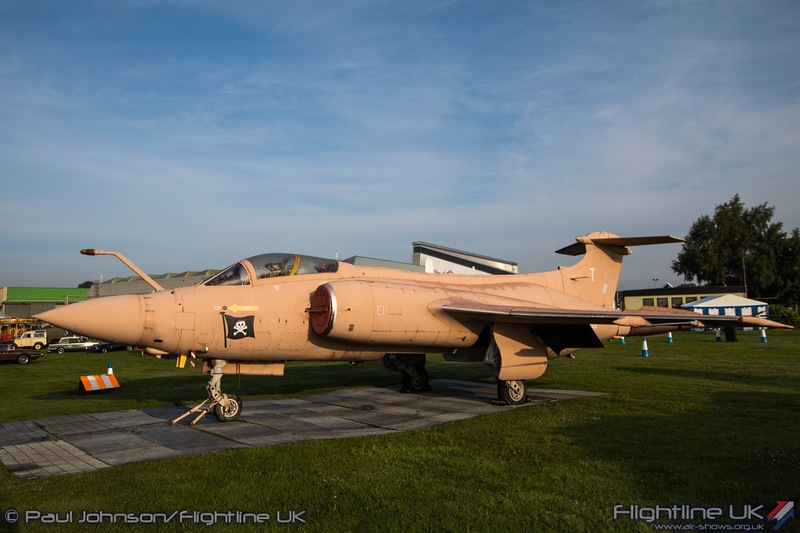 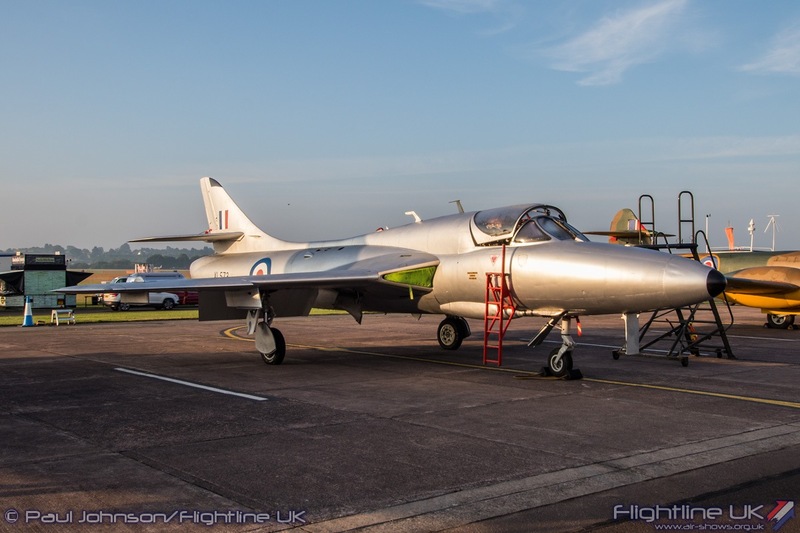 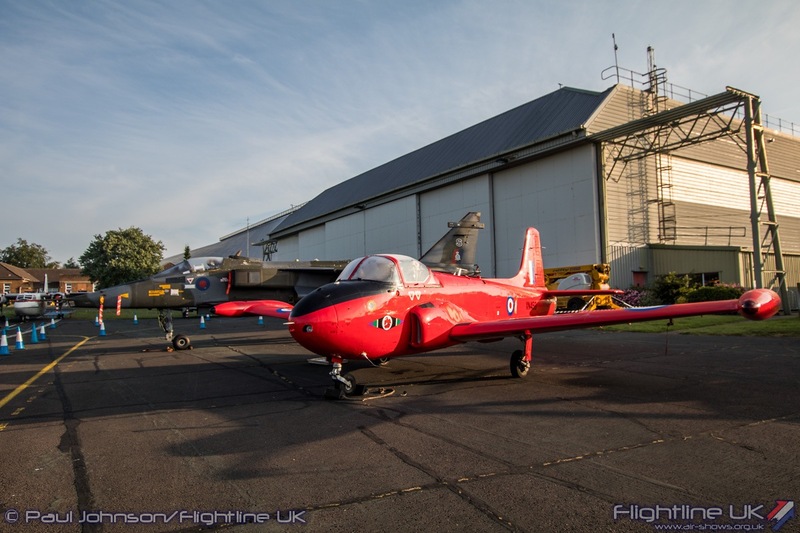 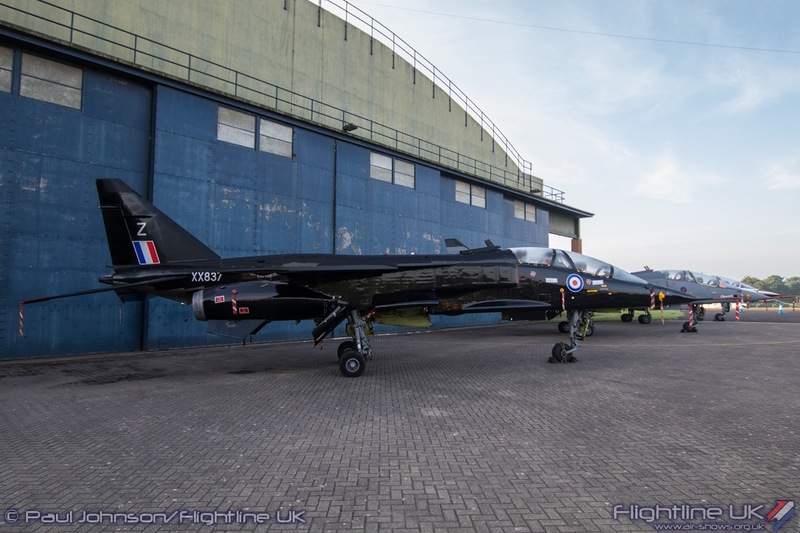 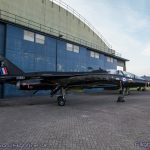 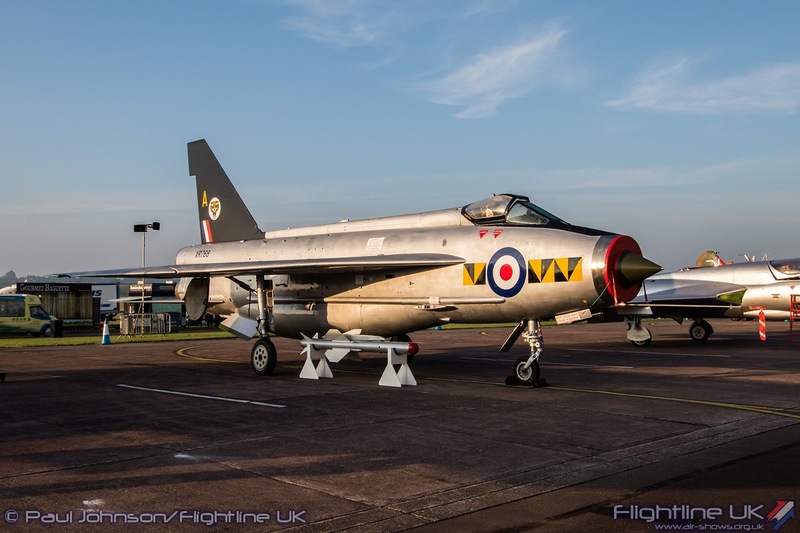 Thanks to facilities at Cosford, the Group has progressed a long way in its aims to restore the aircraft which looked sensational parked with the other jet fighters. 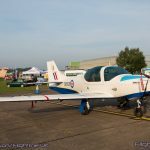 RAF Cosford’s personnel and local air cadets also helped bring some aircraft to standard for presentation in the static displays. 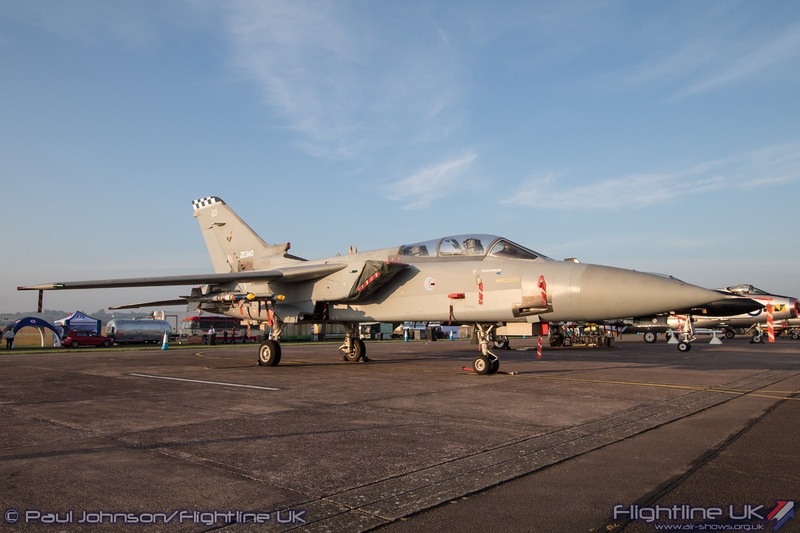 A personal favourite was the almost factory fresh looking Panavia Tornado F3 parked with the other air defence fighter. 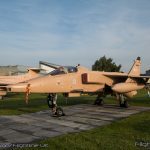 Local Air Cadets had also helped prepare a Panavia Tornado GR1 for the Gulf War static display applying “Desert Pink” and nose artwork. 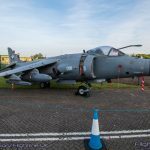 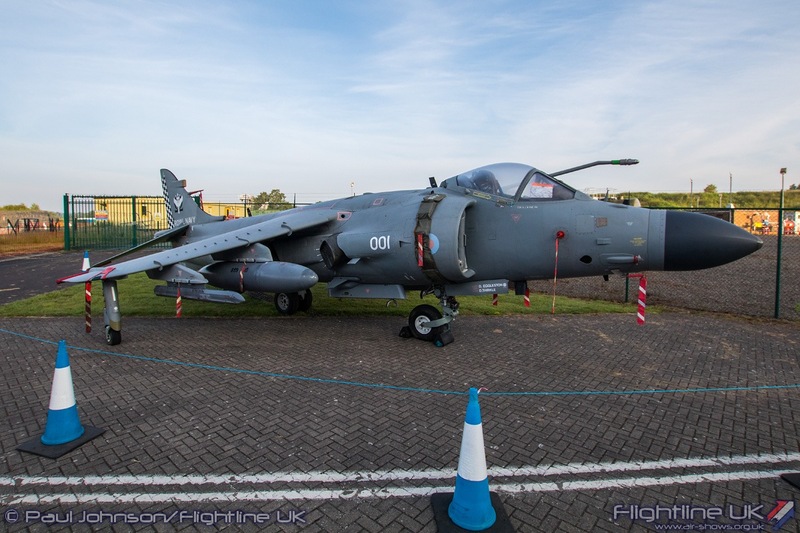 It took pride of place alongside similarly desert prepared examples of the Blackburn Buccaneer S2B and SEPECAT Jaguar GR1. 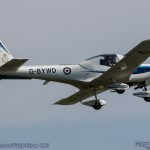 Modern day Royal Air Force participation in the static did seem rather limited with just examples of the Grob Tutor T1 from the University of Birmingham Air Squadron, a 72(R) Squadron Shorts Tucano T1, Grob Prefect T1 plus the RAF Shawbury pairing of Airbus Helicopters H135 Juno HT1 and H145 Jupiter HT1 on display. 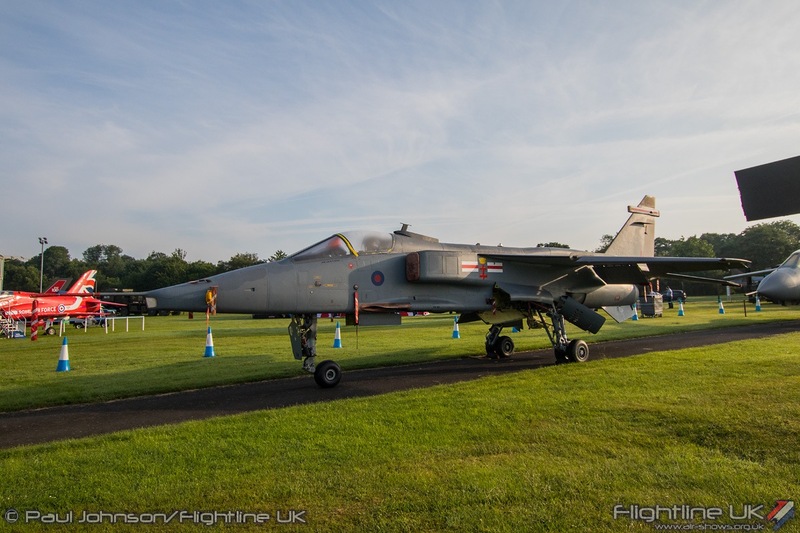 There were however full scale replicas of Eurofighter Typhoon and F-35 Lightning II in the RAF Village. 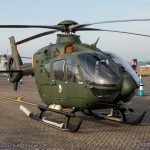 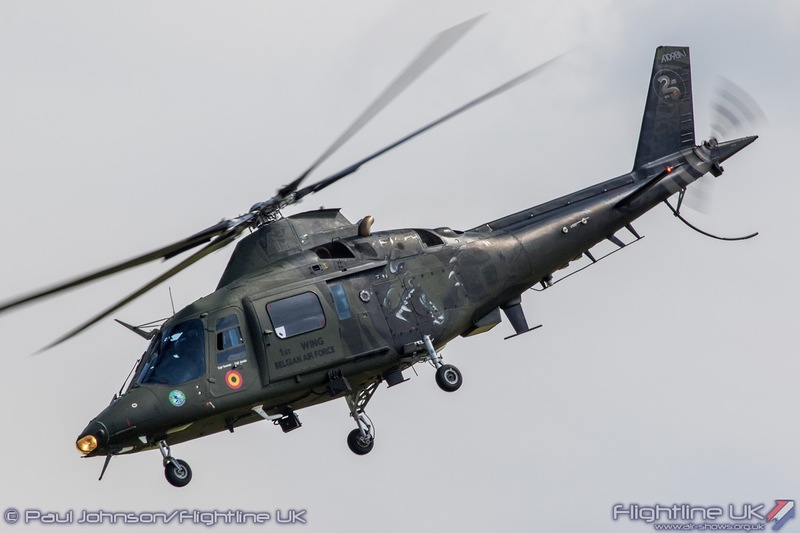 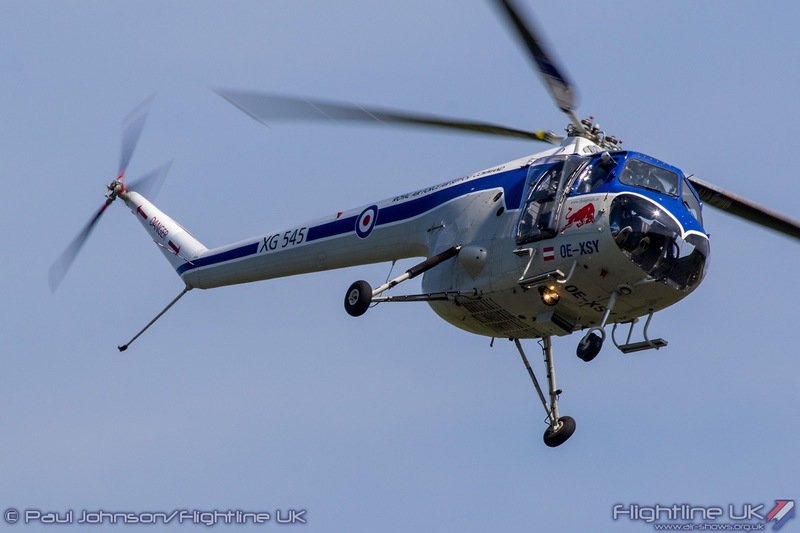 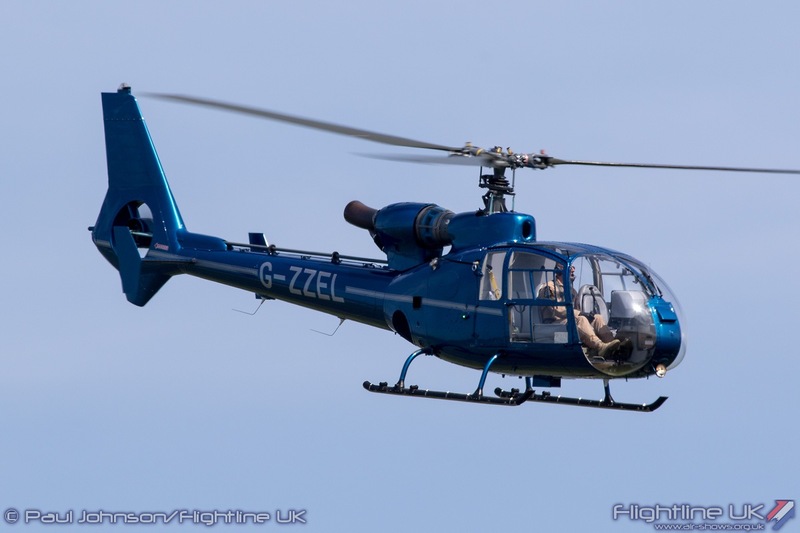 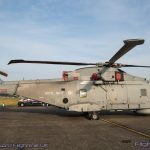 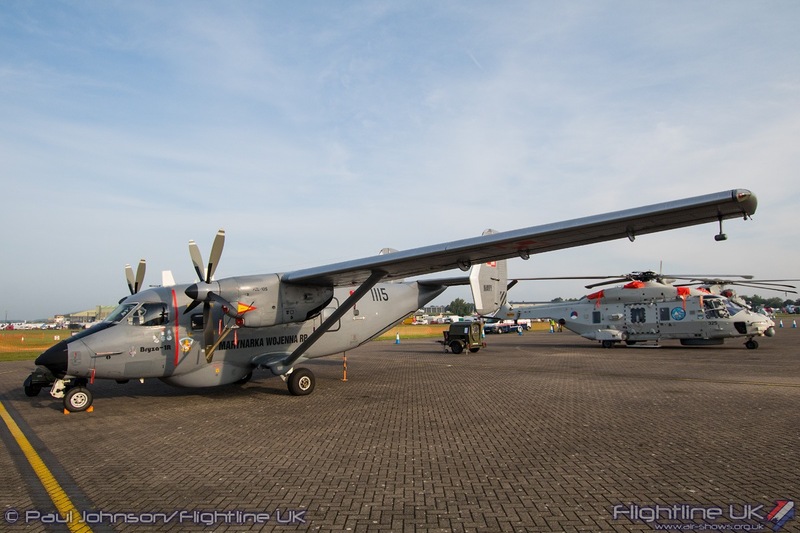 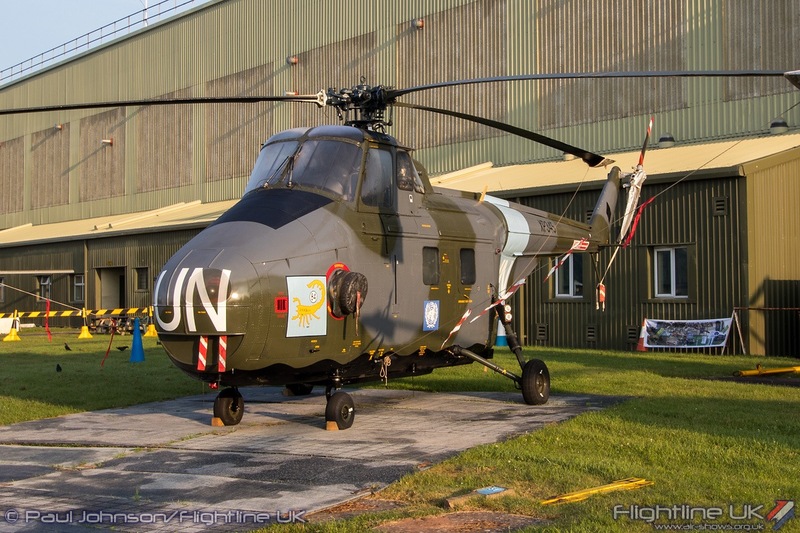 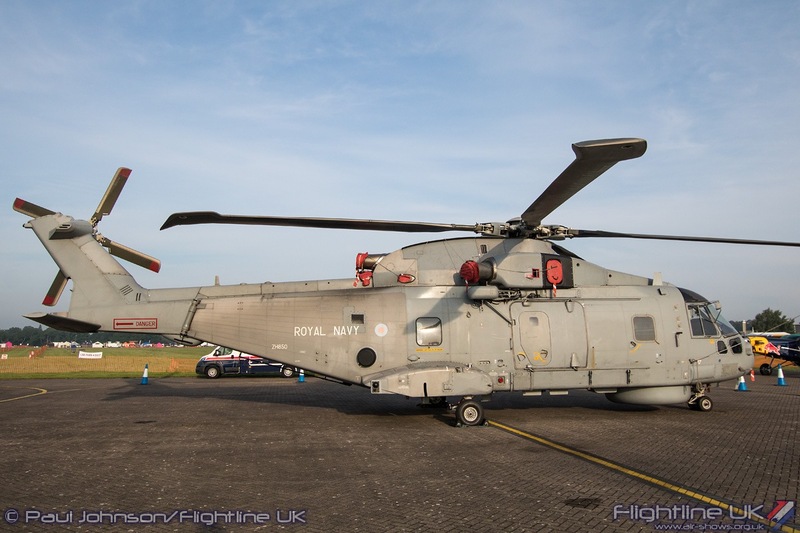 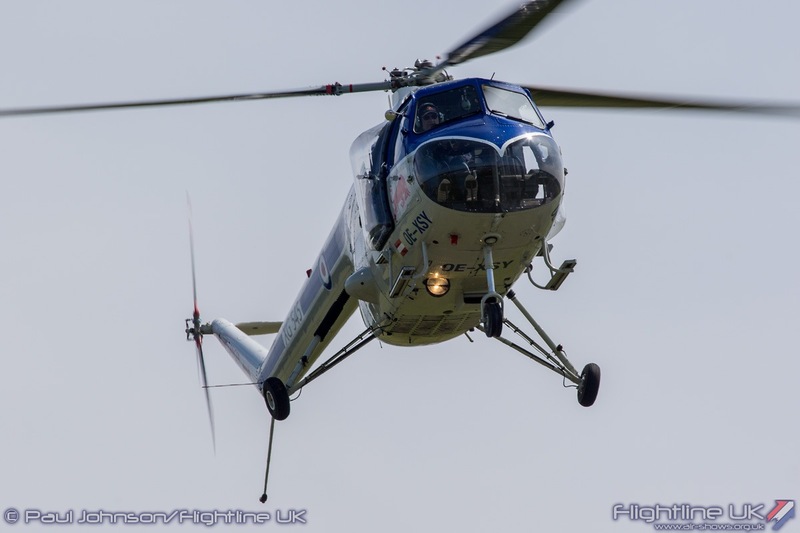 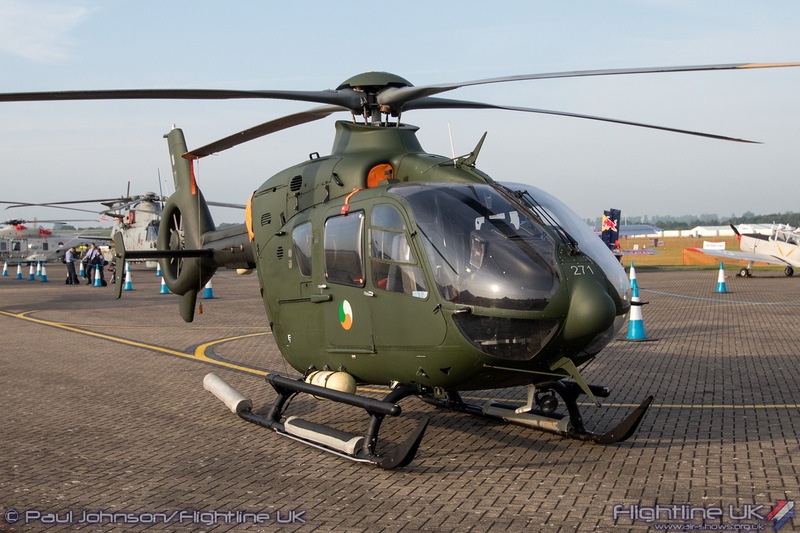 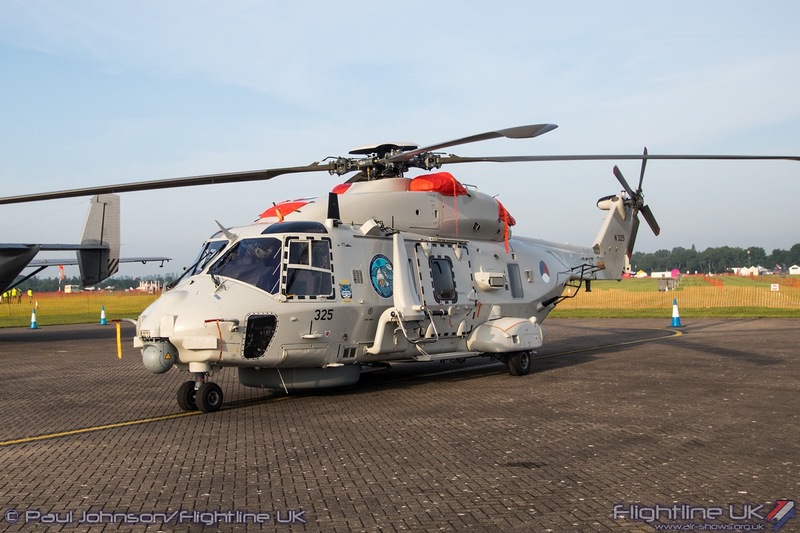 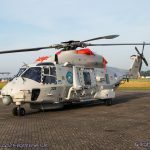 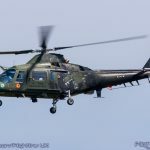 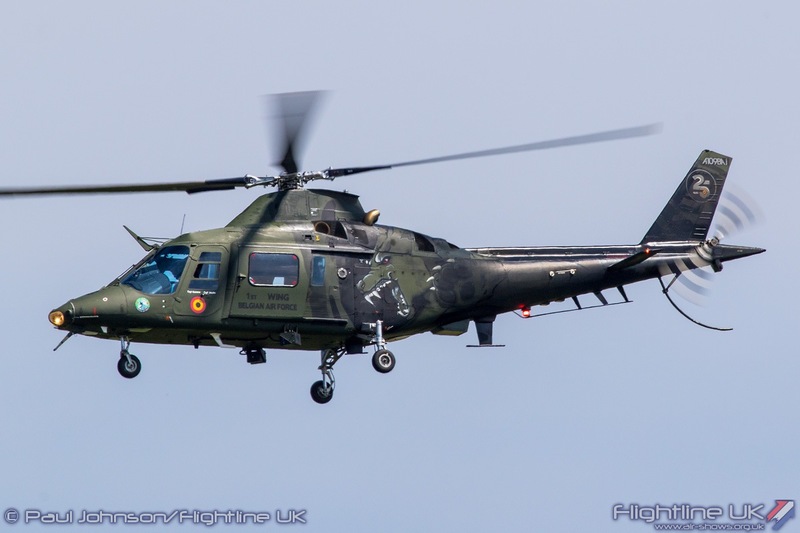 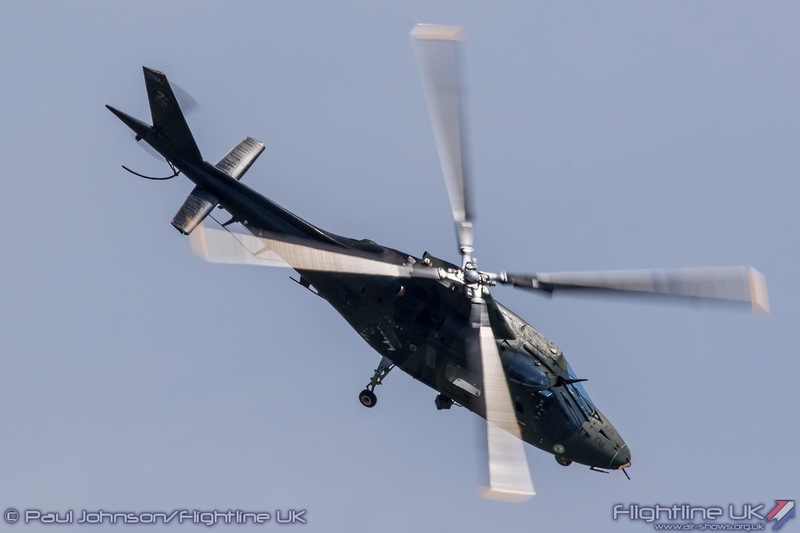 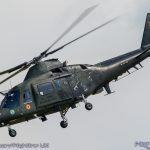 As well as the Royal Air Force aircraft, there were a pair of international visitors including a Irish Air Corps Eurocopter EC135, Royal Netherlands Navy NH Industries NH90NFH and a Polish Navy PZL M-28M1R Bryza. 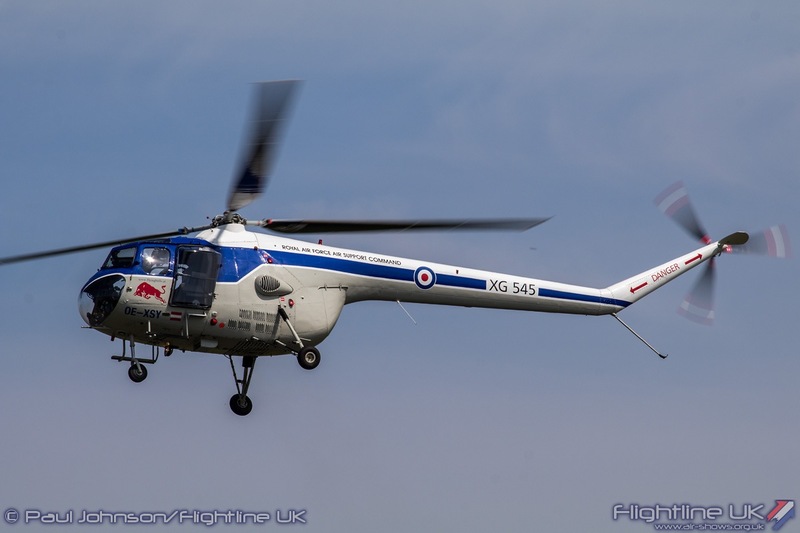 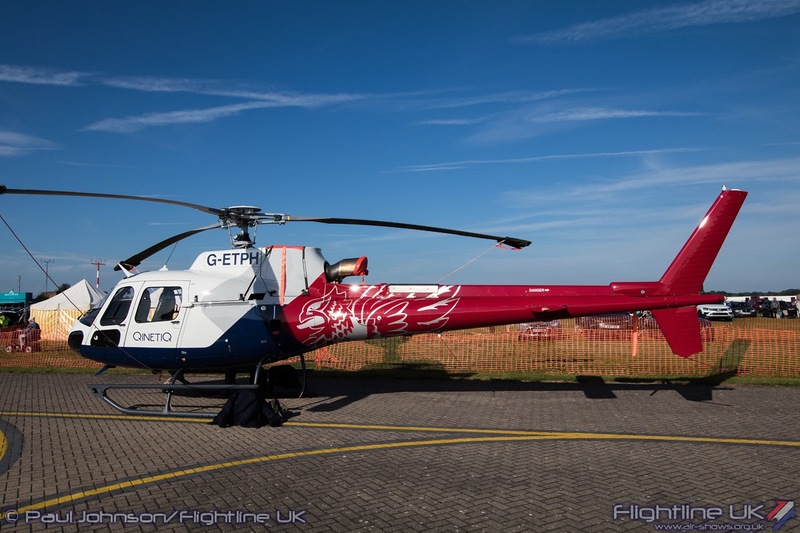 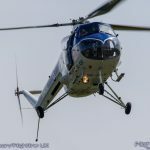 QinetiQ also participated with the UK airshow debut of one of their new Airbus Helicopters H125s in their new corporate livery. 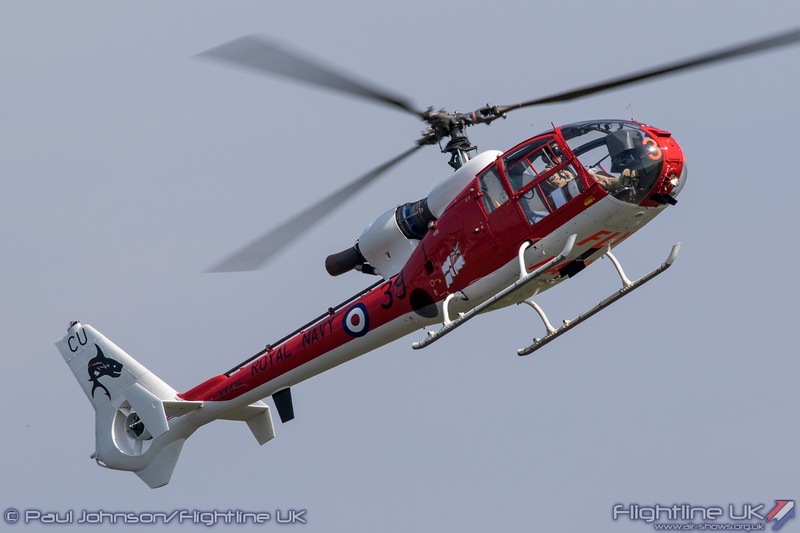 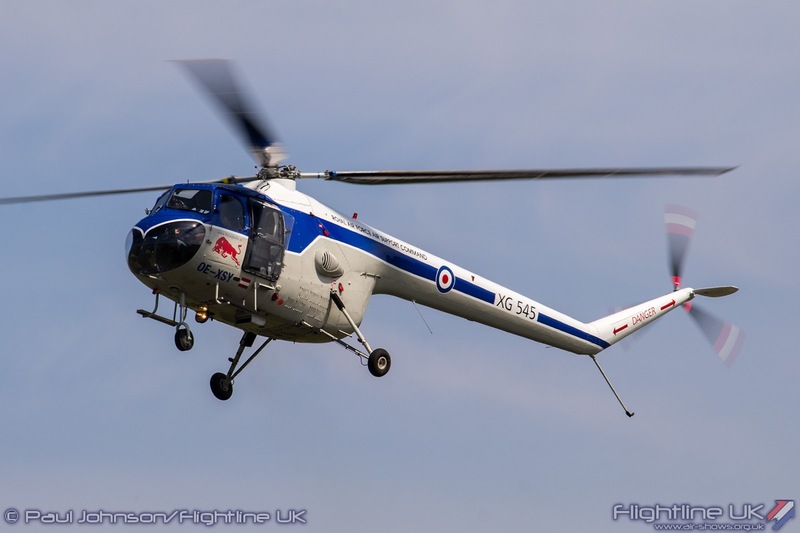 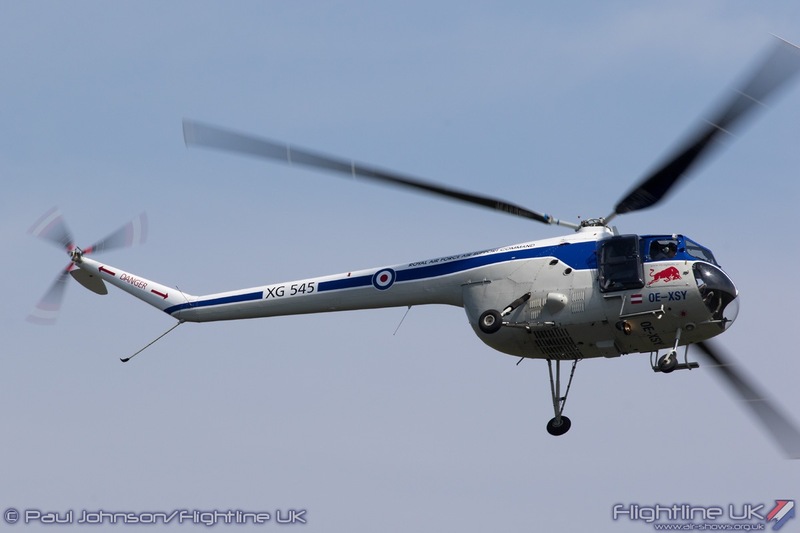 The Royal Navy also participated with a Leonardo Merlin HM2. 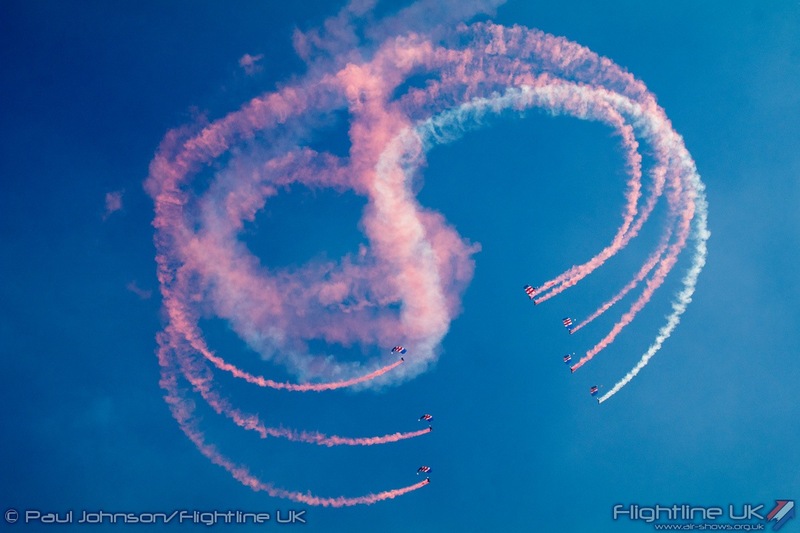 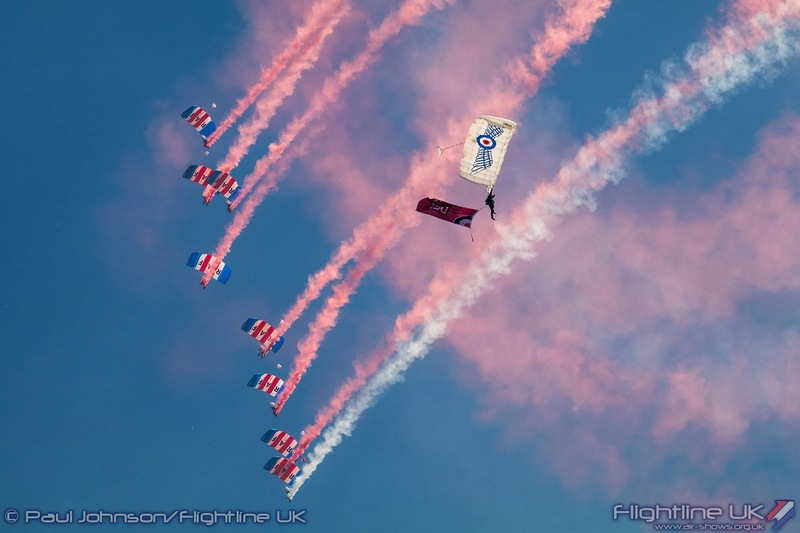 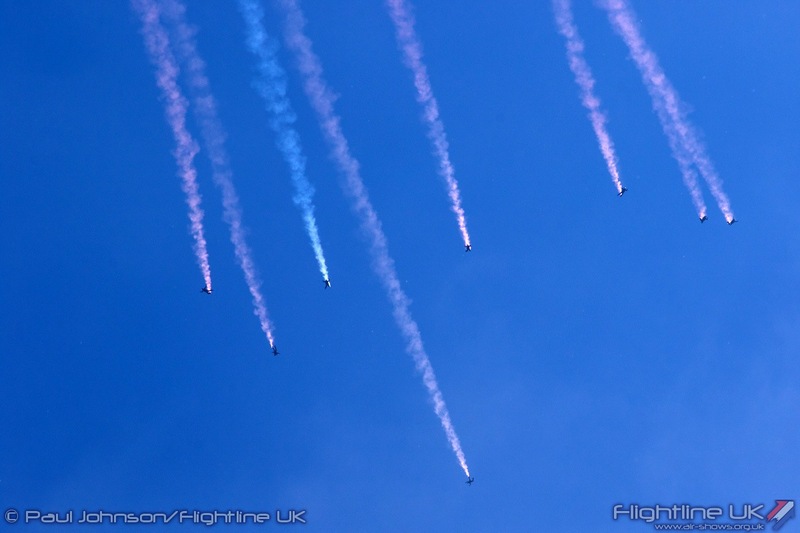 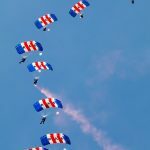 The traditional starting point for a RAF Cosford Air Show flying display is the RAF Falcons Parachute Display Team. 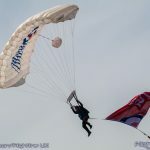 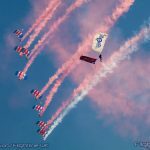 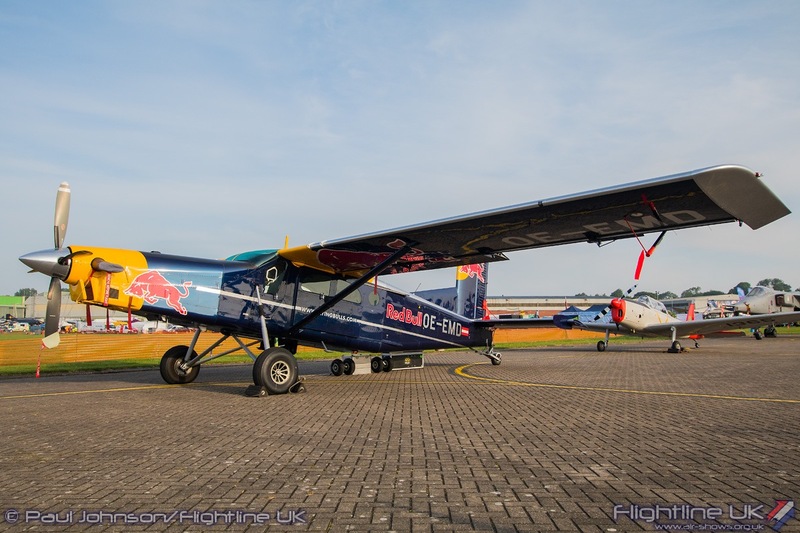 Unusually for Cosford, the weather was superb and the team were able to perform a full display jumping from about 9,000ft so they were able to demonstrate their freefalling skills as well as those under canopy. 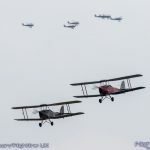 The rest of the flying display though was a cavalcade of RAF history starting from the very origins of the service and running through chronologically to the present day. 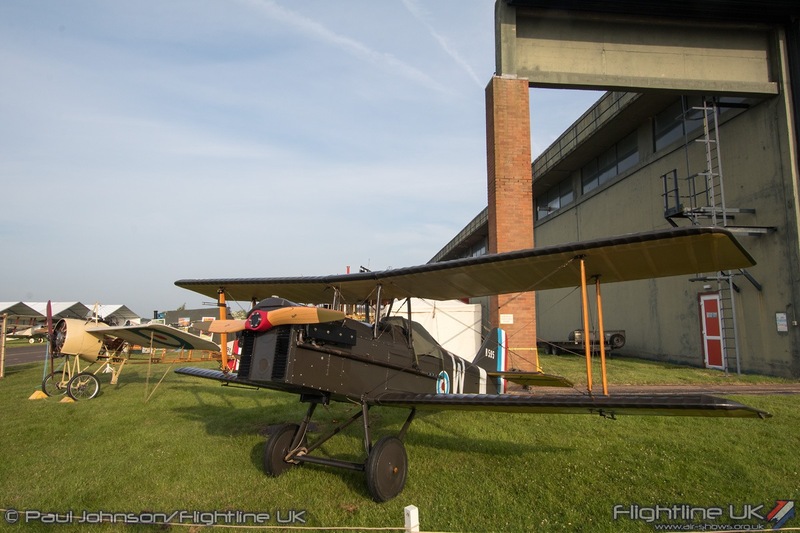 It was certainly an ambitious plan to have such a rigid plan and there must have been a fair amount of relief that the weather was so kind. 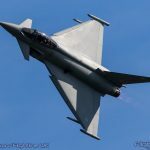 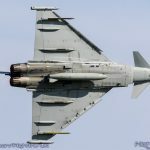 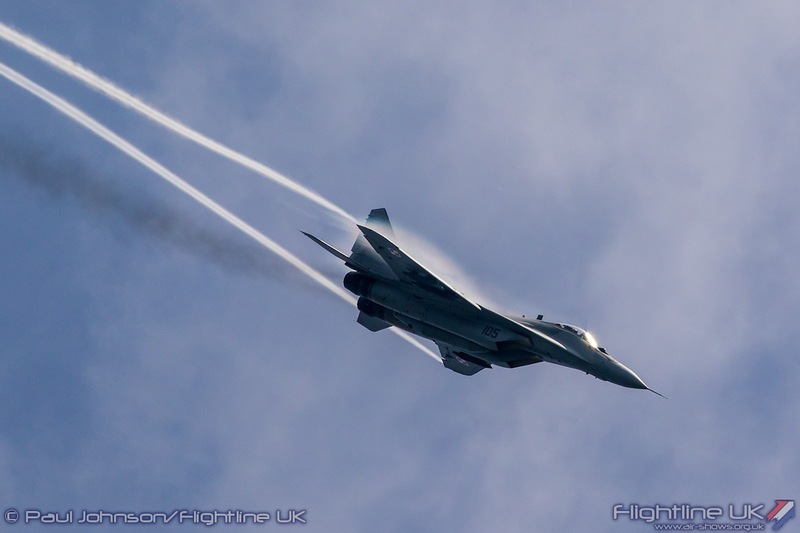 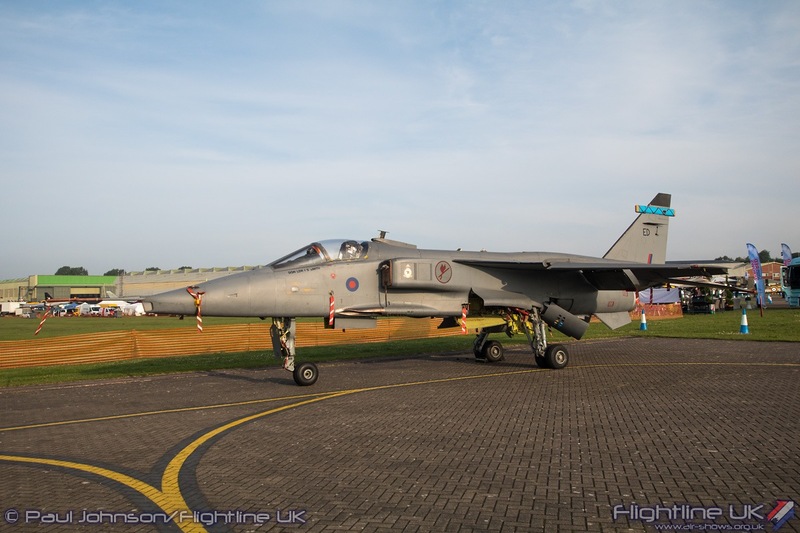 Interspersed with the historic displays were modern day displays from the international air forces demonstrating some of the RAF’s key partnerships through the years. 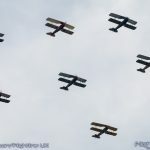 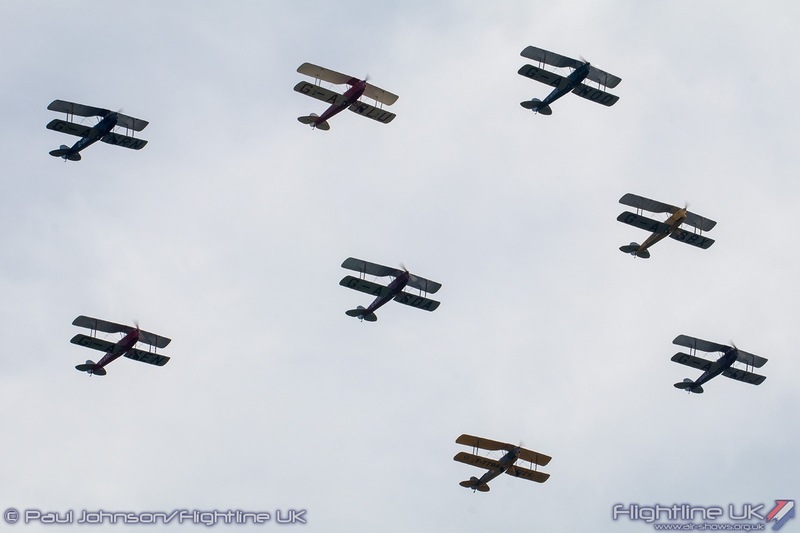 The first historic act to display as the Great War Display Team with a quartet of replicas representing aircraft on charge with the Royal Air Force when it was formed on the 1st April 1918. 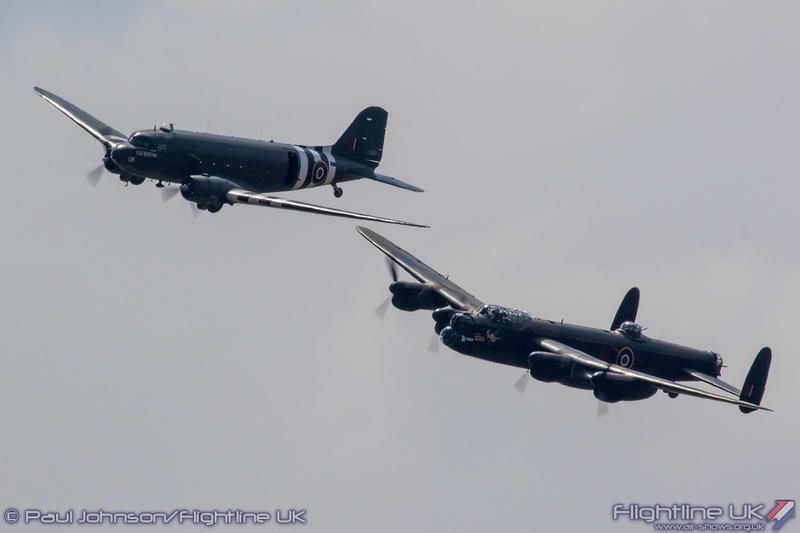 These included a pair of RAF SE5a, the RAF BE2c and the latest addition to the team, the Avro 504K. 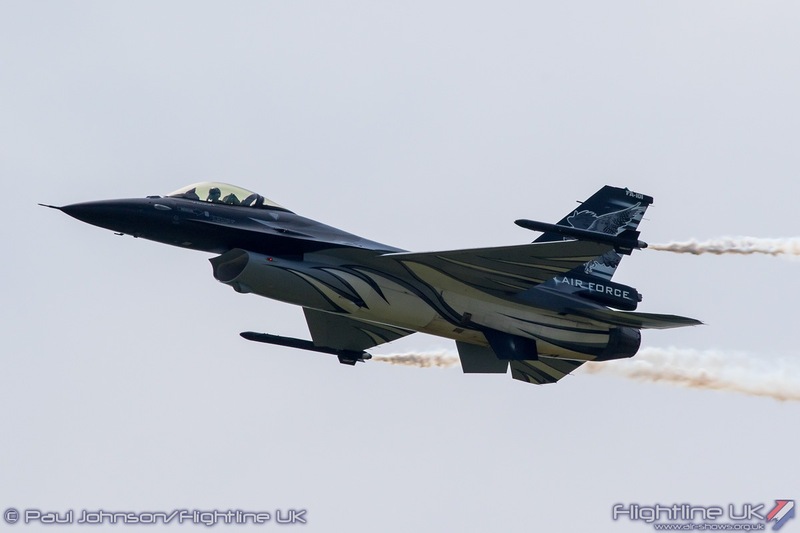 The Great War aircraft were followed in short order by the first international fast jet of the afternoon, the Belgian Air Force Lockheed Martin F-16AM Fighting Falcon. 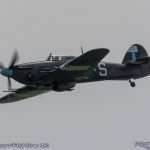 As its position in the timelime suggests, the Belgian military has had a long association with the Royal Air Force dating back to the earliest days of the service. 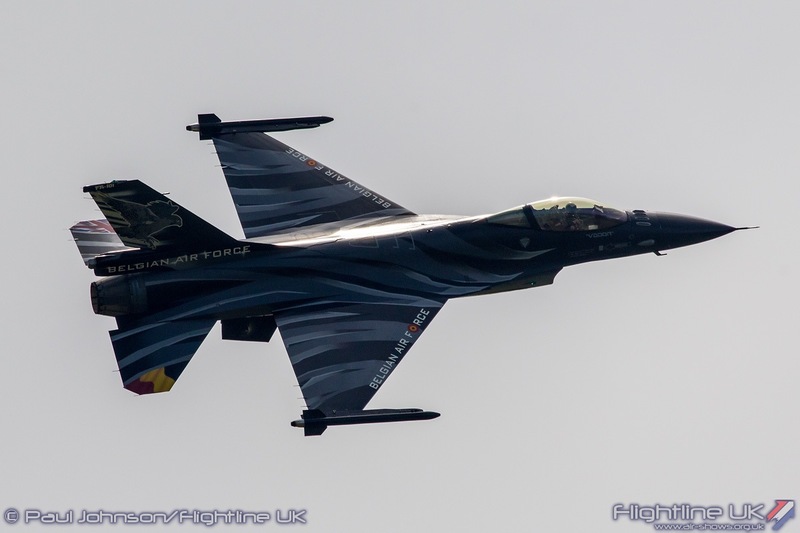 The F-16 display this year comes from Florennes Air Base based 2nd Tactical Wing and is flown by Senior Captain Aviator Stephan ”Vador” Darte. 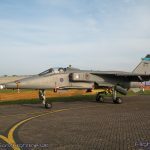 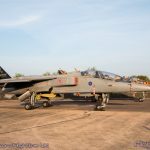 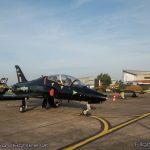 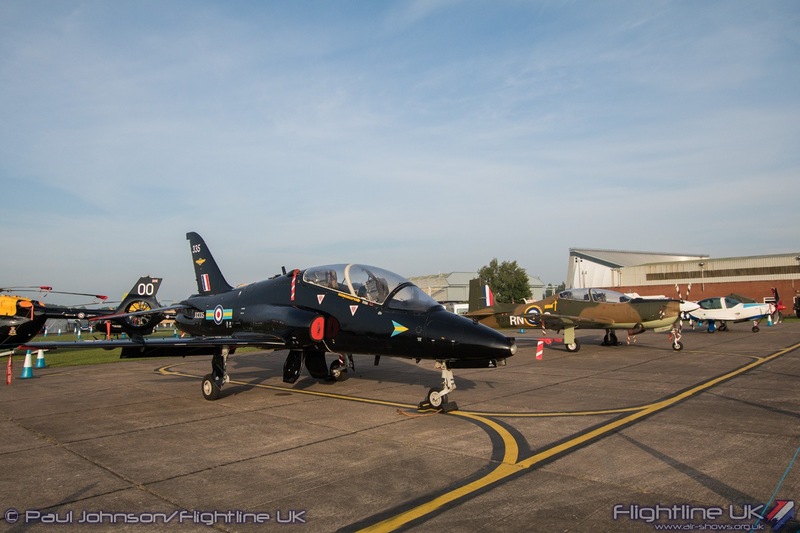 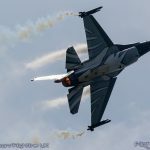 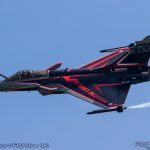 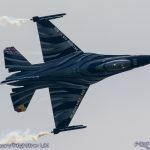 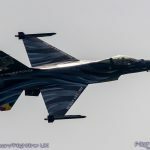 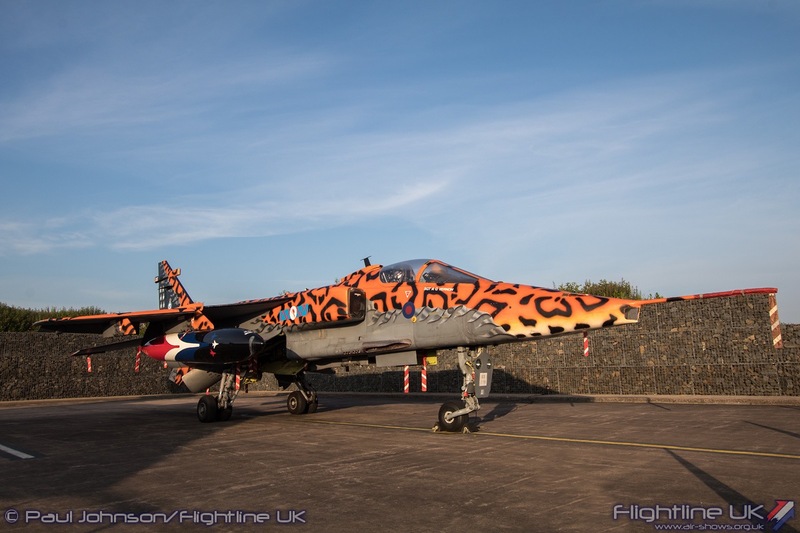 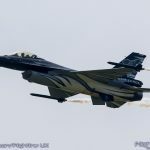 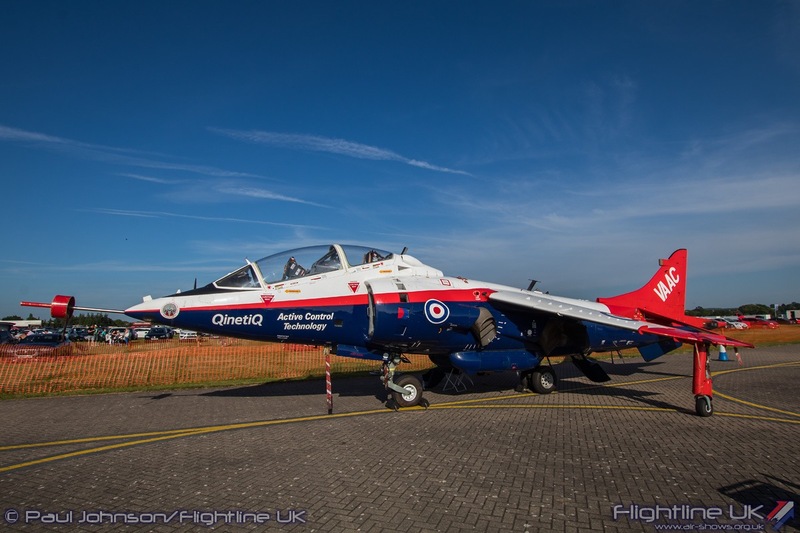 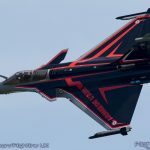 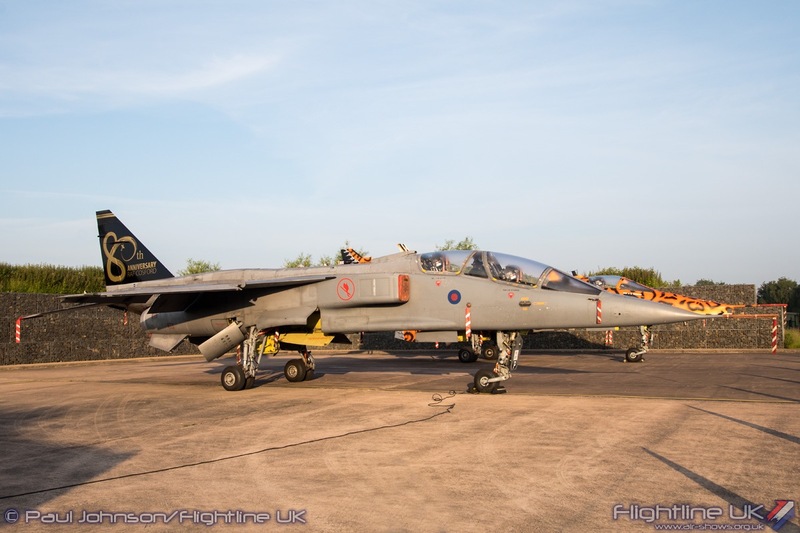 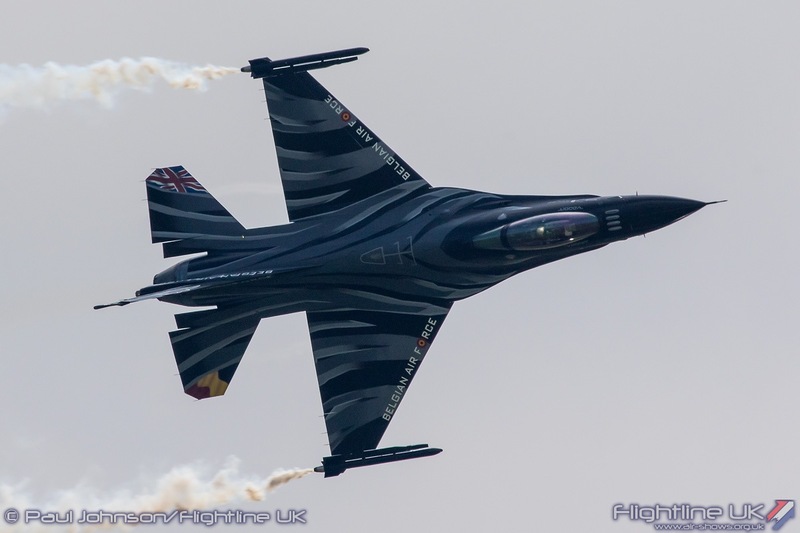 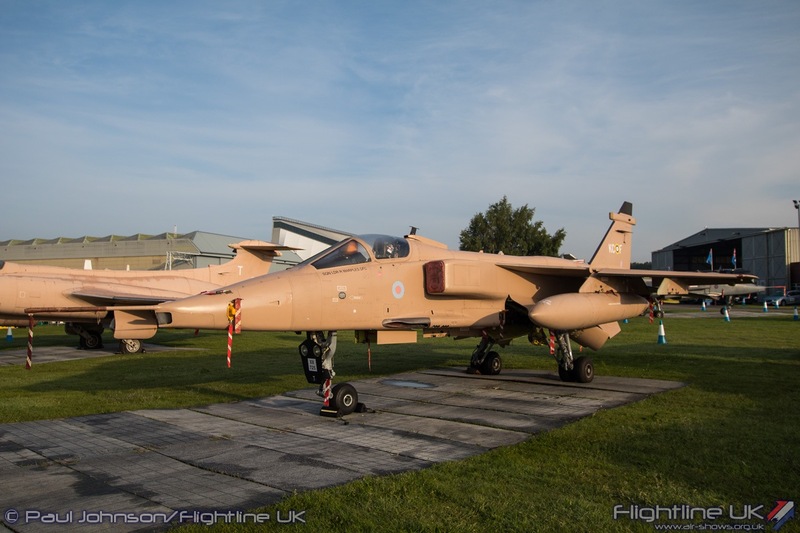 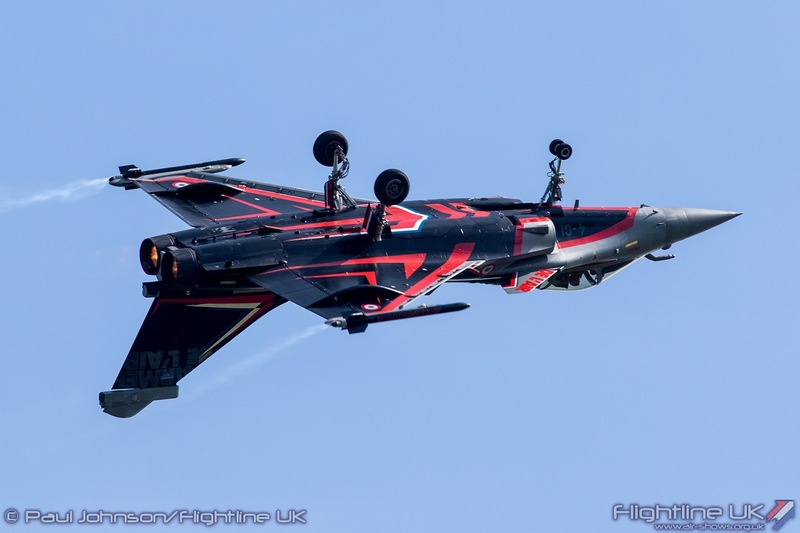 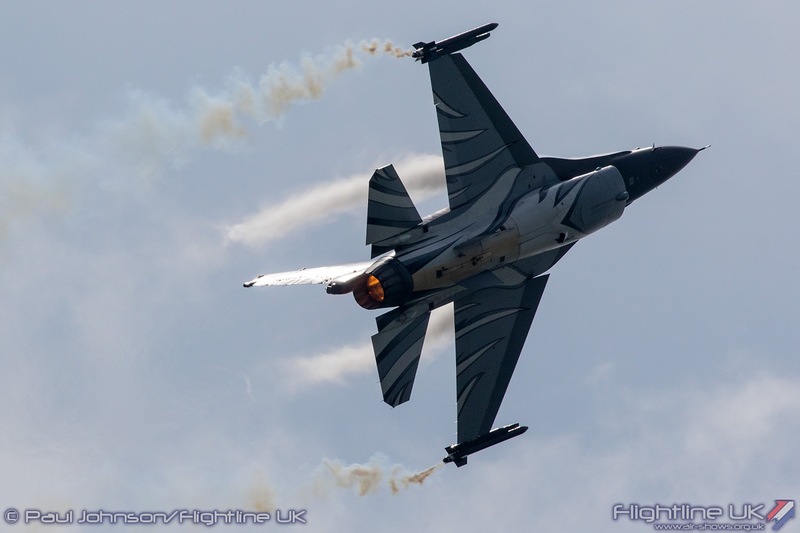 They also have new display aircraft with an impressive special scheme dubbed ‘The Dark Falcon.’ For each display, the aircraft will help mark partnerships with the airshow host nation’s national flag added to the horizontal stabilizers on the jet. 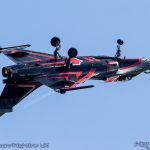 It was Vador’s first public display and he went home with the award for best presented display aircraft. 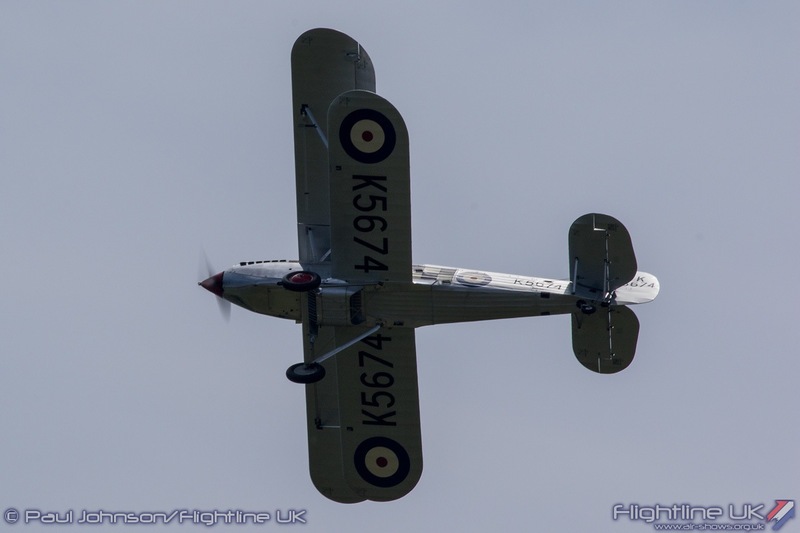 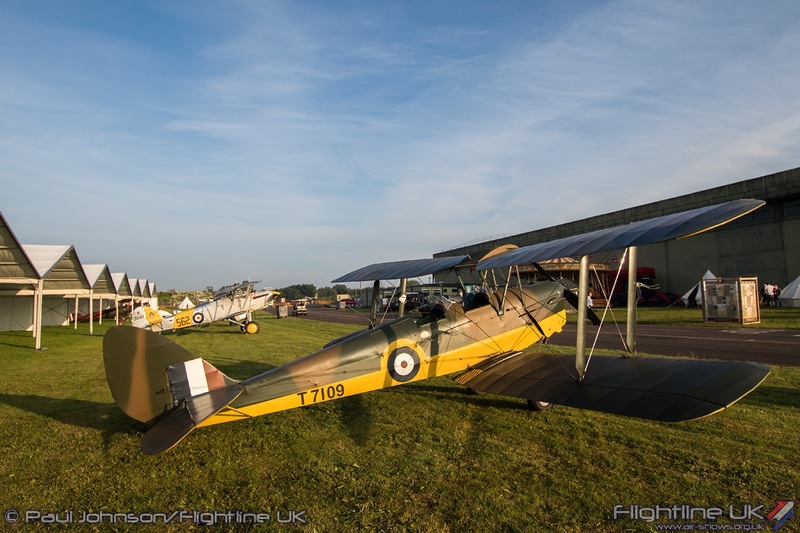 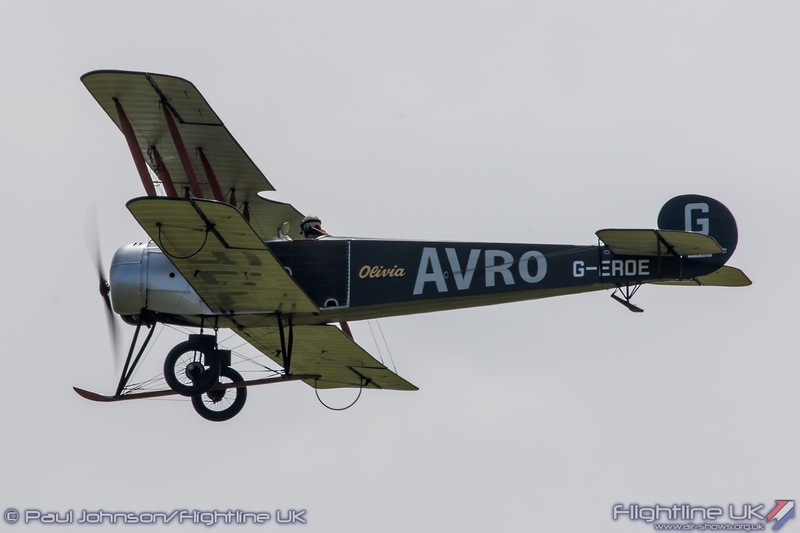 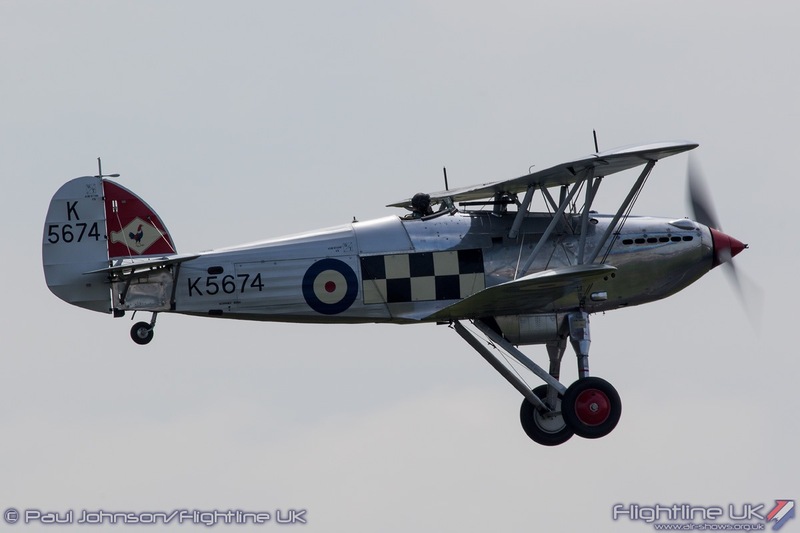 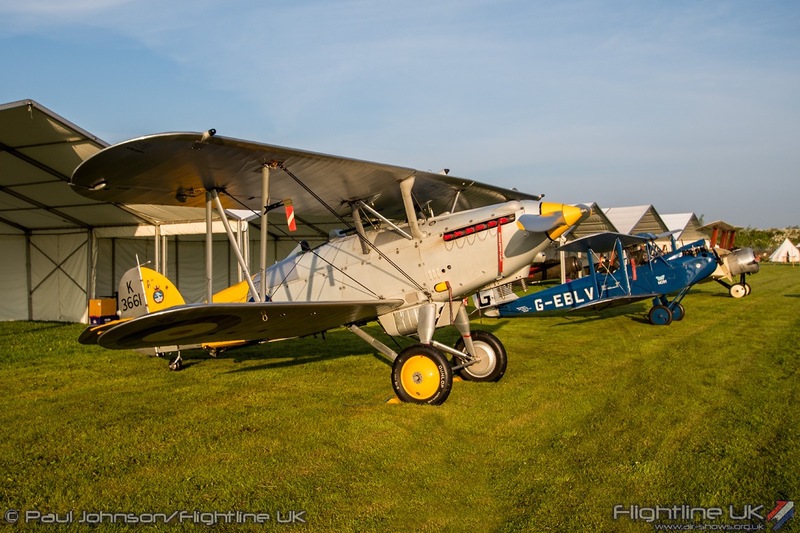 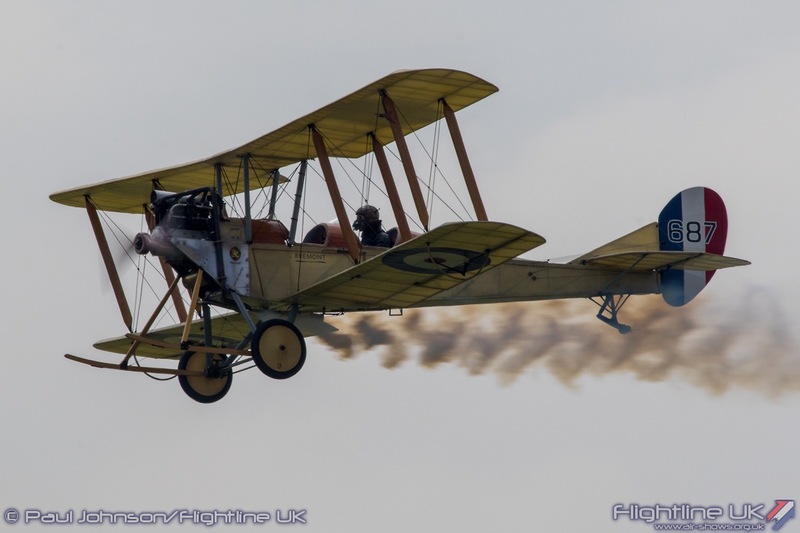 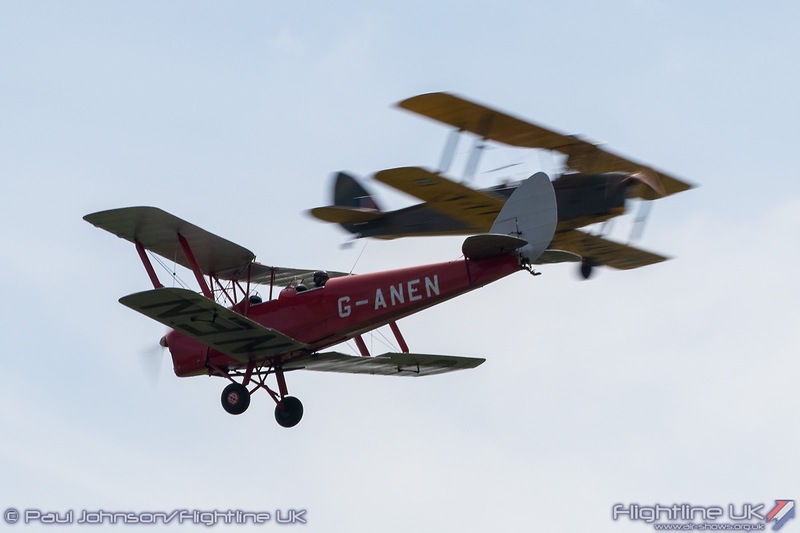 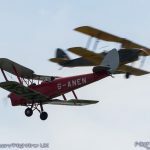 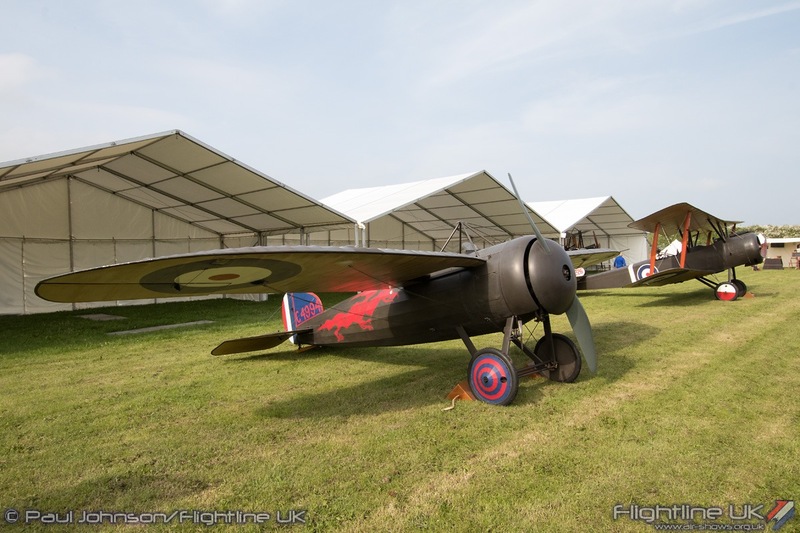 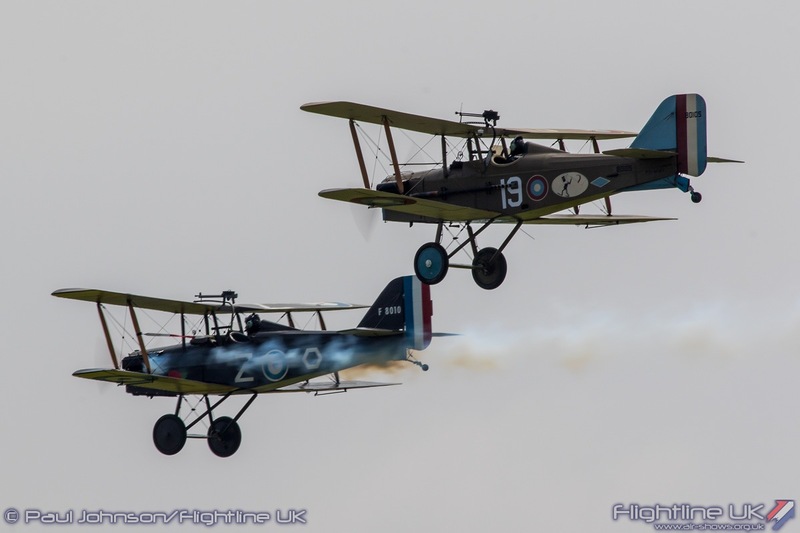 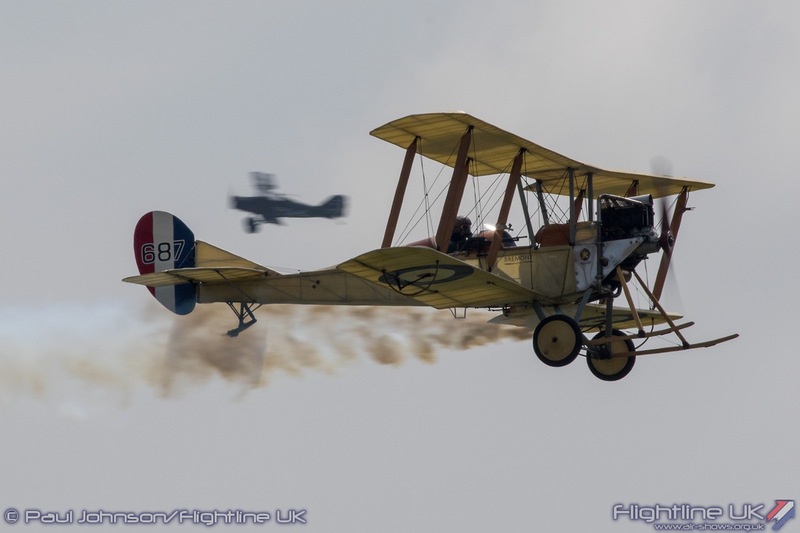 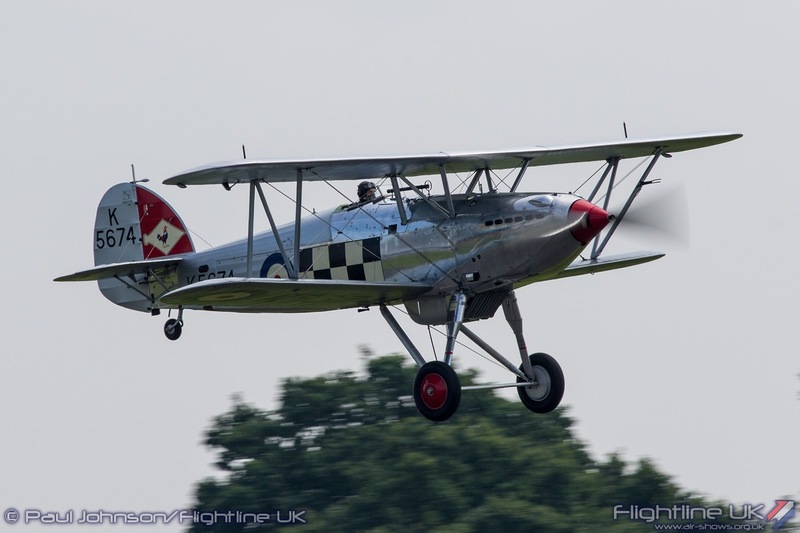 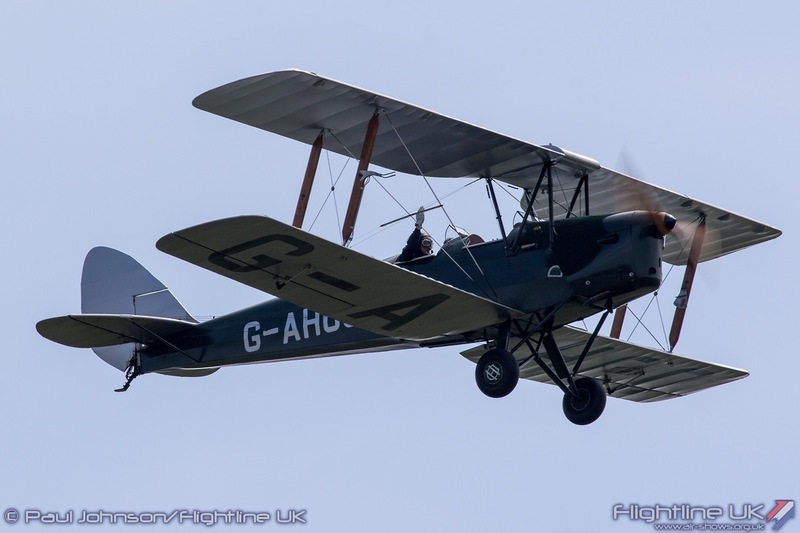 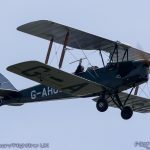 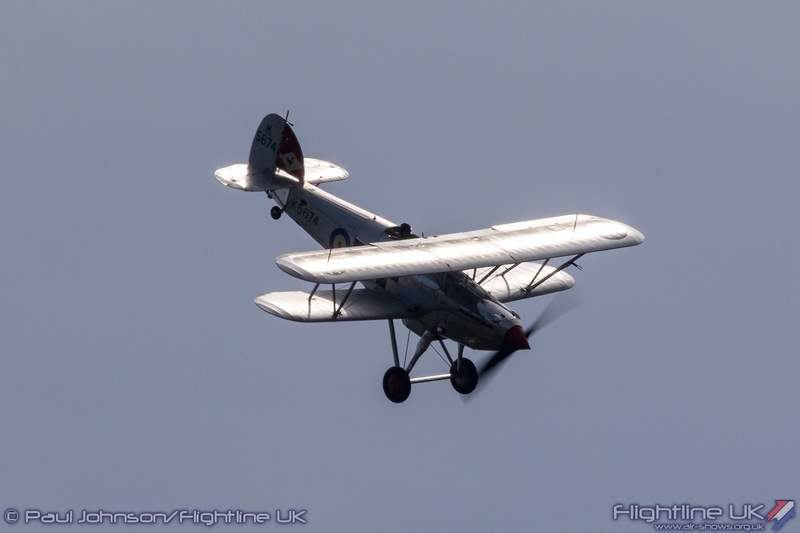 The flying display continued into the 1920’s and 1930’s with displays from the Tiger9 Display Team flying eight de Havilland DH82a Tiger Moths and the Historic Aircraft Collection’s Hawker Fury I. 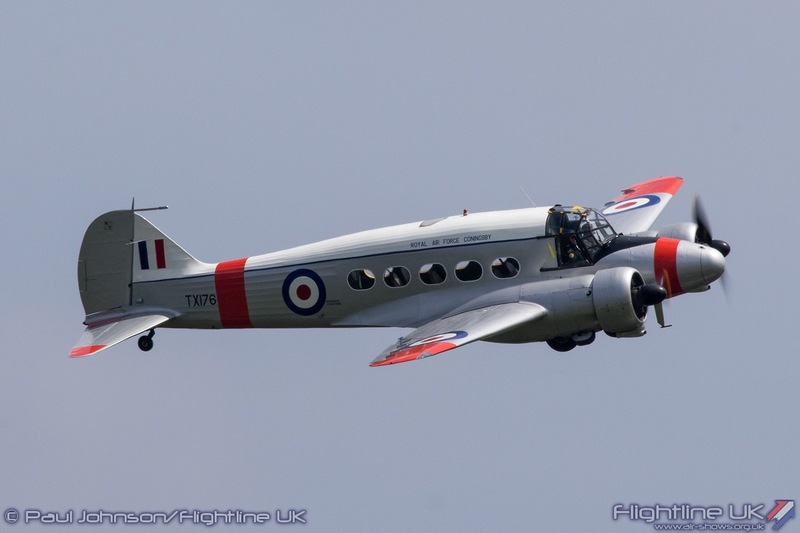 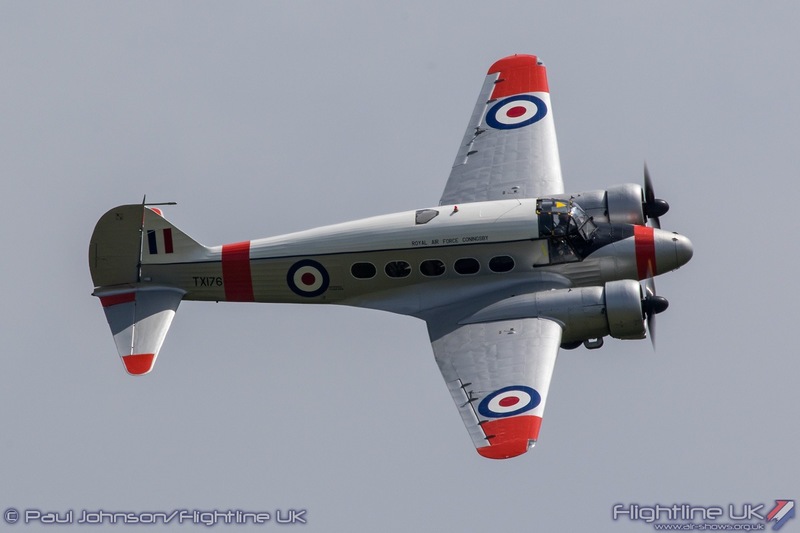 The latter was one of the stars of the afternoon flying display and was flown by Charlie Brown. 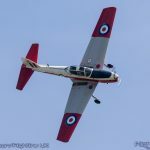 Cosford marked the aircraft’s first ever display away from its base at the Imperial War Museum Duxford and Charlie put it through a very elegant aerobatic routine to close the “Policing the Empire” theme. 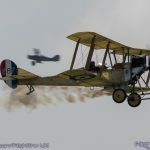 The “World at War” started with a real flourish. 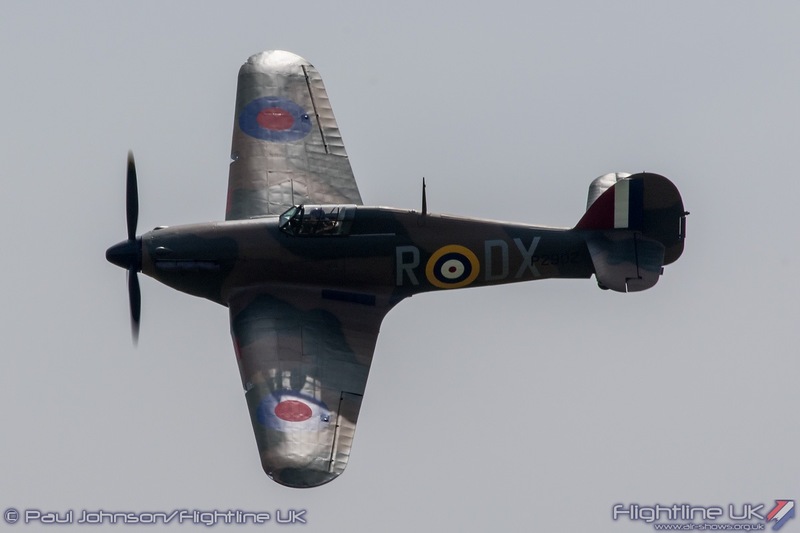 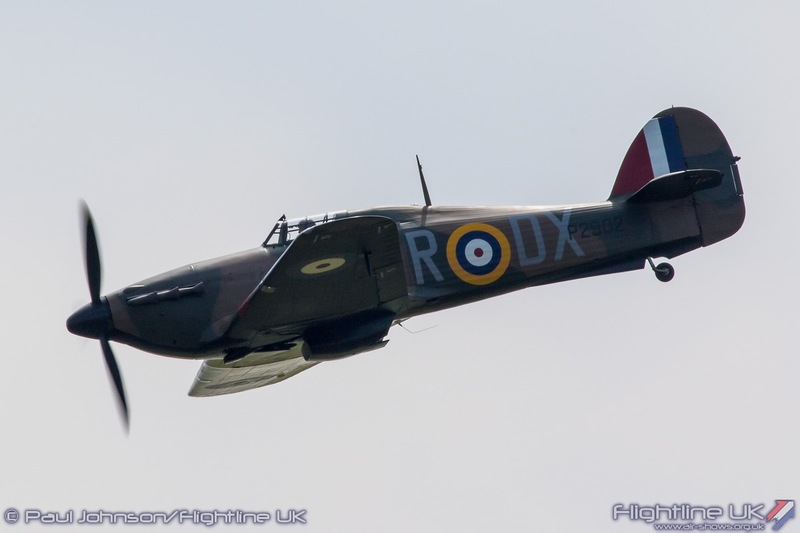 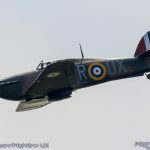 Neatly following the Fury in the air was Anglia Aircraft Restoration’s Hawker Hurricane I P2902/G-ROBT flown by Dave Puleston. 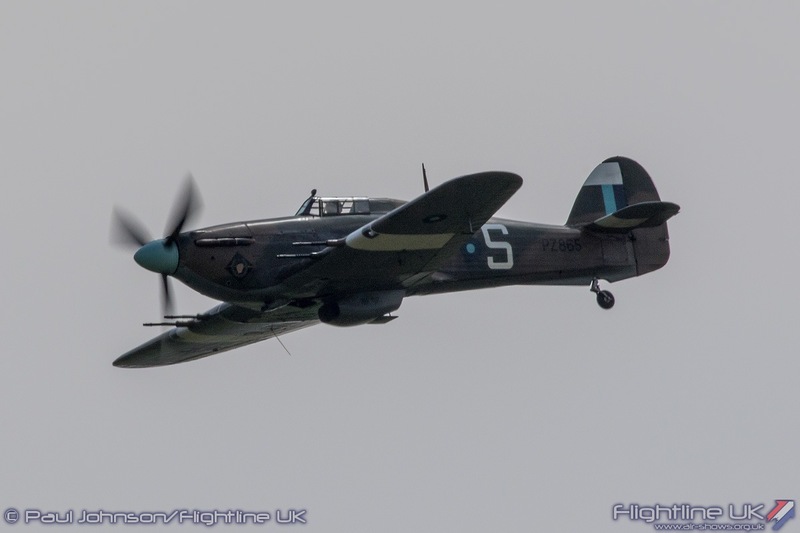 The Hurricane project started off as a monoplane development of the Fury so was the perfect link between themes. 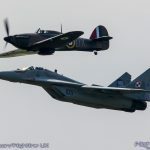 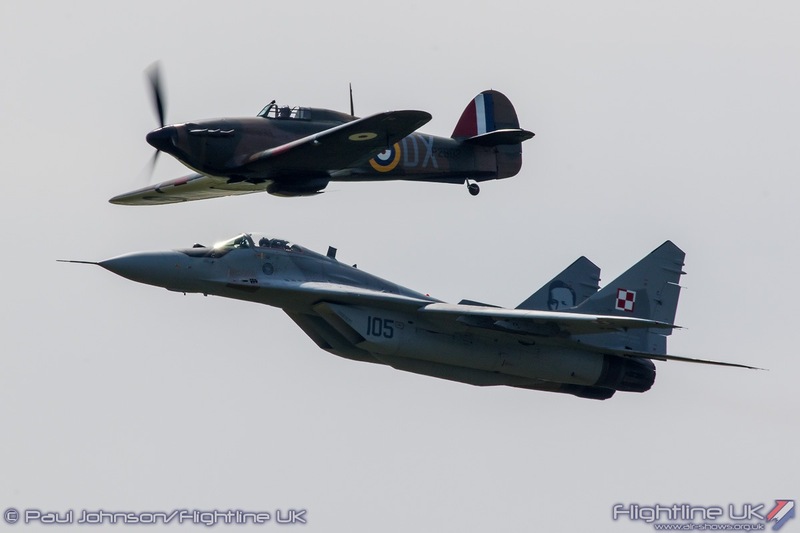 Following a very smooth solo aerobatic routine, the Hurricane flew off to the hold only to return in formation with the Polish Air Force’s Mikoyan-Gurevich MiG-29 Fulcrum for a very memorable and unique formation flypast – surely one of the airshow moments of the summer. 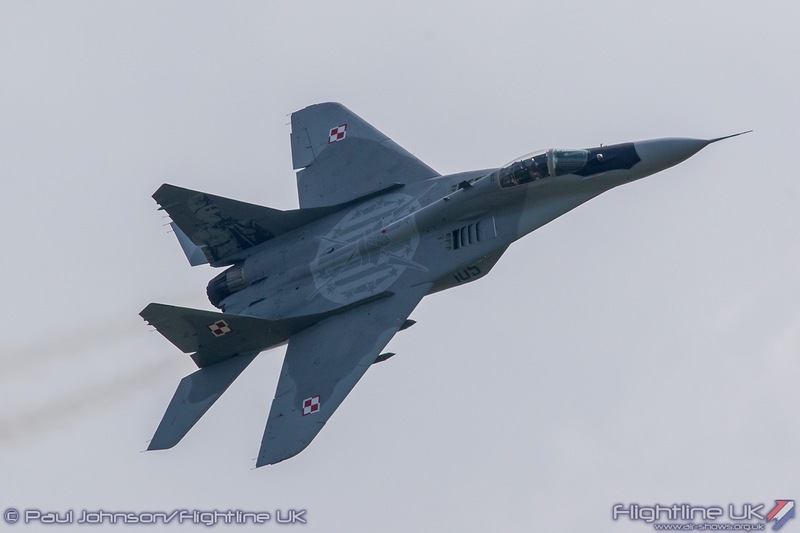 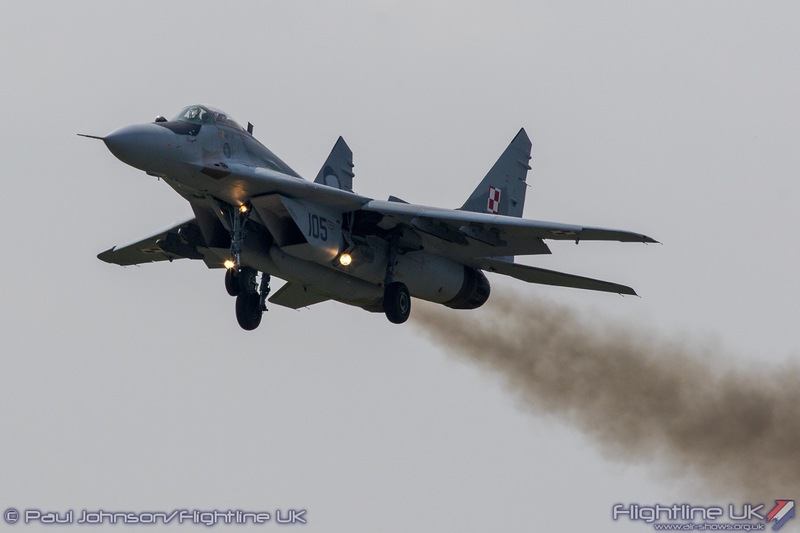 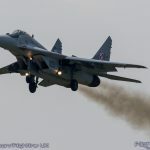 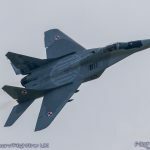 As always, the MiG gave a very powerful solo performance following its arrival with the Hurricane. 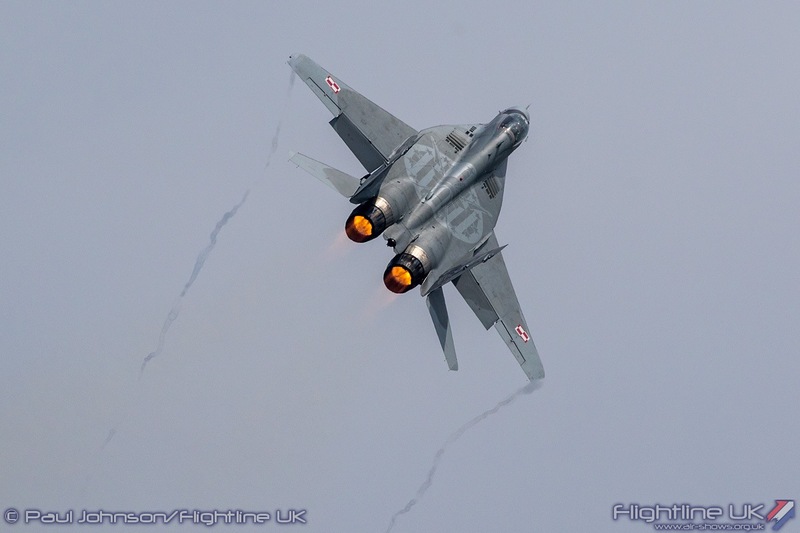 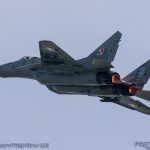 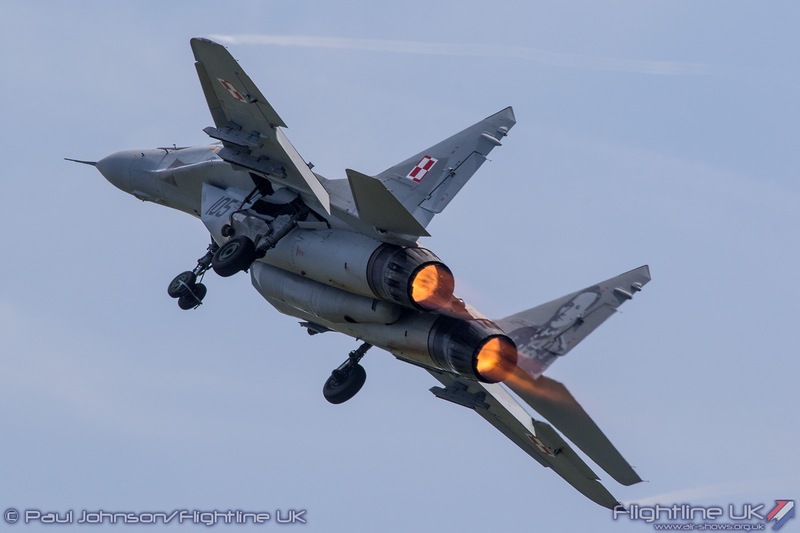 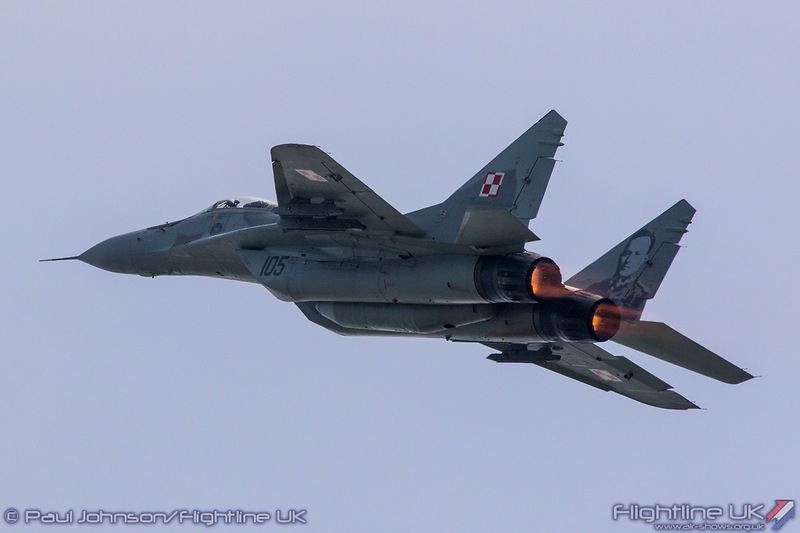 The ties between the Royal and Polish Air Forces are very strong thanks to the actions of the Free-Polish RAF squadron during the Second World War so the presence of the Polish Air Force which also celebrates its anniversary in 2018 was very much appreciated. 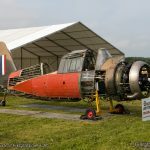 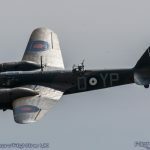 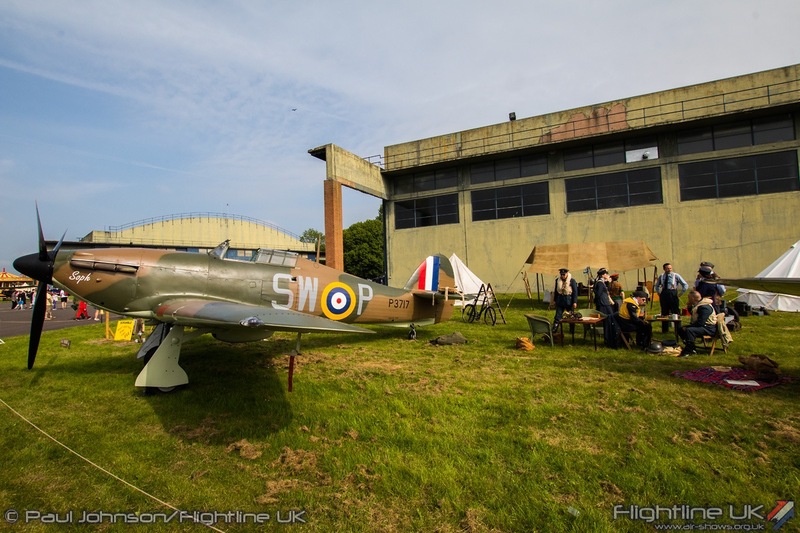 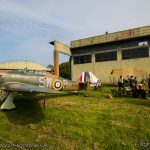 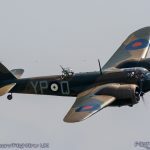 The World at War theme continued apace with displays from the Aircraft Restoration Company’s Bristol Blenheim 1F, the Hangar 11 Collection Supermarine Spitfire PRXI and the BAE Systems Heritage Flight’s Avro C19 Anson. 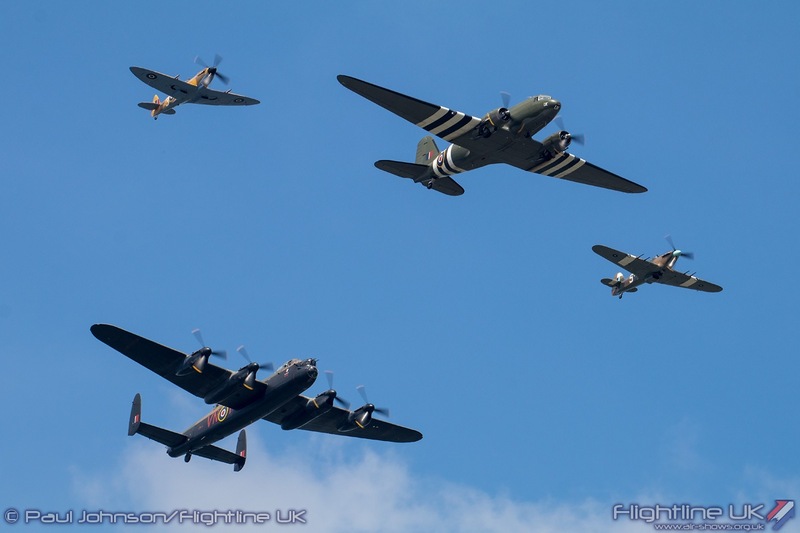 A further international military display marked the large contribution nations of the commonwealth made to the Royal Air Force during the Second World War; it was also the furthest travelled participant. 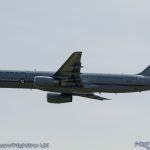 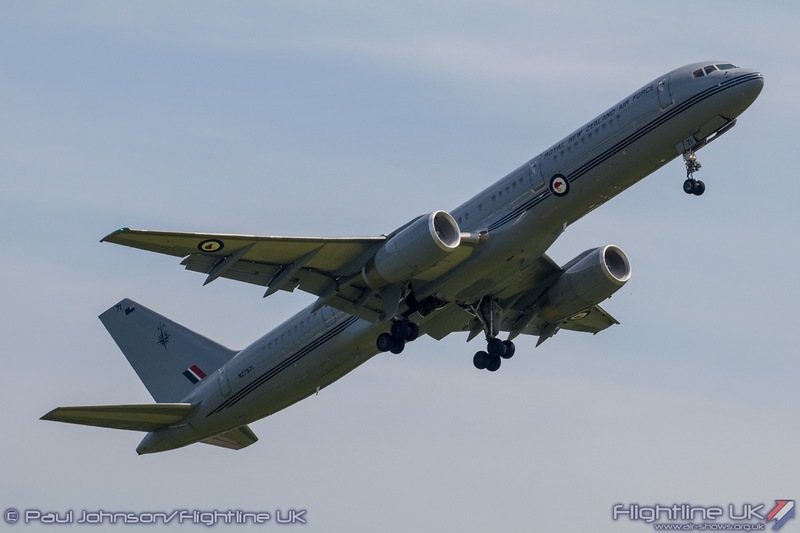 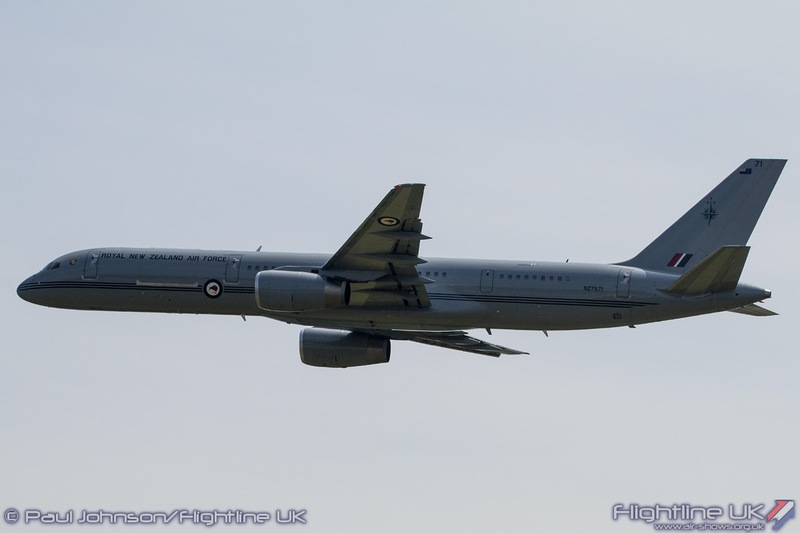 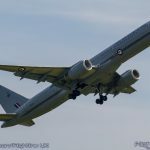 This was the Boeing 757-2K2 from the Royal New Zealand Air Force. 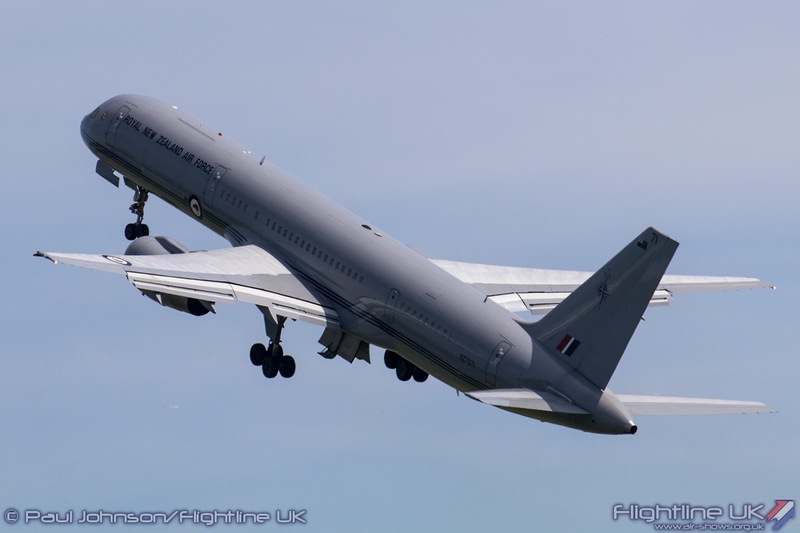 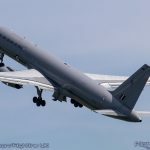 RNZAF Boeing 757 displays are truly dramatic showing off the airliner at close quarters both at slow and high speed. 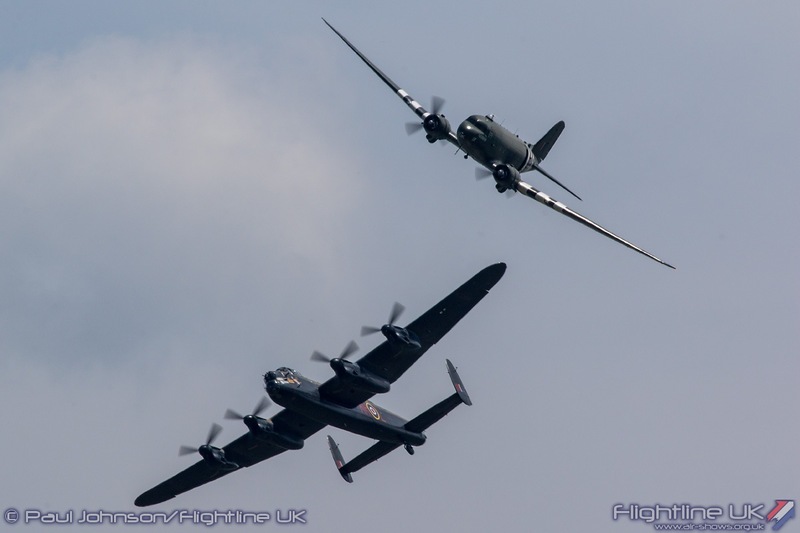 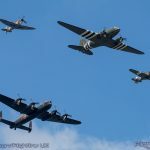 The finale to the Second World War flying was the Royal Air Force Battle of Britain Memorial Flight which gave the first full public display debut of Trenchard Formation at Cosford with the Douglas Dakota III leading the Avro Lancaster B1, Supermarine Spitfire IX and Hawker Hurricane IIc. 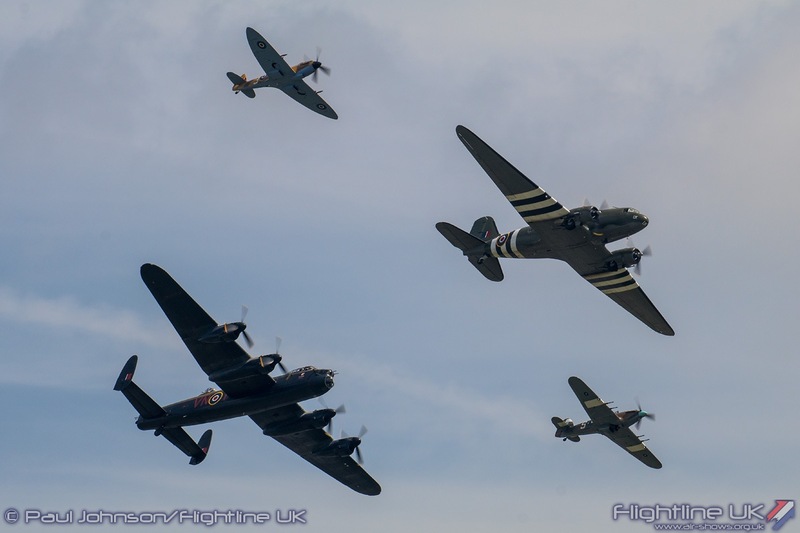 The special anniversary formation displays by the BBMF are always very special and ‘Trenchard’ is no different being a very worthy salute to all past and current members of the Royal Air Force. 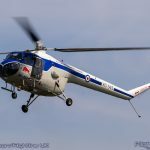 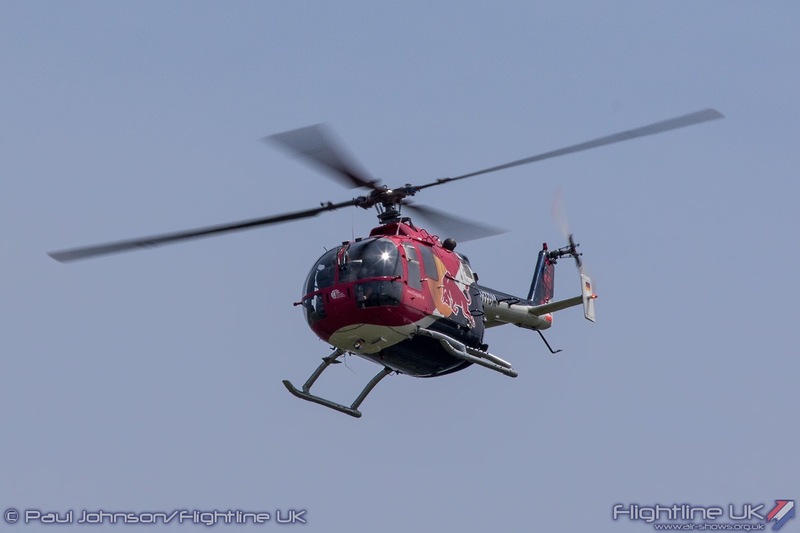 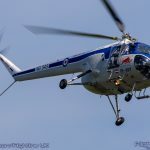 The only break from the historical timeline in the flying display was an appearance by the MBB Bo-105C from the Flying Bulls. 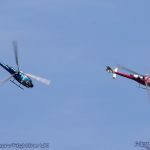 This is a truly remarkable display of helicopter aerobatics that you will see perform by no other display. 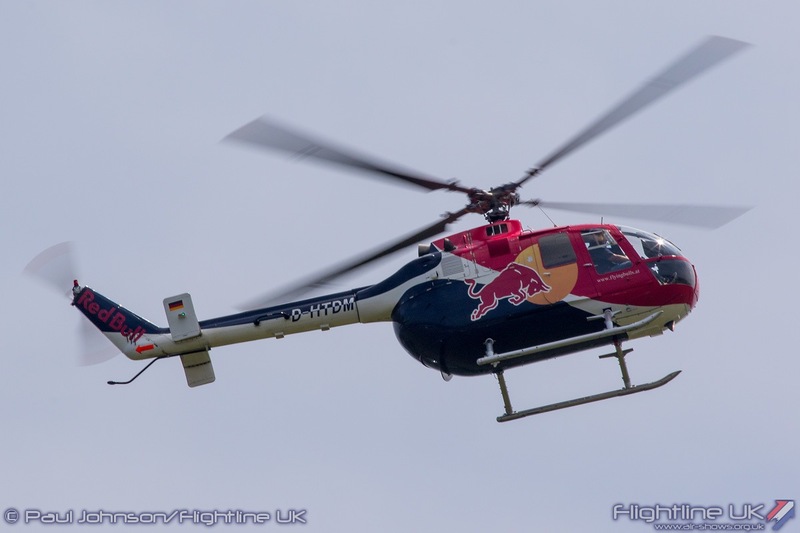 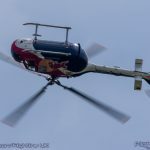 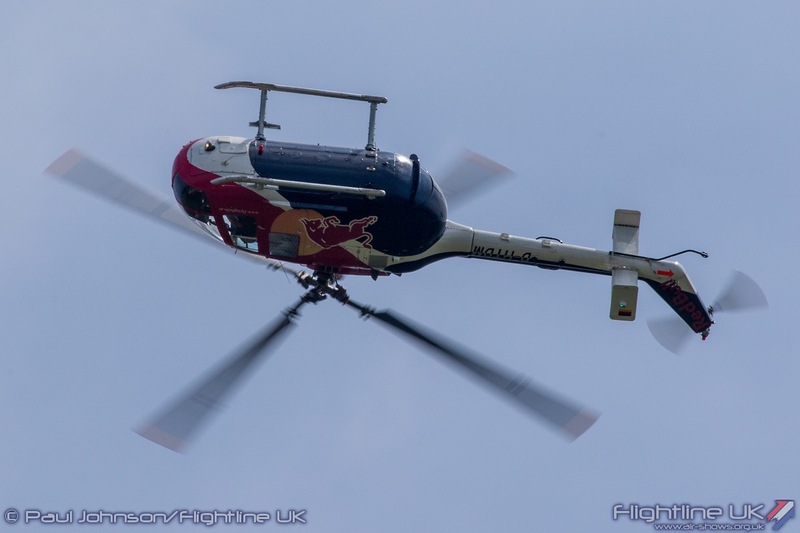 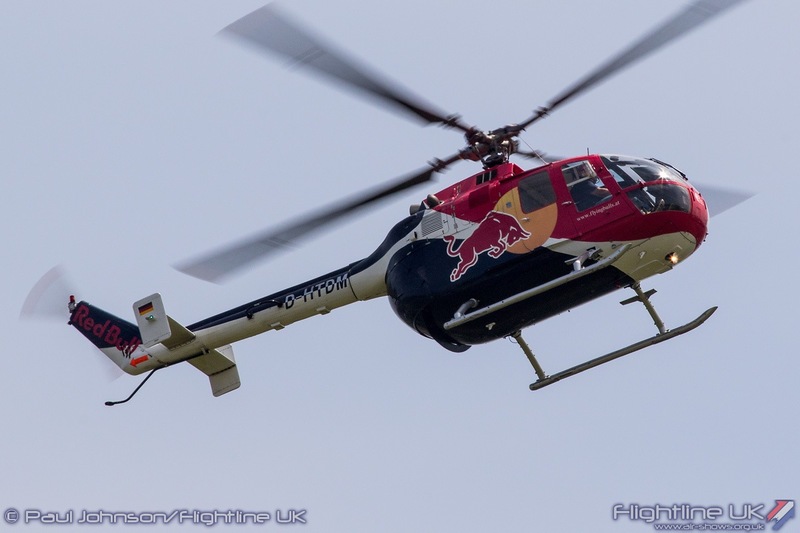 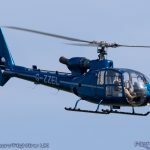 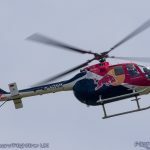 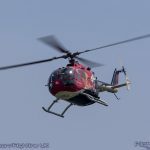 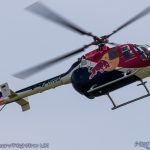 Siegfried “Blacky” Schwarz’s unbelievable routine sees the Bo-105C loop, roll, gyrate and even cartwheel around the sky! 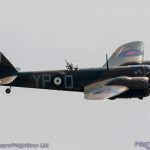 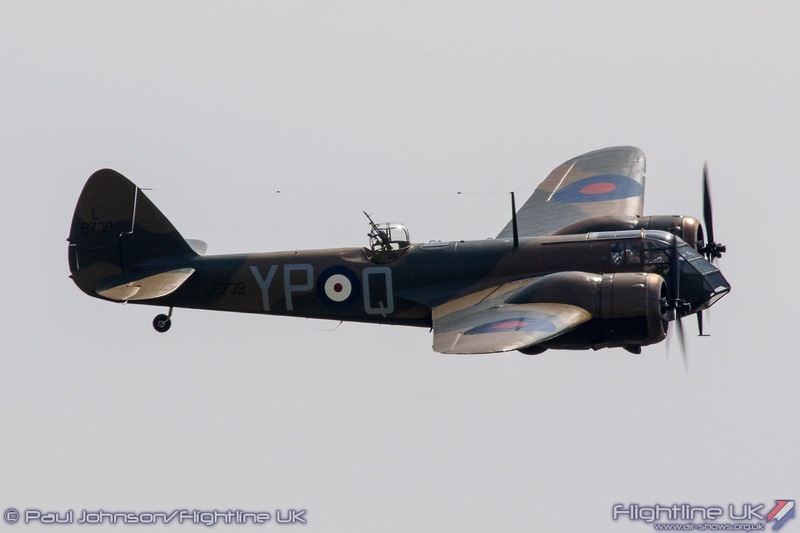 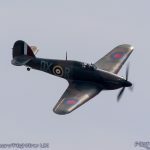 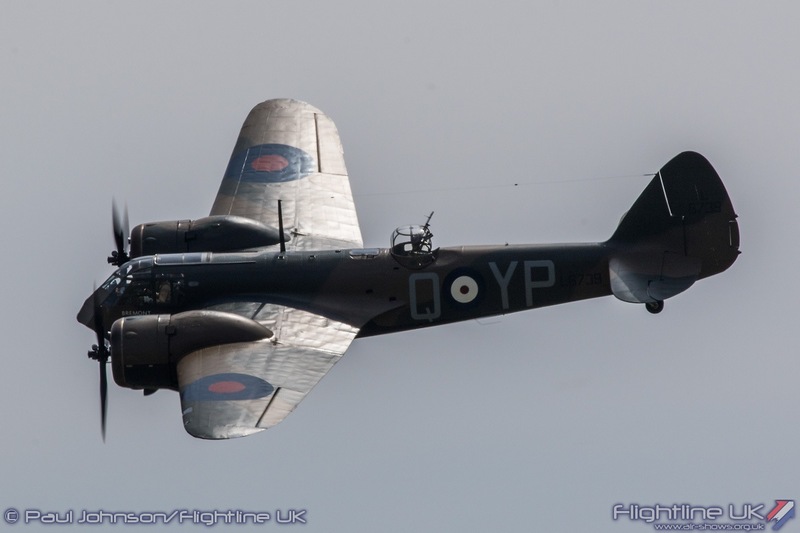 While it may have been an imposter to the RAF story, it was still a great display and one that the crowd really enjoyed. 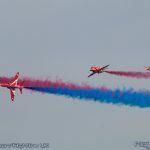 Personally, my favourite section of the flying display was the ‘Age of Uncertainty’ tableaux. 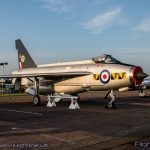 Cold War classics seem to be a rare feature of flying displays these days but Cosford had a wide variety of displays to cover the period. 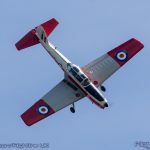 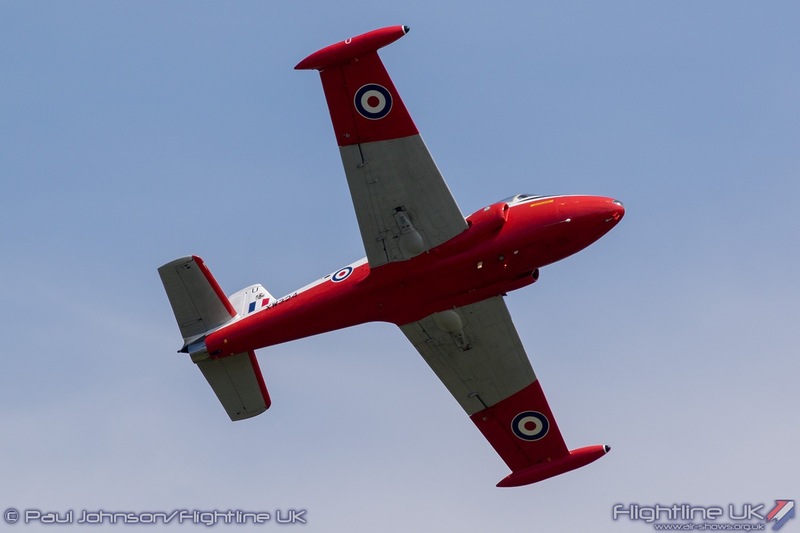 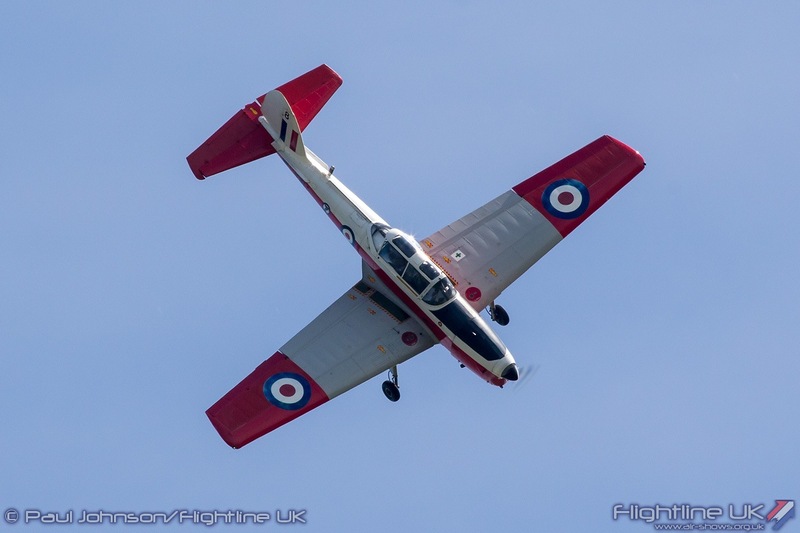 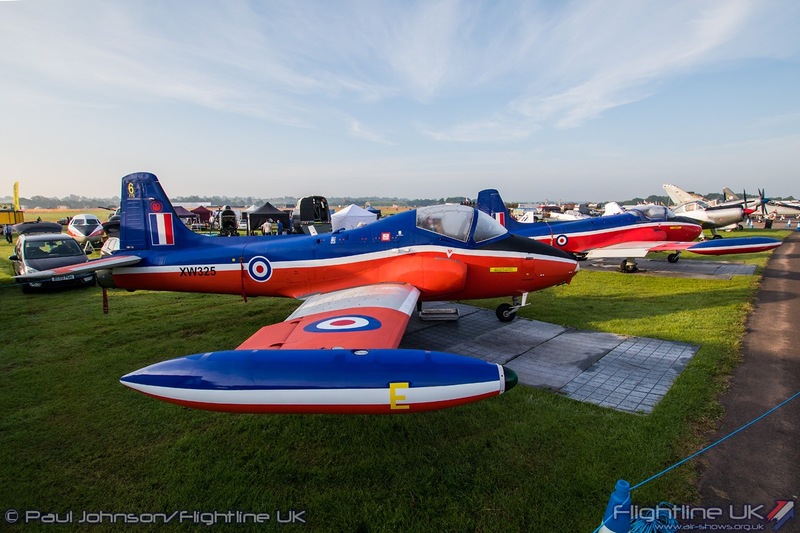 There were some really nostalgic displays by fixed wing types including Jon Higgins flying a solo routine in a de Havilland Canada Chipmunk T10, Mark Stott’s Percival Pembroke C1 and Chelvin Hibbert demonstrating Jeff Bell’s BAC Jet Provost T5. 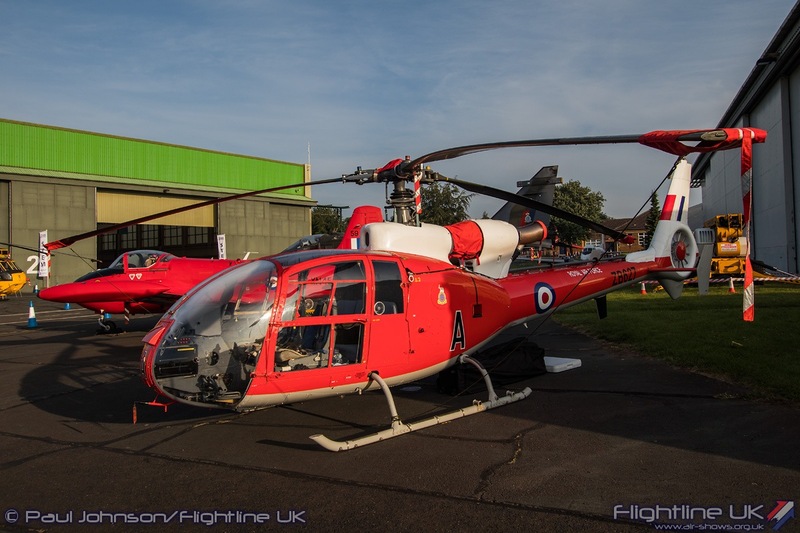 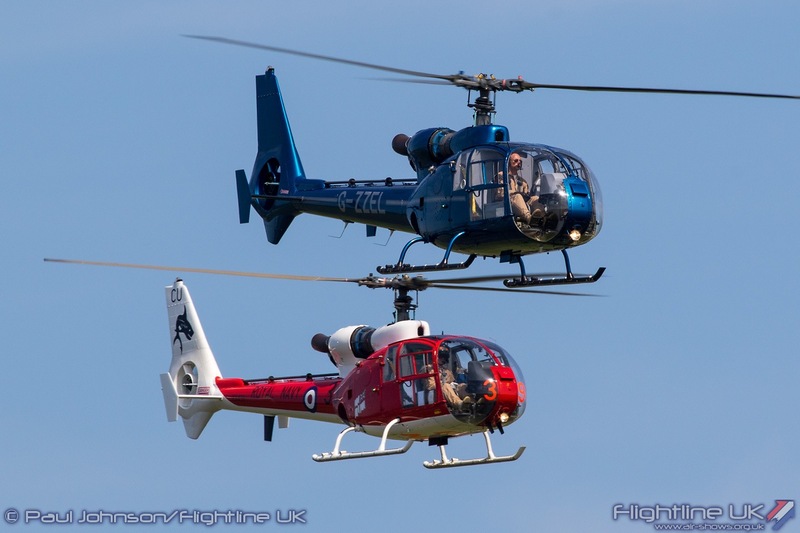 It was however the line-up of vintage helicopters the marked Cosford’s cold war salute out. 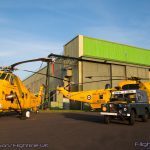 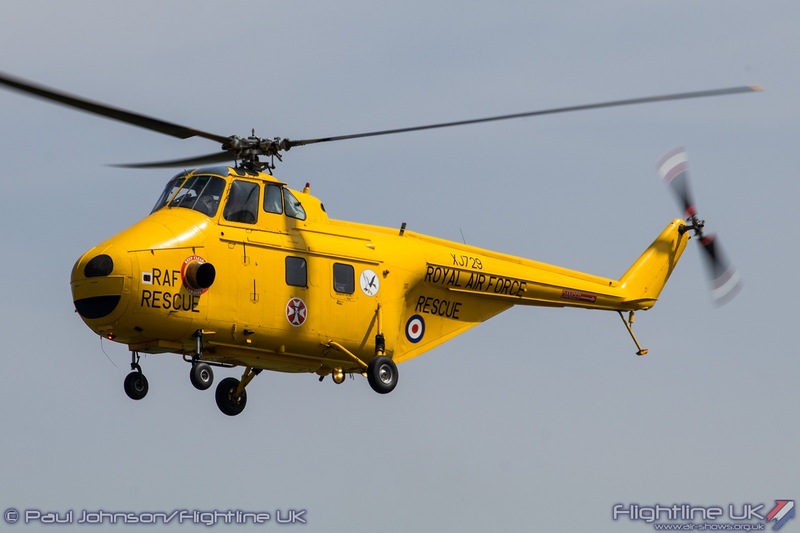 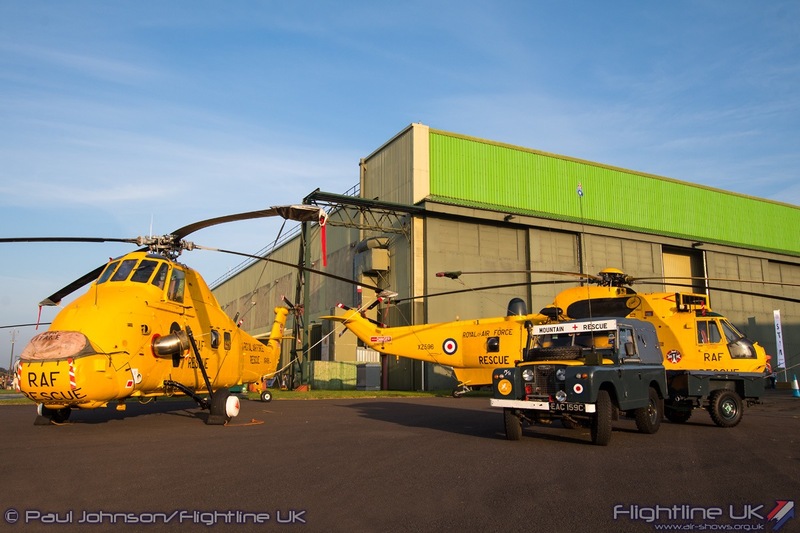 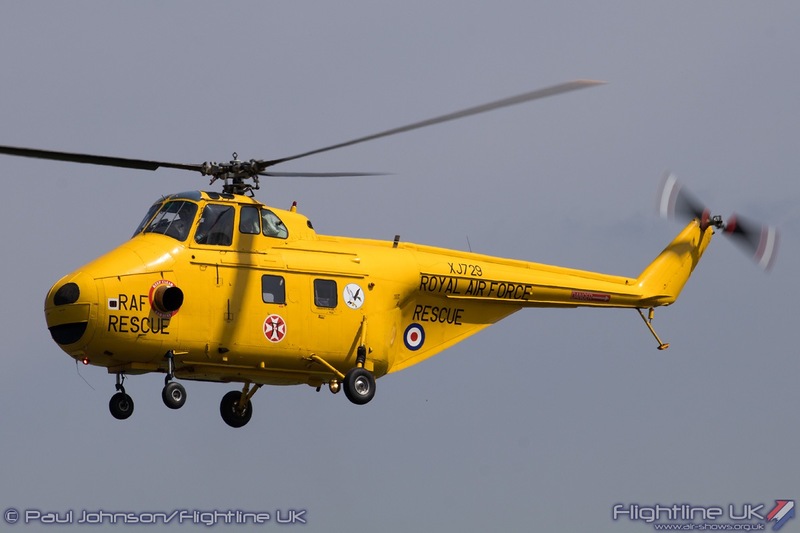 The Westland Whirlwind HAR10 and Gazelle Squadron’s pair of Westland Gazelles have both performed at Cosford before and were excellent representatives of the RAF’s rotary history. 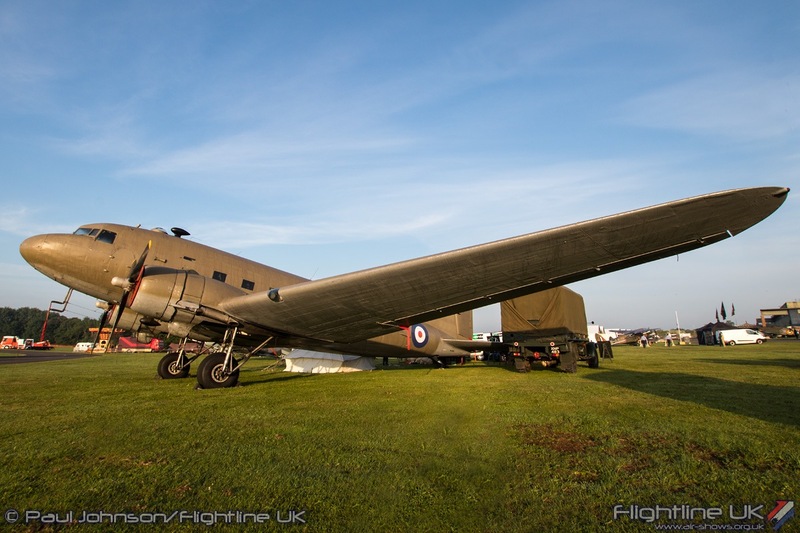 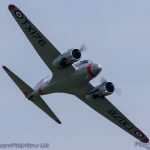 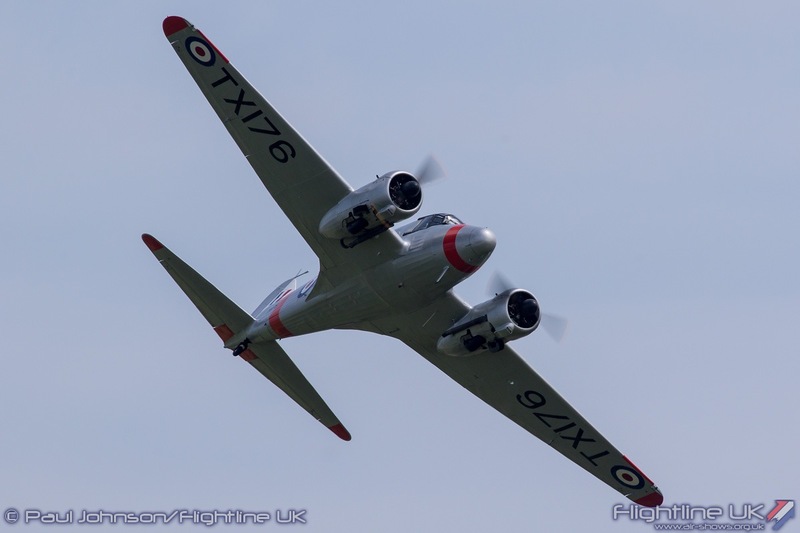 However, perhaps the overall show star was another participant from the Flying Bulls, the Bristol 171 Sycamore. 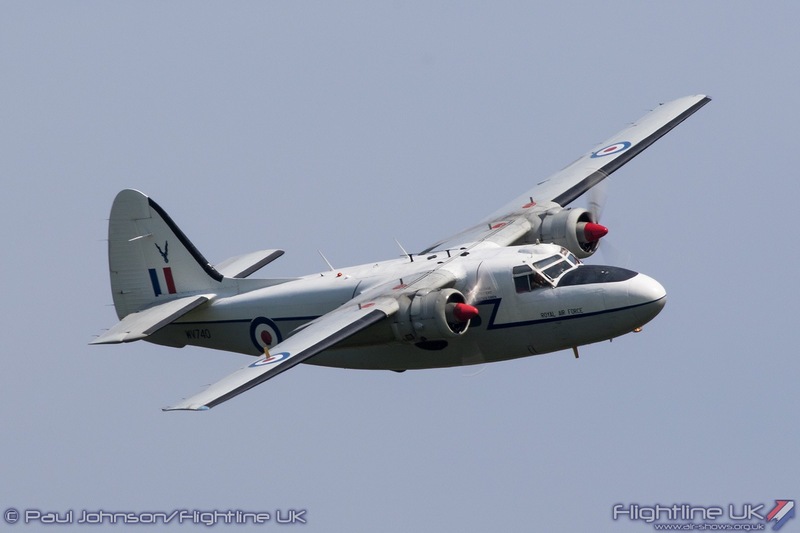 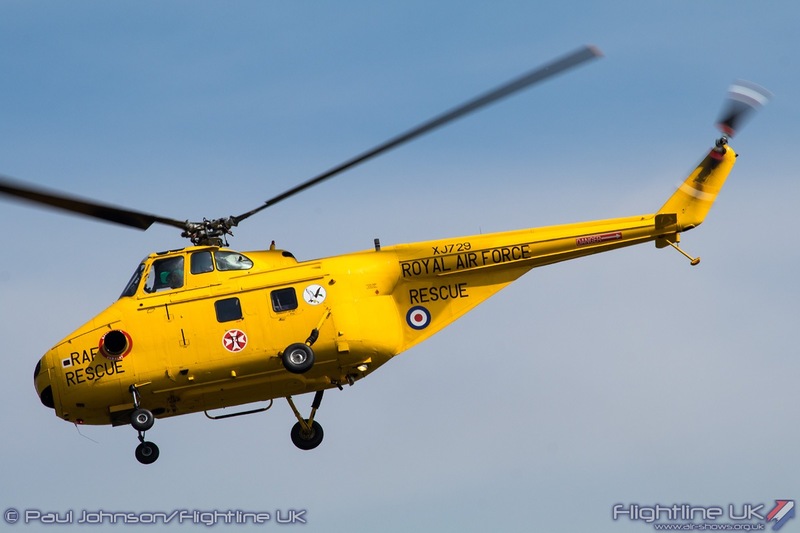 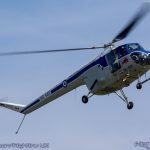 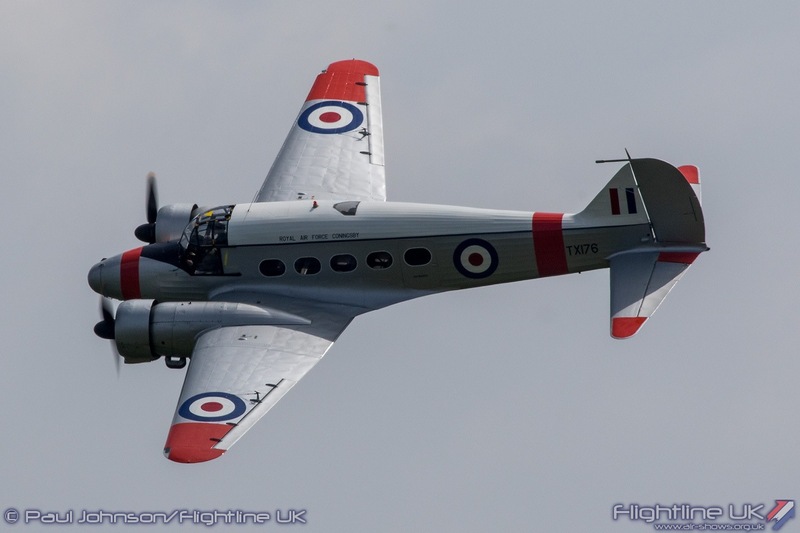 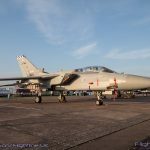 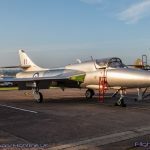 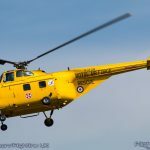 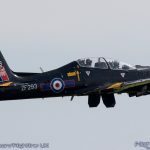 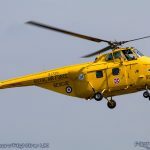 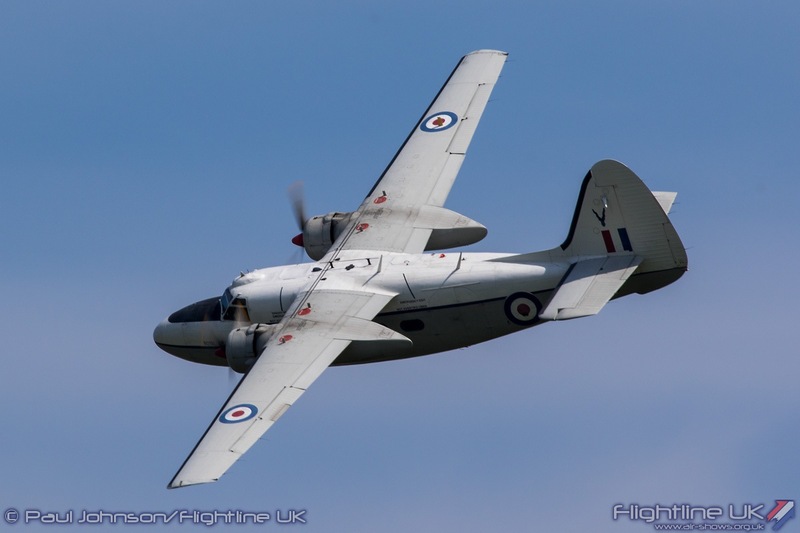 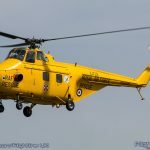 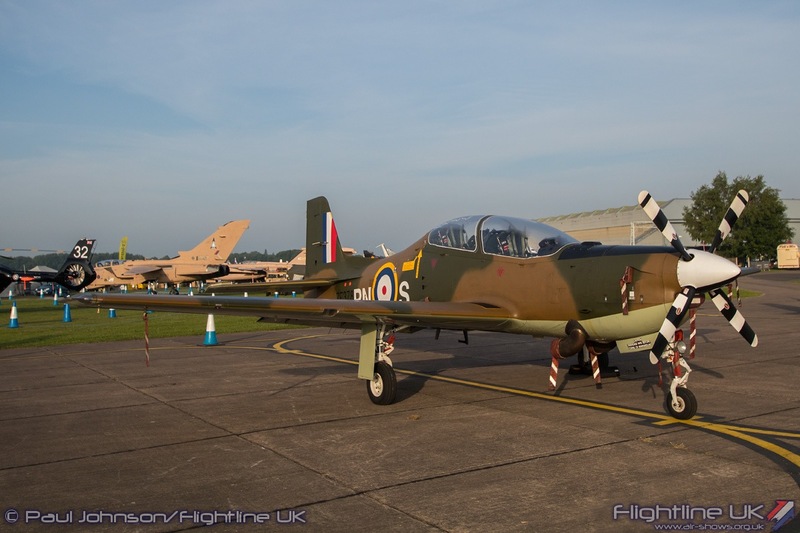 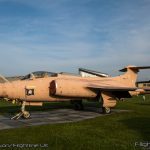 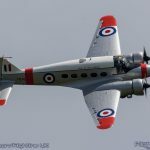 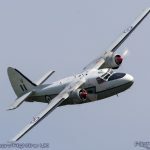 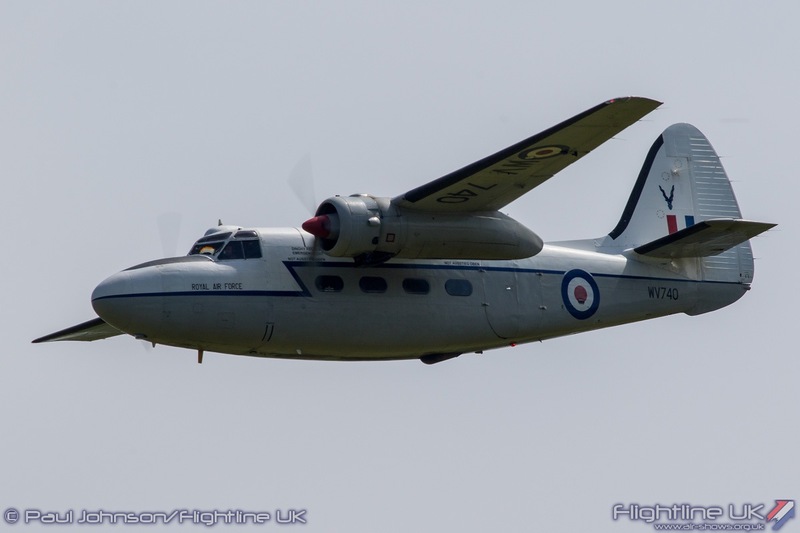 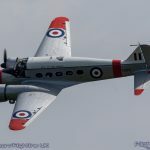 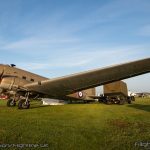 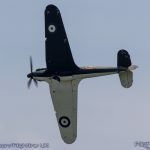 The Sycamore’s UK display debut was highly anticipated by enthusiasts as it probably was the first time the type had flown in UK skies since being retired from the RAF in 1971. 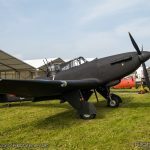 The Flying Bulls example is actually an ex-West German military example but has been superbly restored and now wears the markings of RAF Air Support Command. 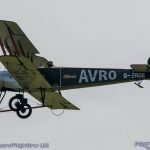 The Sycamore is not the most powerful or agile of machines but Siegfried “Blacky” Schwarz gave the crowds a fine demonstration of one of the RAF’s earliest forays into rotary aviation. 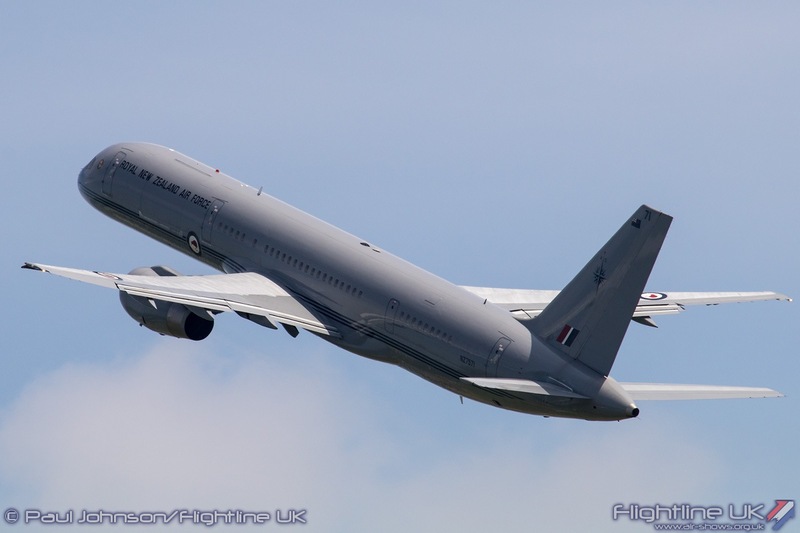 The Age of Uncertainty section also saw the final two contributions from overseas air forces. 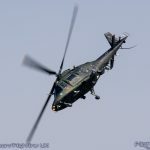 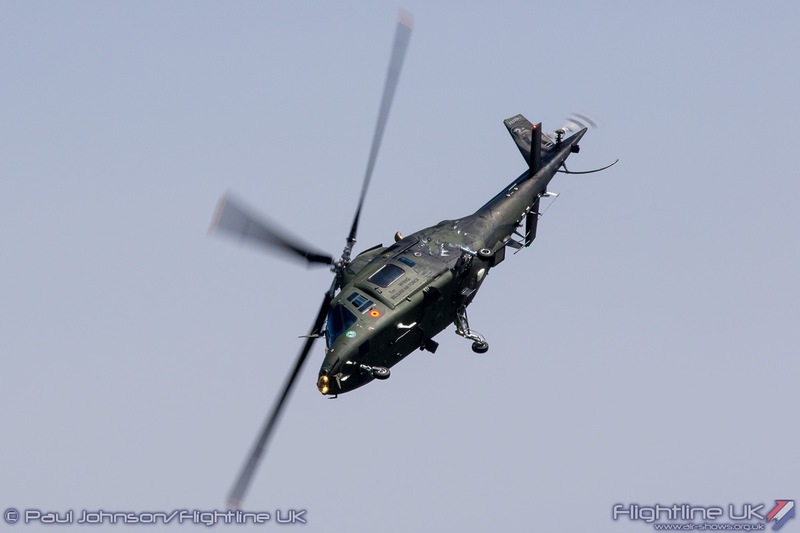 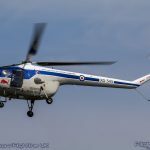 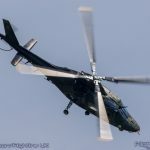 The Belgian Air Force returned this time with the Agusta A109BA solo display which is always dramatic. 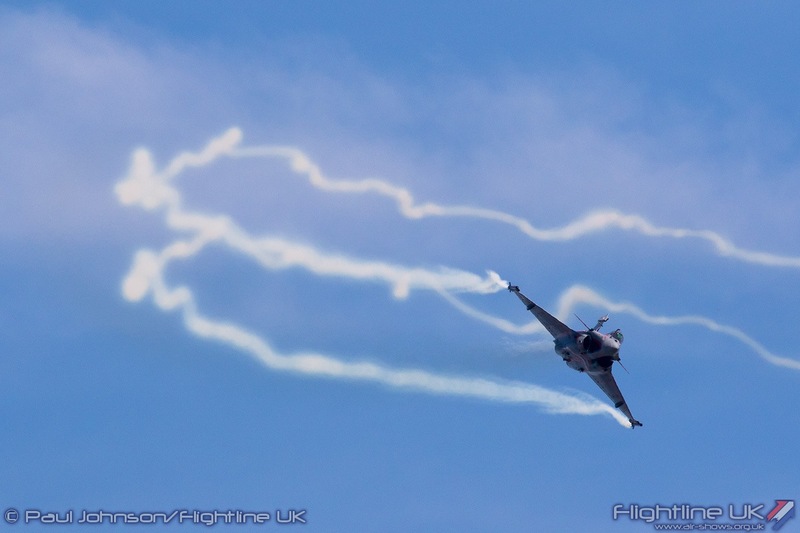 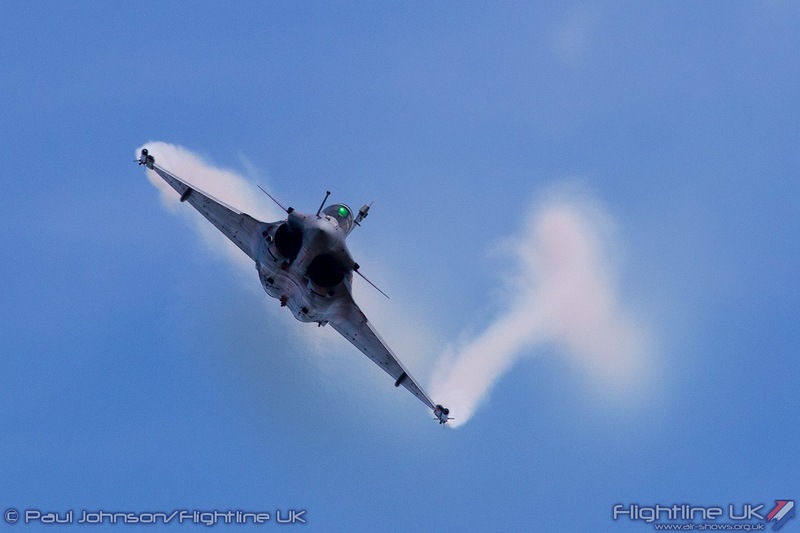 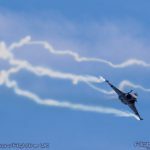 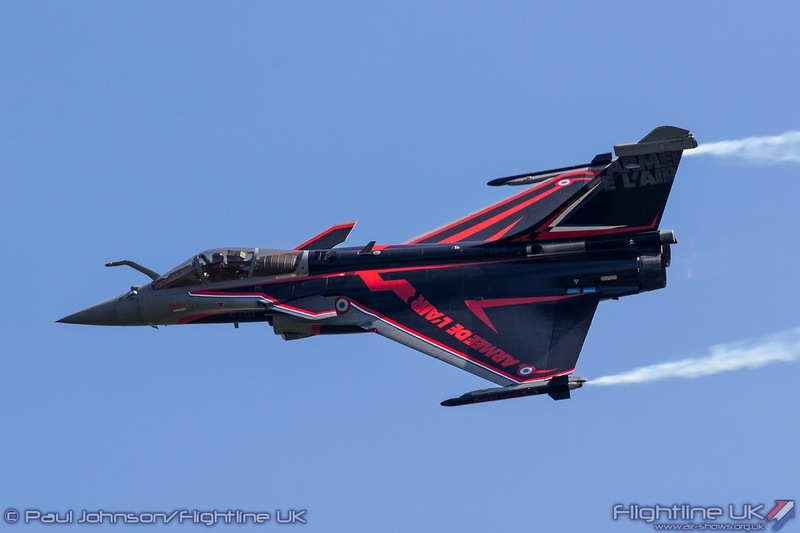 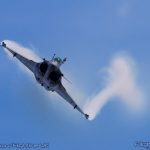 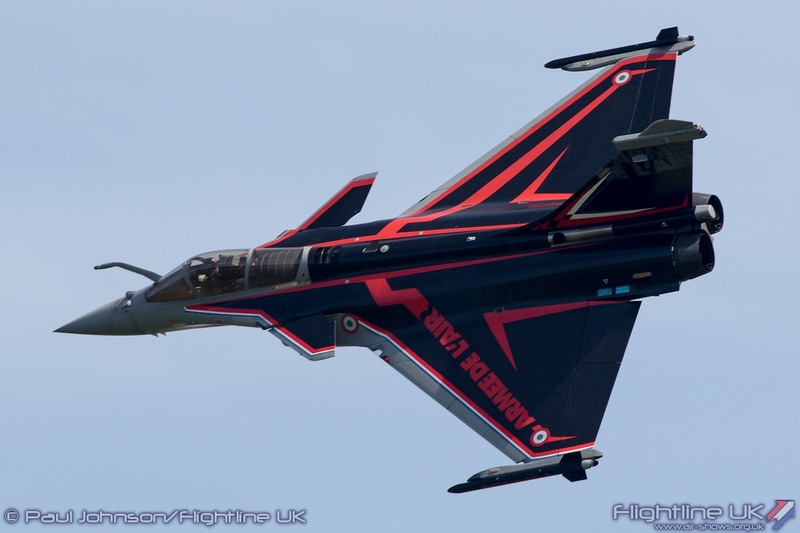 The French Air Force’s Dassault Rafale C solo display rounded off the international participation in fine style with a punchy display flown by Capitaine Sebestian “Babouc” Nativel. 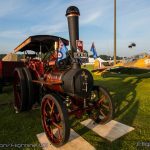 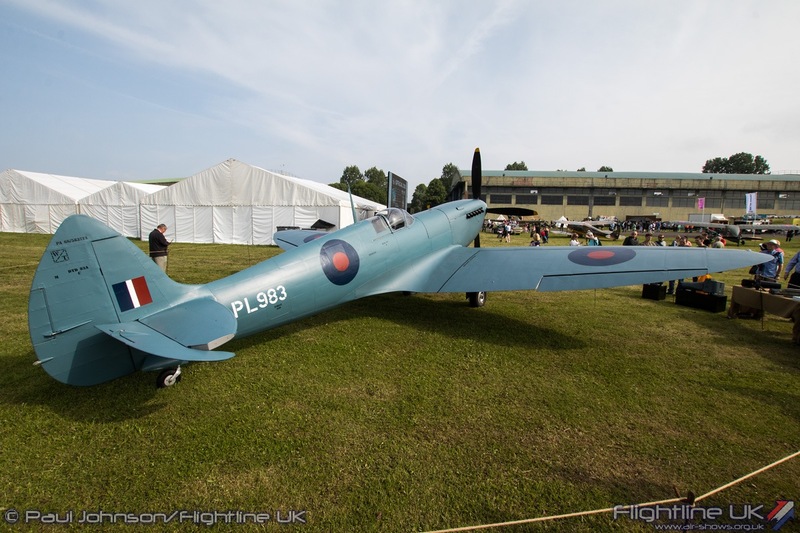 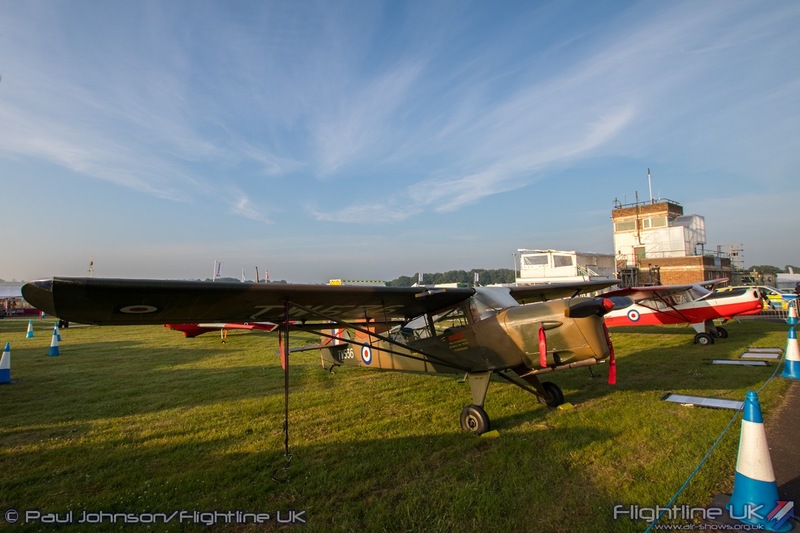 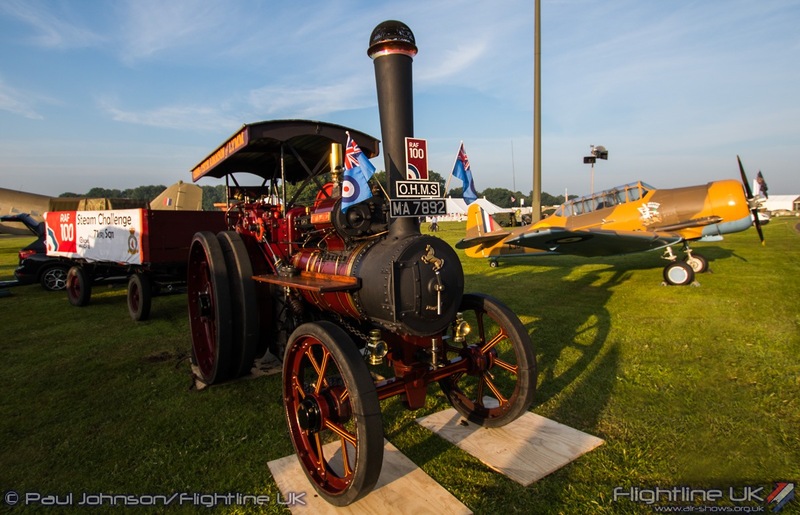 His display was awarded with the Hartree Memorial Award for best flying display at the show as judged by the flying control committee which was very well deserved. 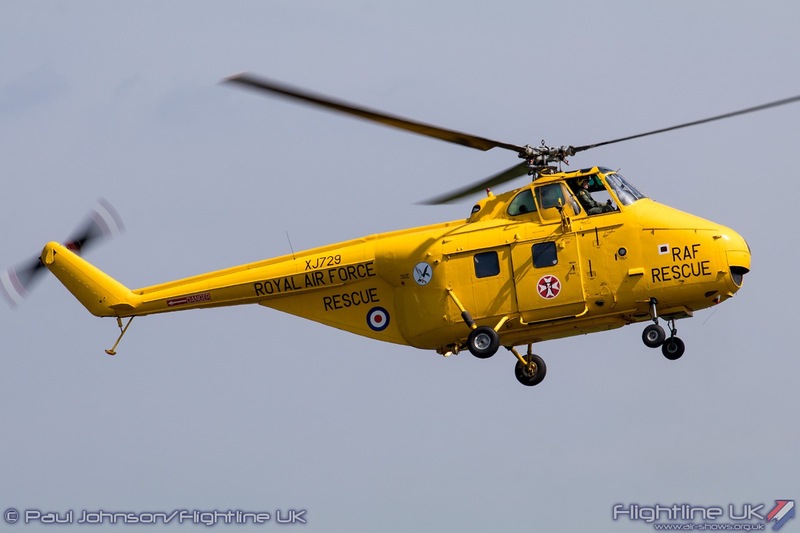 The Royal Air Force’s rotary air power was the first showcase of the modern day segment. 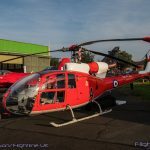 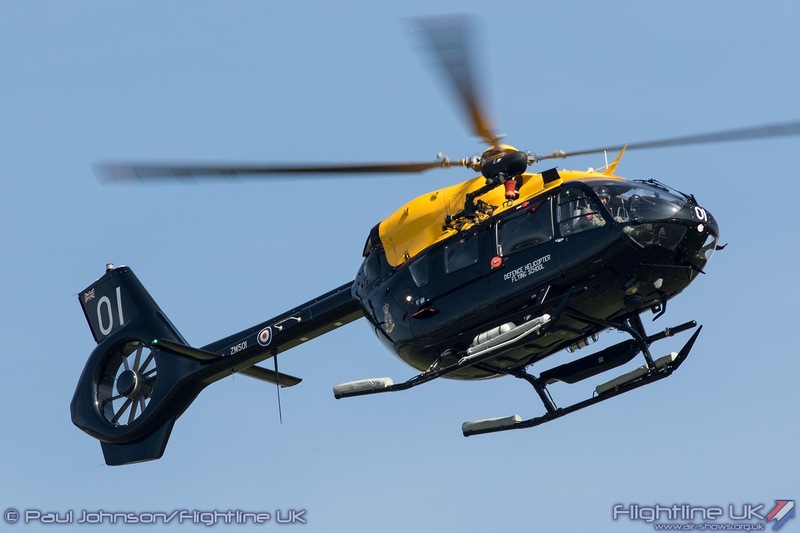 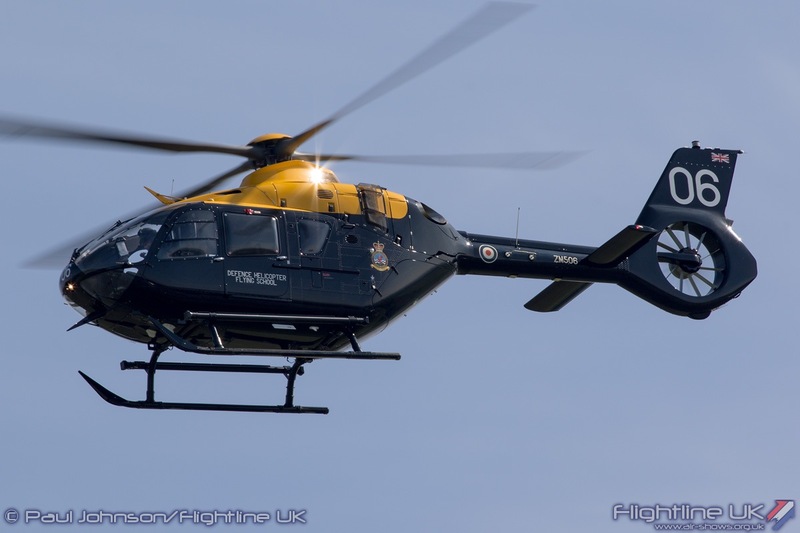 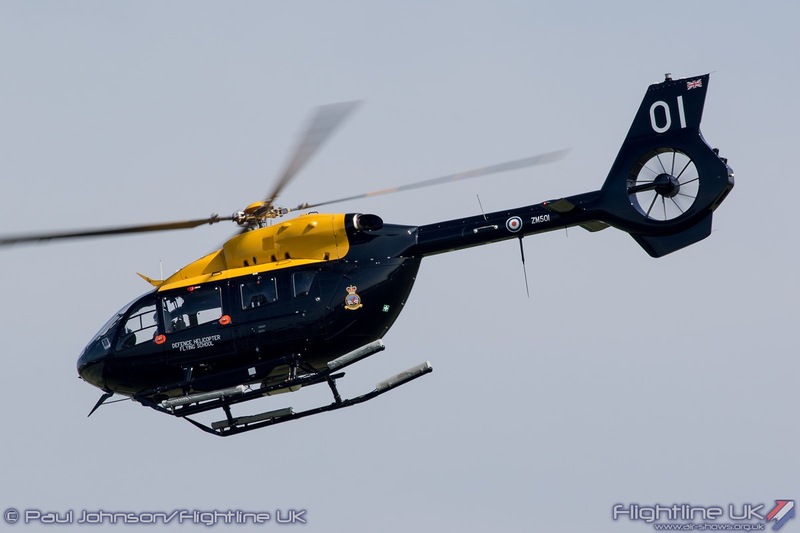 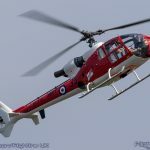 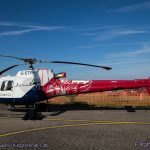 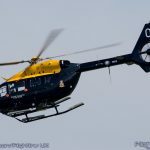 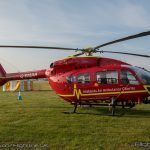 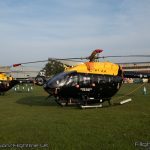 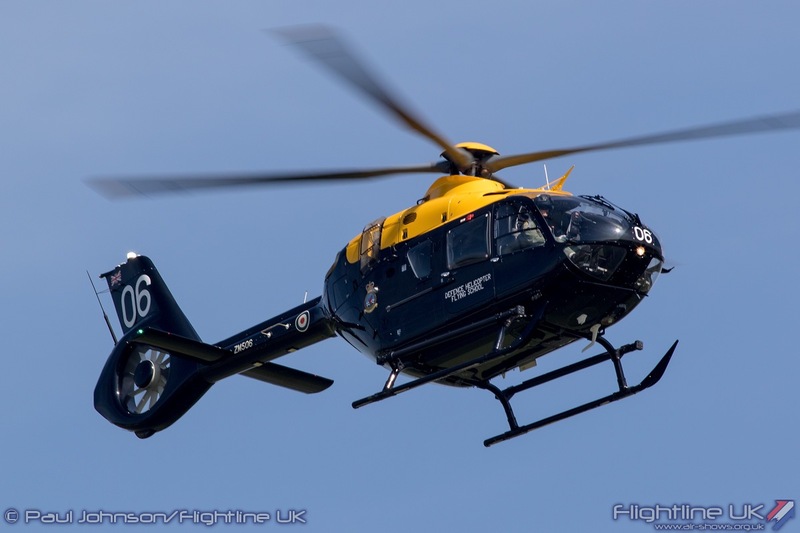 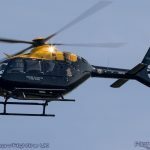 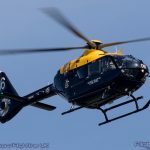 This started with two of the newest types in service with the Airbus Helicopters H135 Juno HT1 and H145 Jupiter HT1 from nearby RAF Shawbury. 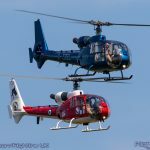 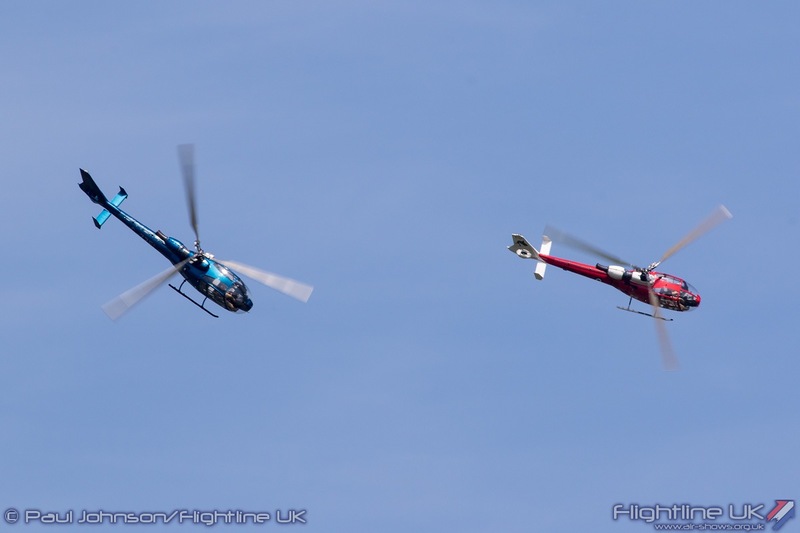 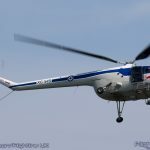 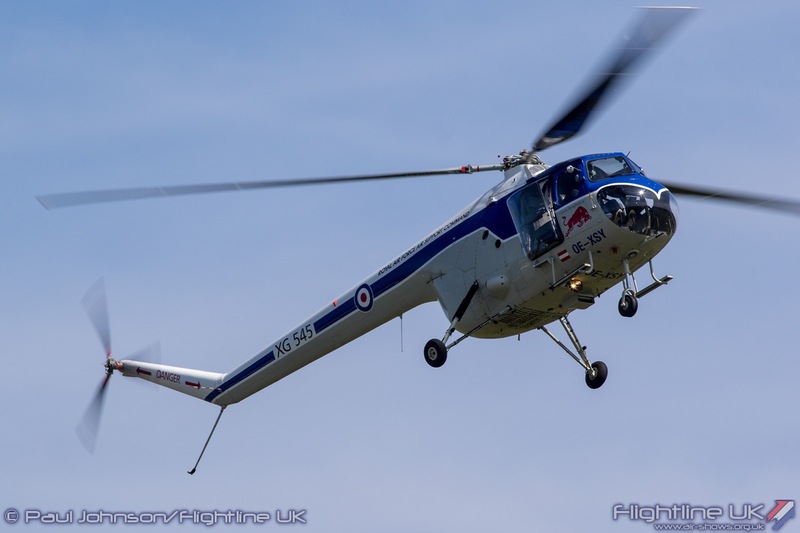 The two helicopters performed a series of flypasts and close hovers marking both types debut as part of a public flying display. 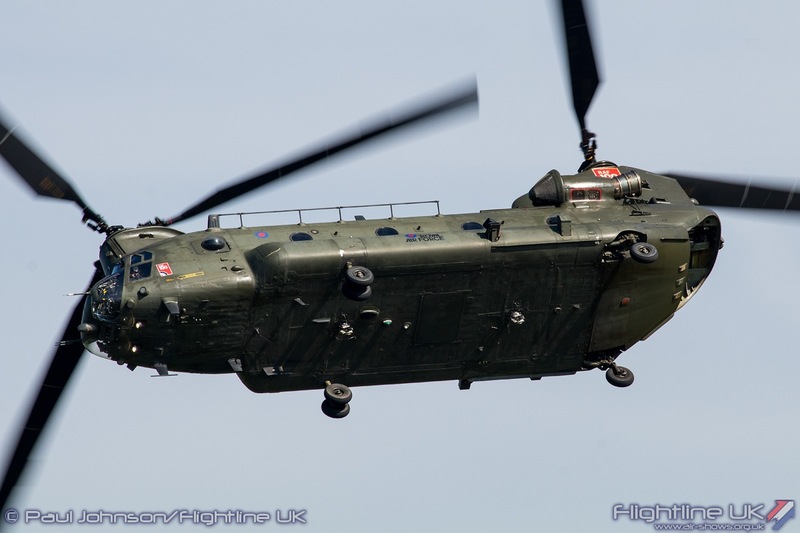 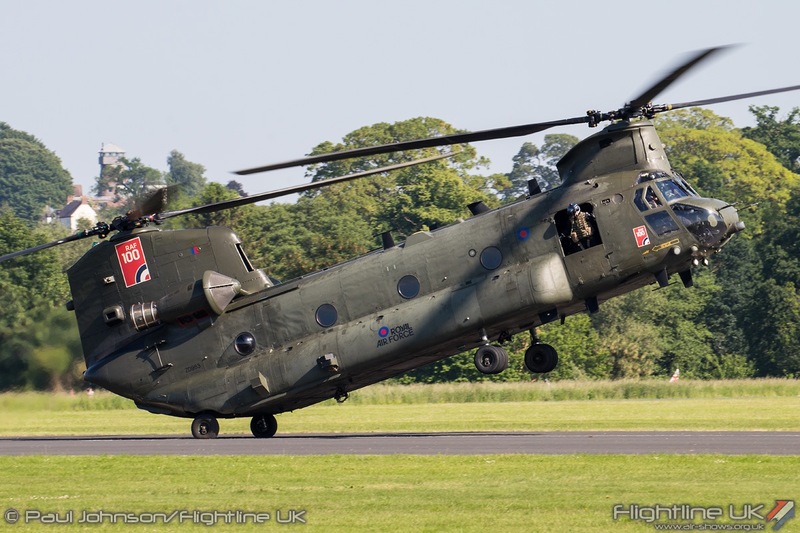 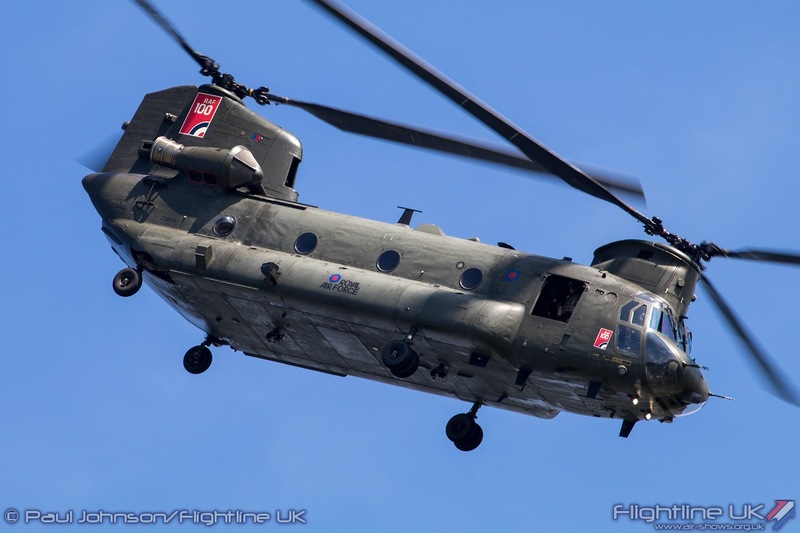 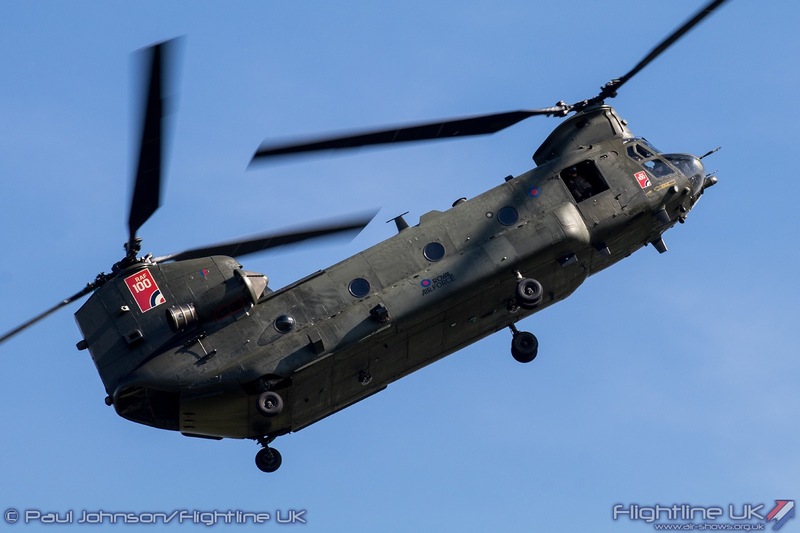 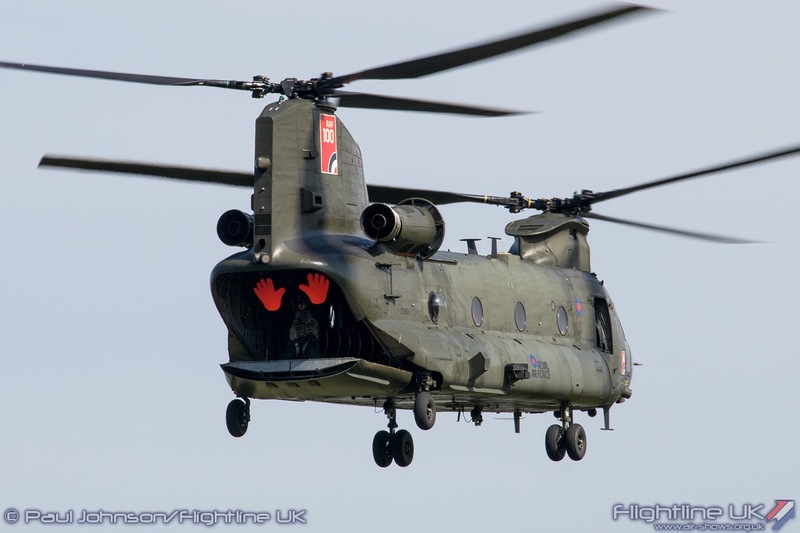 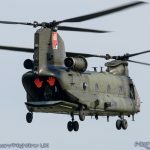 They were followed by the RAF Boeing Chinook HC6A from the Chinook Display Team marking frontline operations. 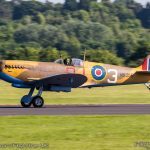 For display captain, Flt Lt Stu ‘Kyno’ Kynaston, it was a special display as it was his ‘home’ show having grown up in near-by Shrewsbury. 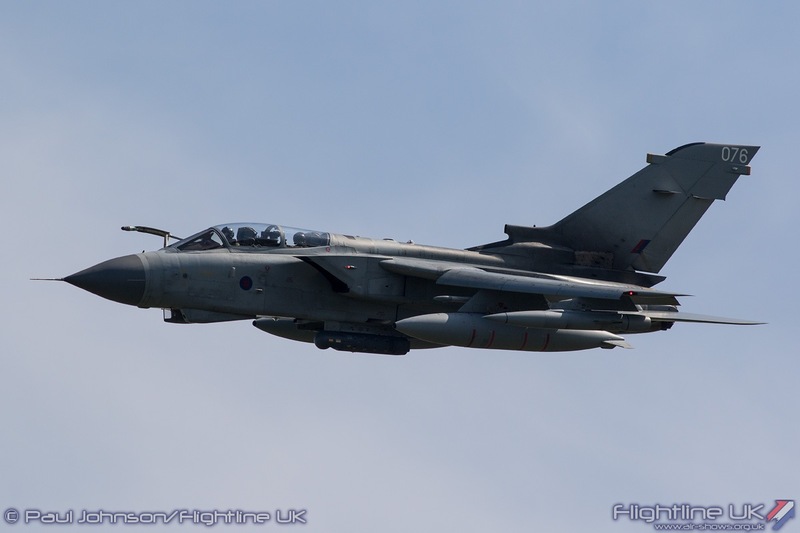 A fond farewell followed the Chinook with two flypasts by IX(B) Squadron Panavia Tornado GR4. 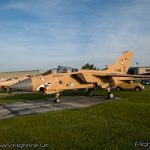 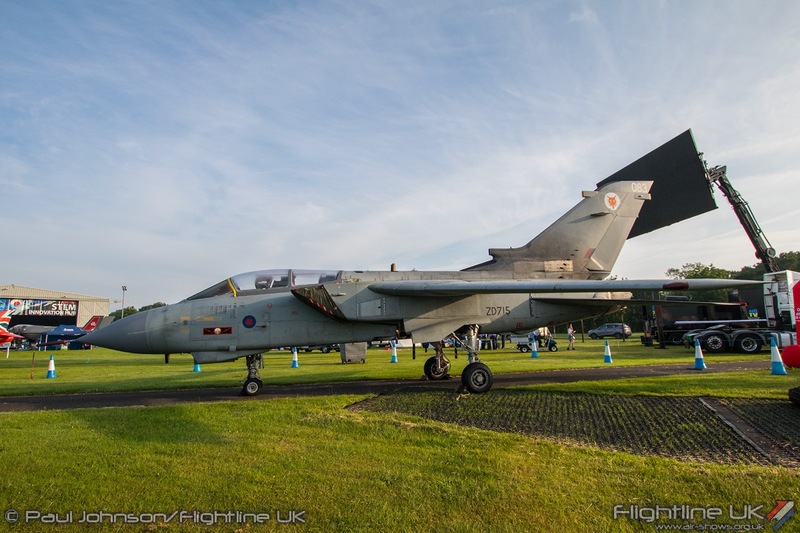 The Tornado is very much in the twilight of its RAF career and is now only operated by two squadrons at RAF Marham. 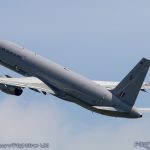 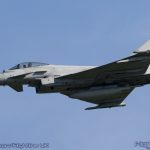 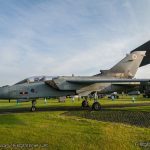 The type is due out of service next year and it successor, the Lockheed Martin F-35B Lightning had started to arrive at Marham in the week before Cosford. 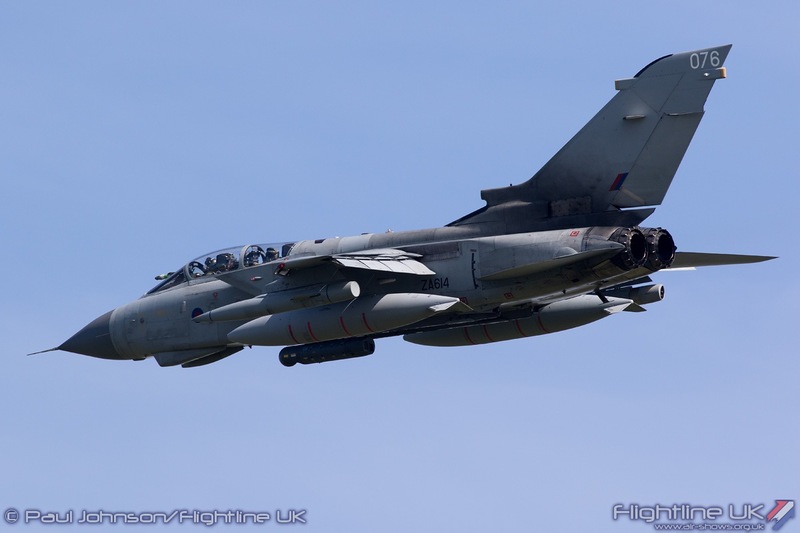 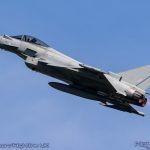 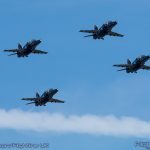 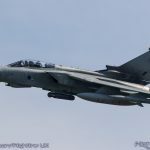 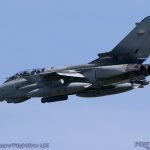 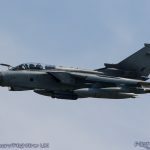 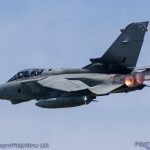 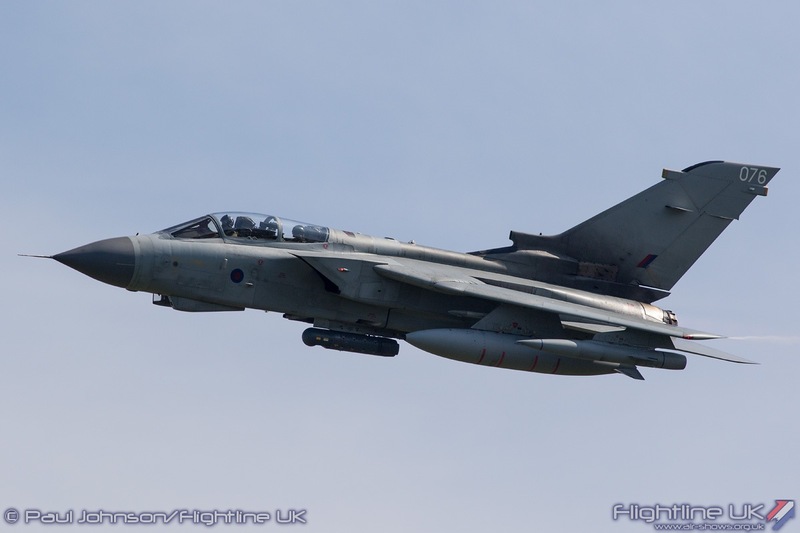 It is therefore likely that the 2018 airshow saw the last time an in-service RAF Tornado participated in the flying display. 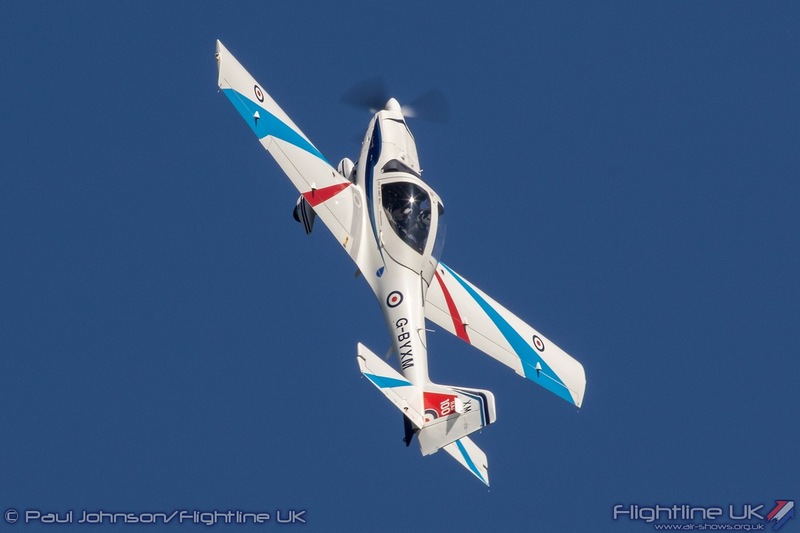 The RAF Grob Tutor T1 solo display flown by Flt Lt Andy Sell kicked off a look at RAF training aircraft. 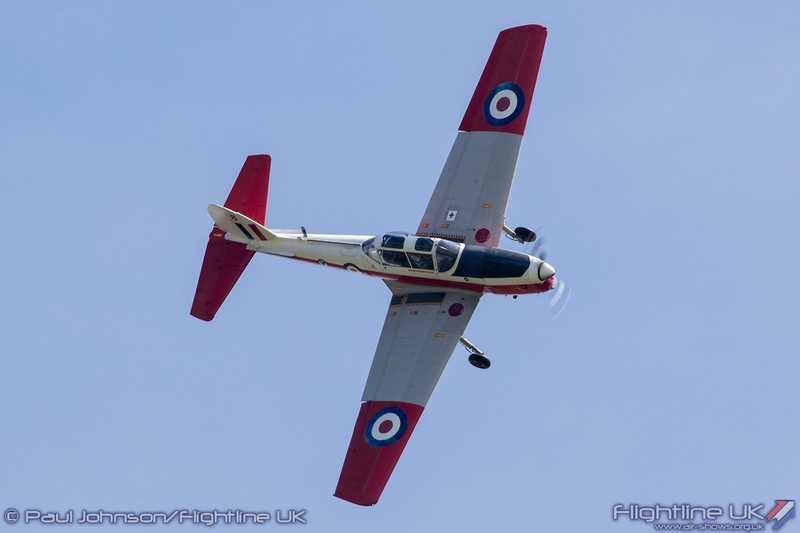 Following Andy’s aerobatic routine were a series of flypasts by different fixed wing training types. 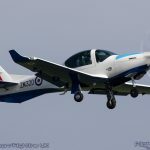 First to appear were three more Grob Tutor T1s from the Cosford based University of Birmingham Air Squadron. 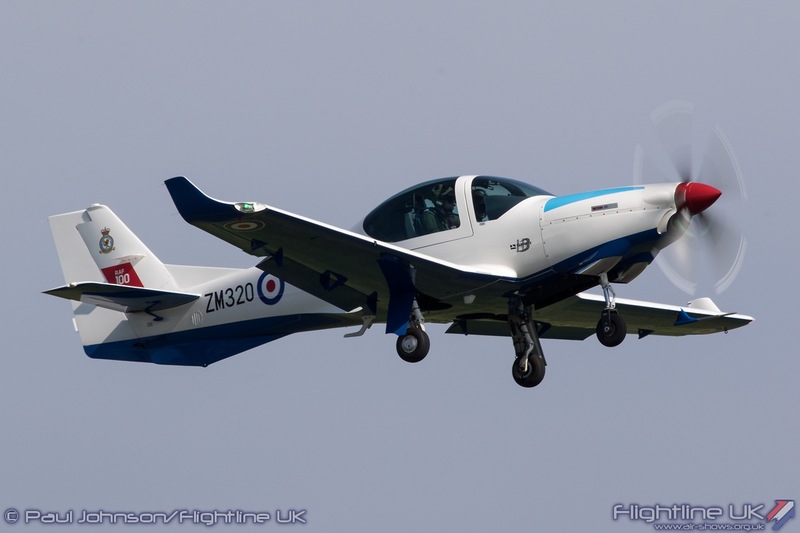 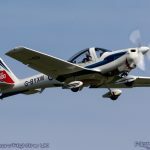 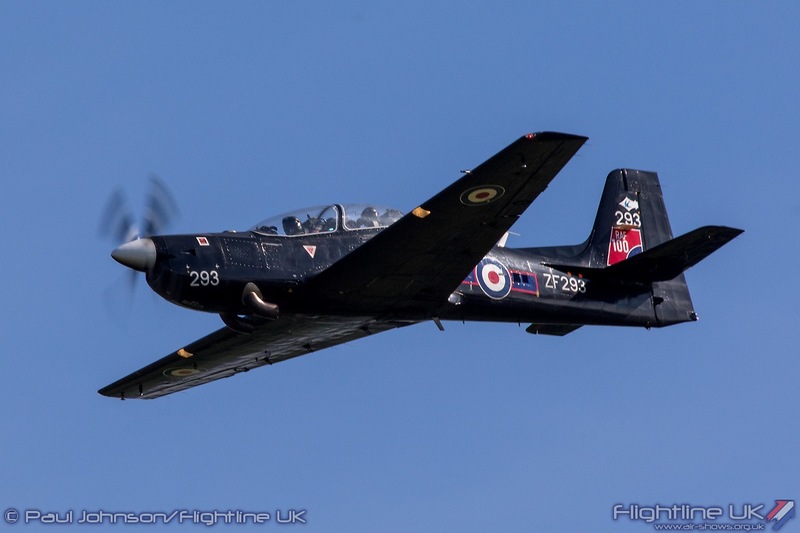 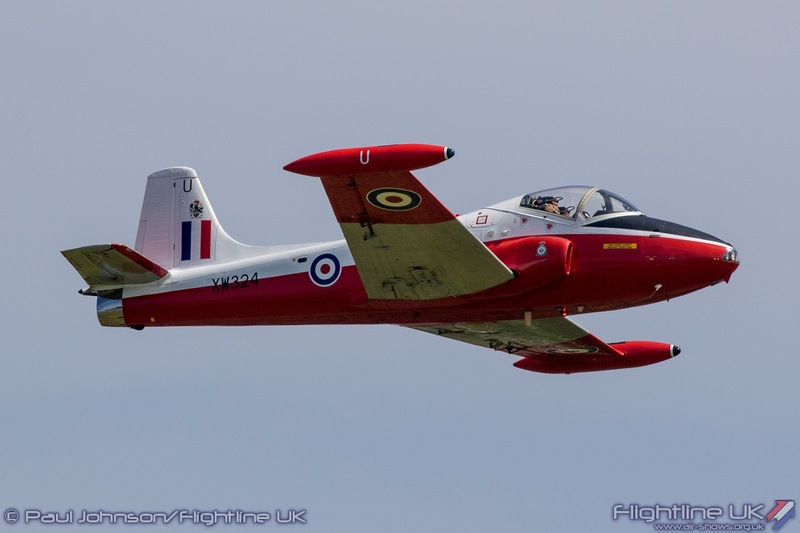 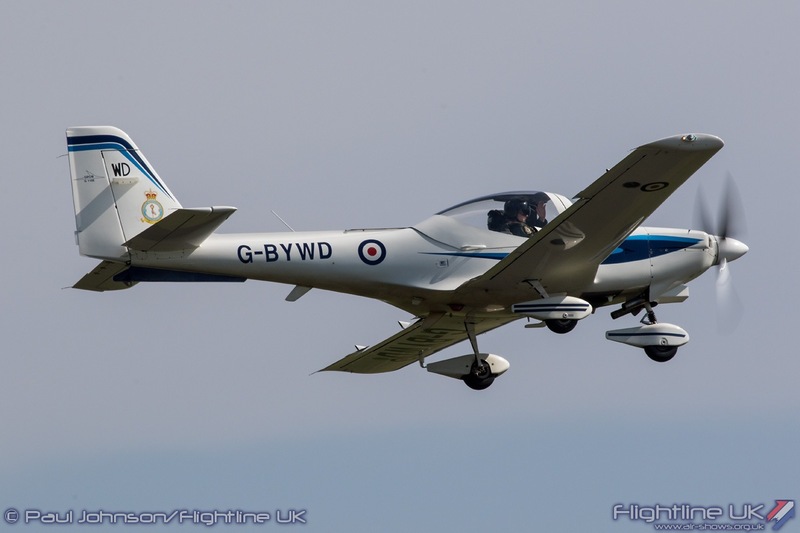 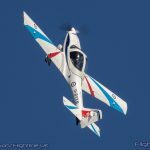 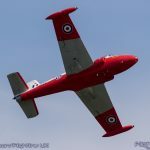 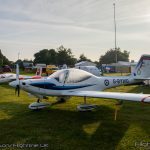 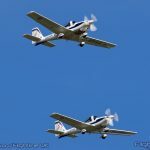 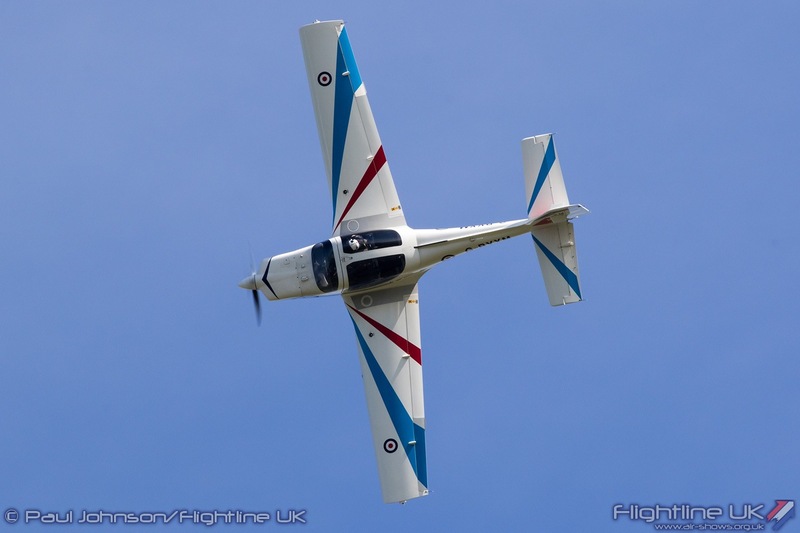 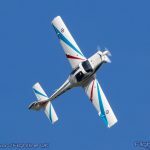 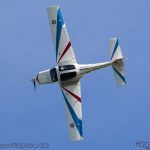 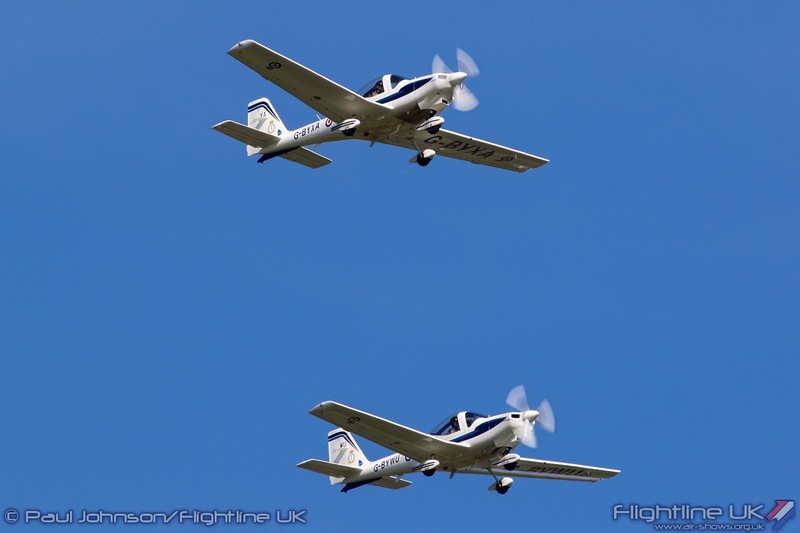 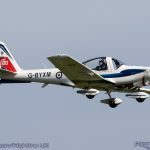 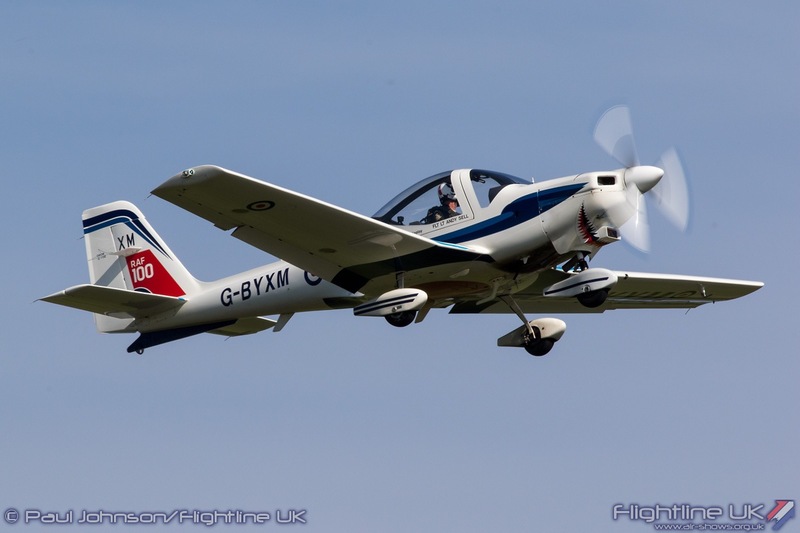 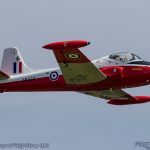 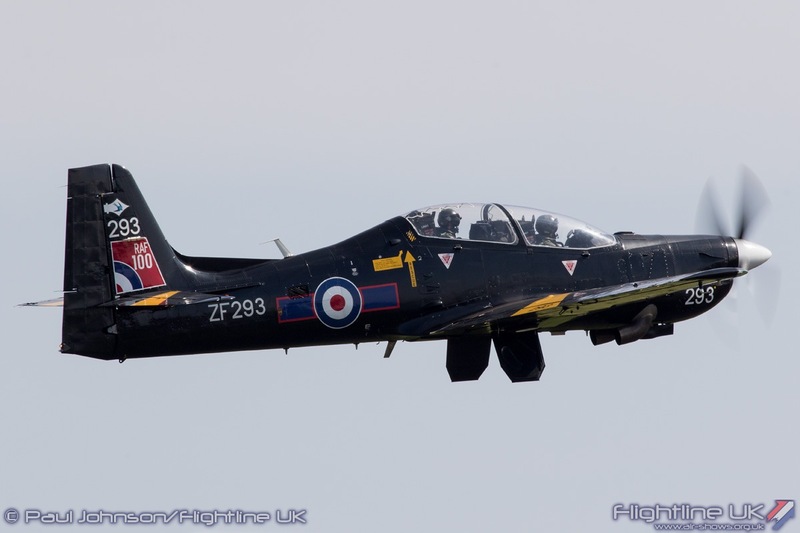 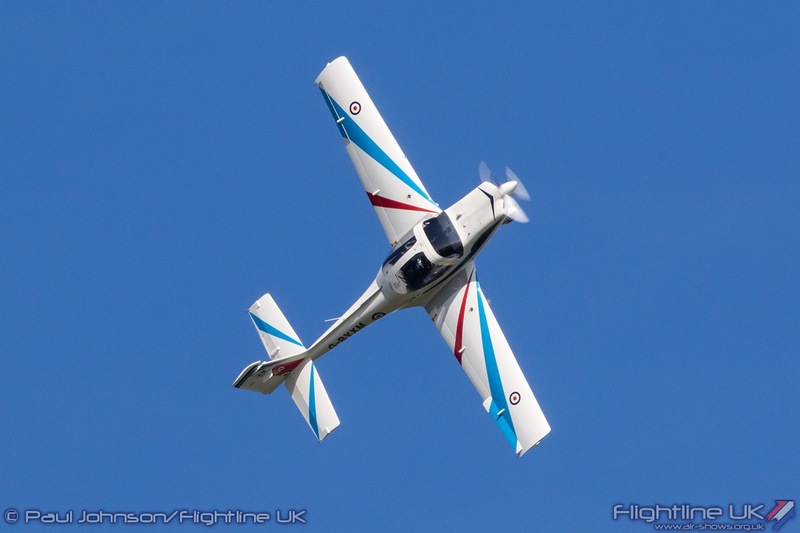 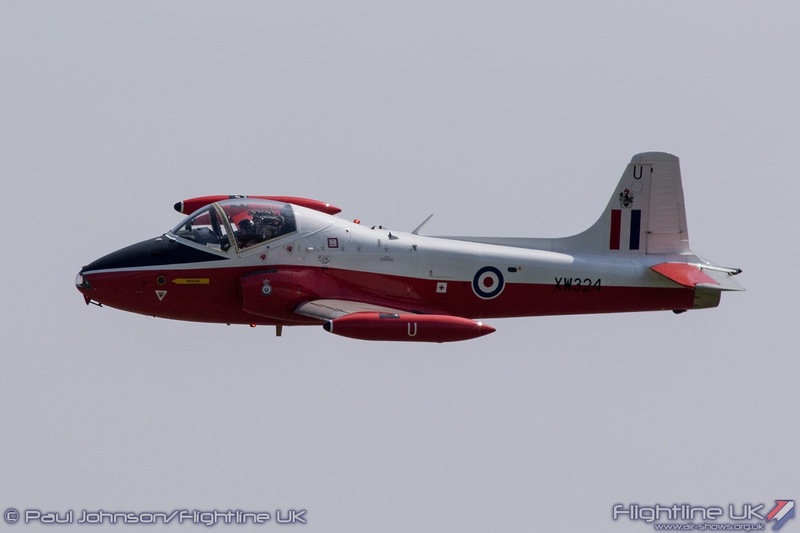 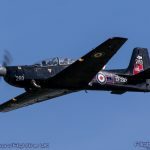 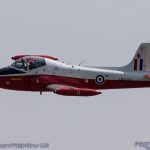 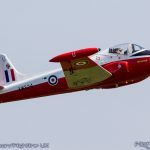 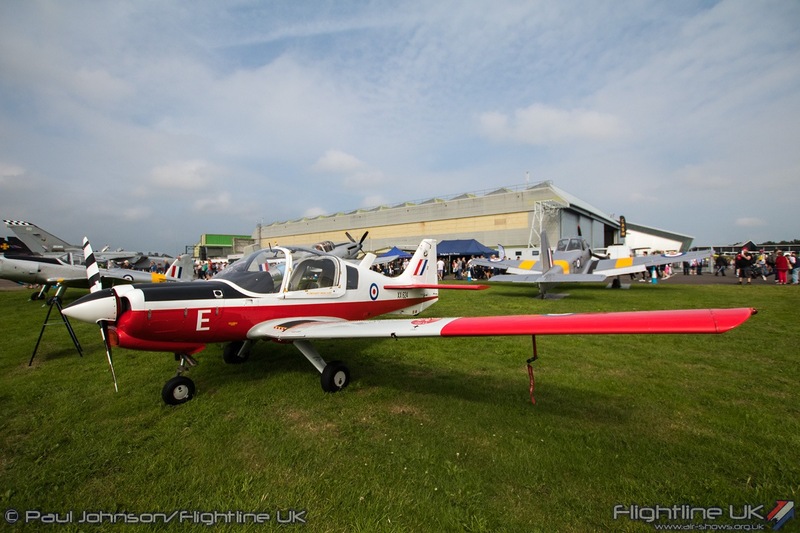 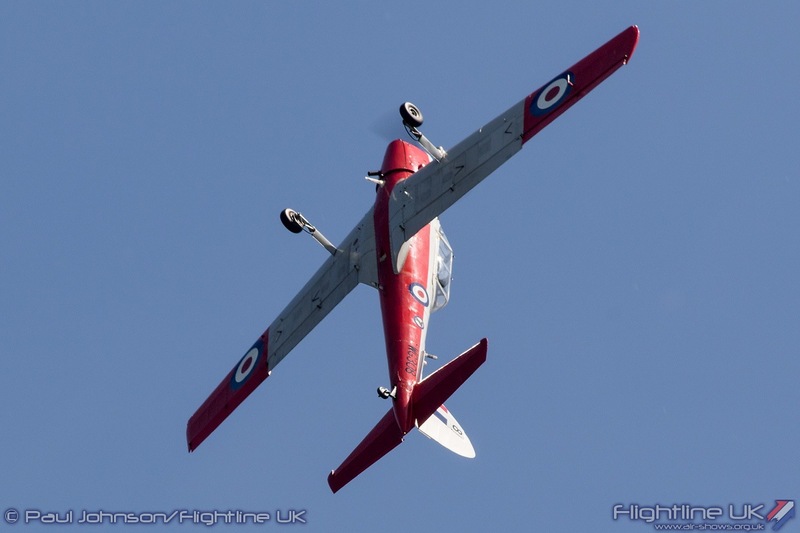 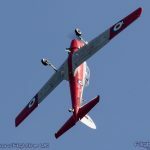 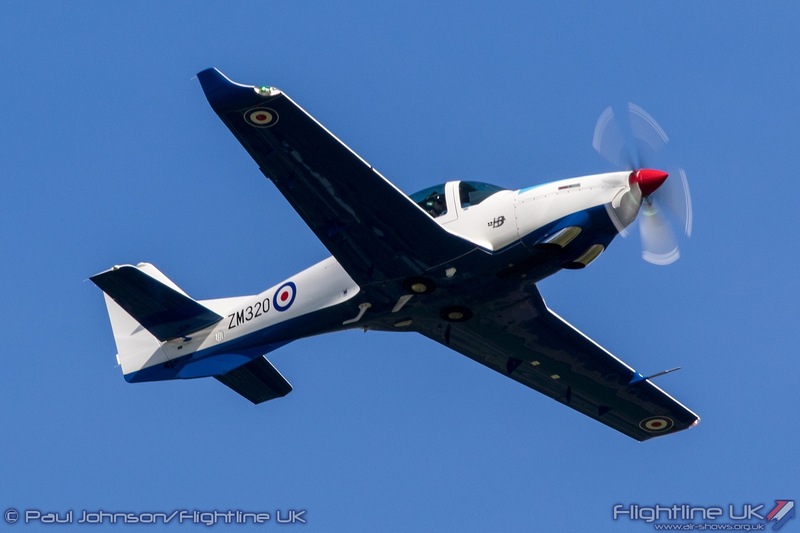 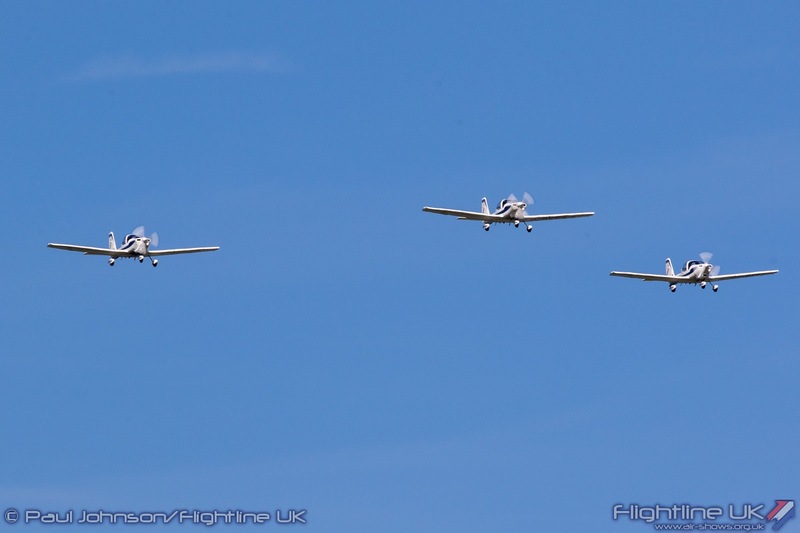 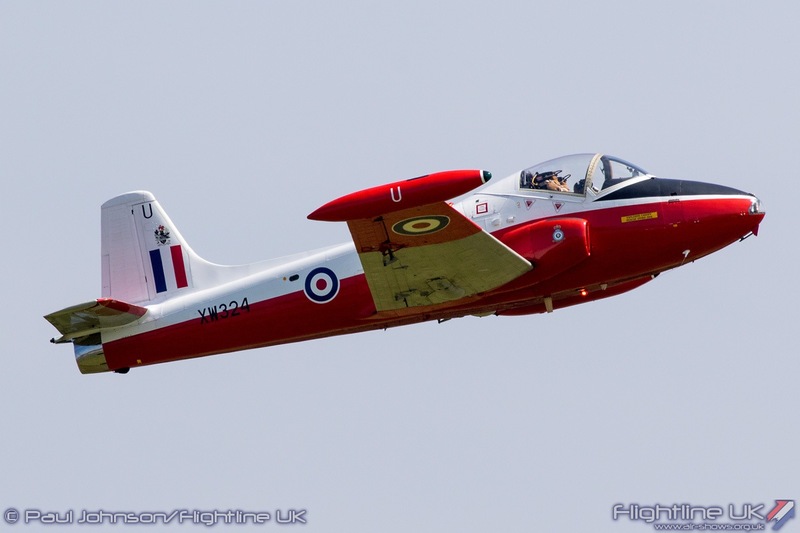 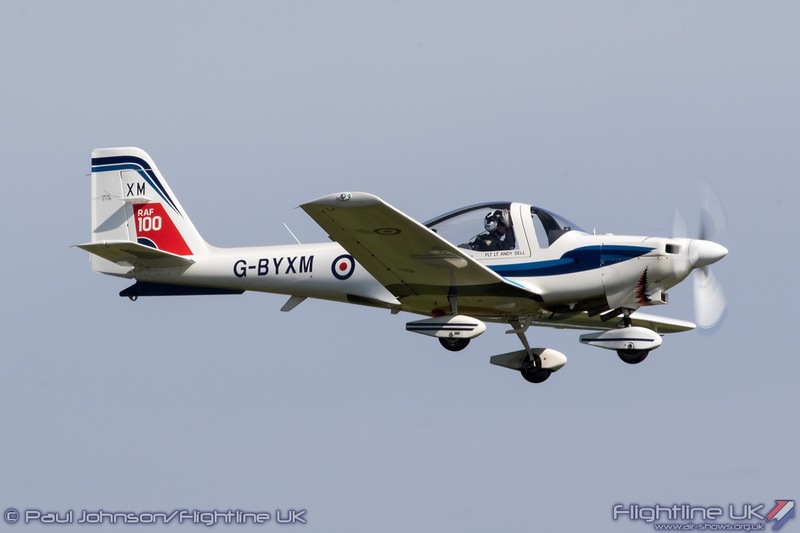 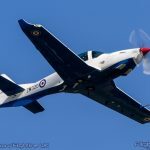 They were followed by a sole example of the Grob G120TP Prefect T1 which was another type making its first appearance in a public flying display before a further flypast from a 72(R) Squadron Shorts Tucano T1. 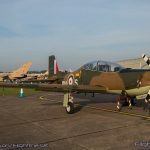 Like the Tornado, the Tucano will shortly go out of service so this was likely to be the last time one appeared at Cosford. 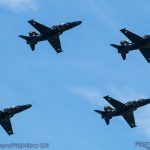 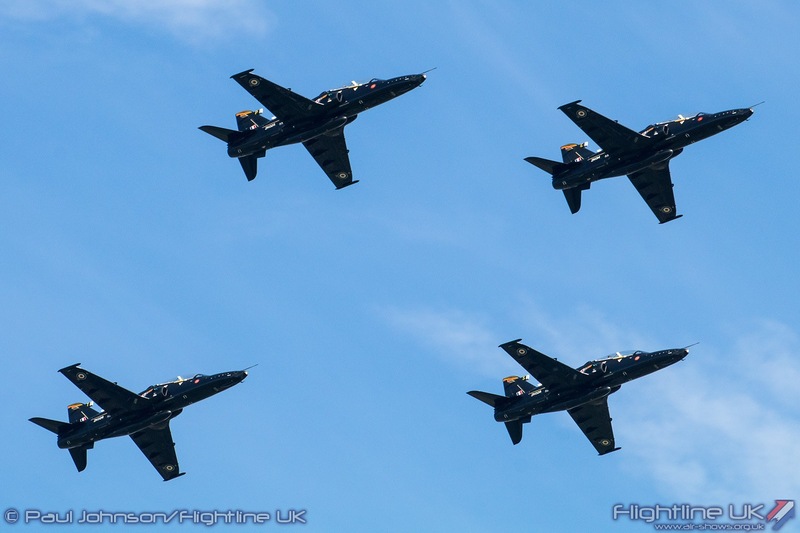 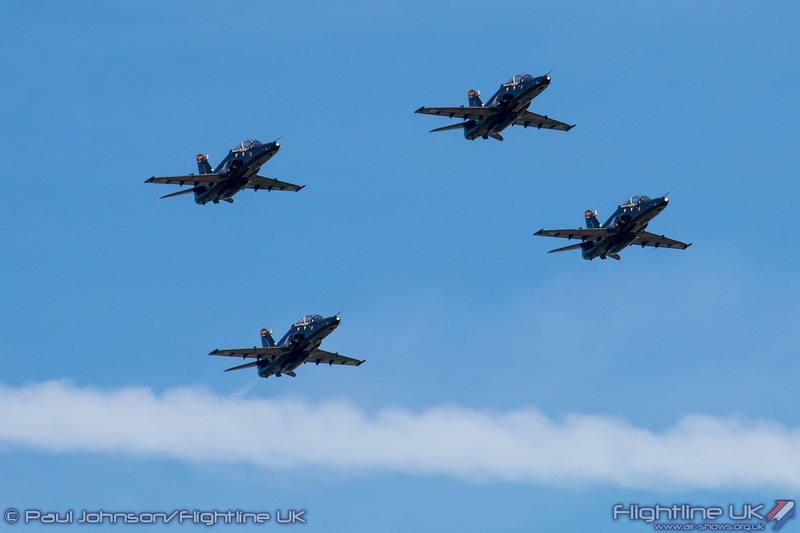 Closing the training sequence were four BAE Systems Hawk T2s from IV(R) Squadron based at RAF Valley which gave a single flyby in a loose diamond box formation. 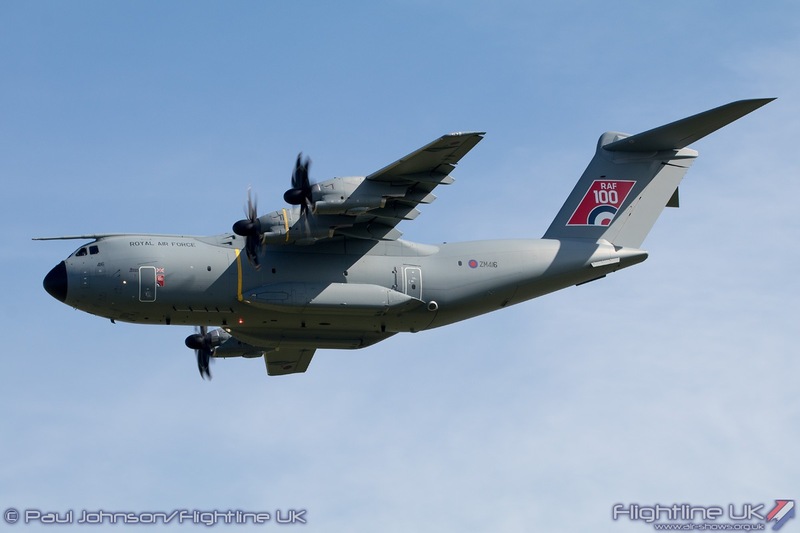 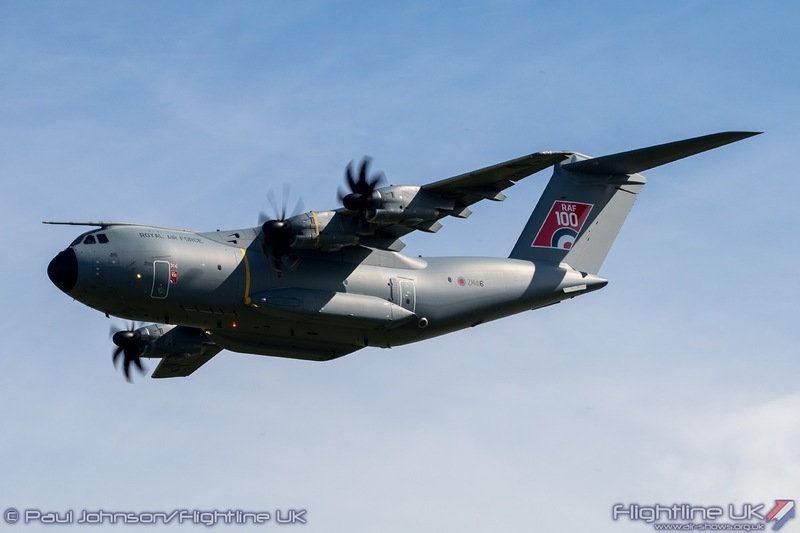 The penultimate item of the day was a flypast by a 70 Squadron Airbus DS A400M Atlas C1 which like many of the other participating aircraft wore the RAF100 tail-flash. 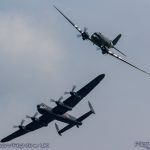 While it was great to see a number of types that don’t normally participate in flying displays, the need to launch and recover a number of the flypast elements from Cosford along with the associated repositioning did mean the whole training section dragged a bit and the flying display lost its flow right at the climax of the day. 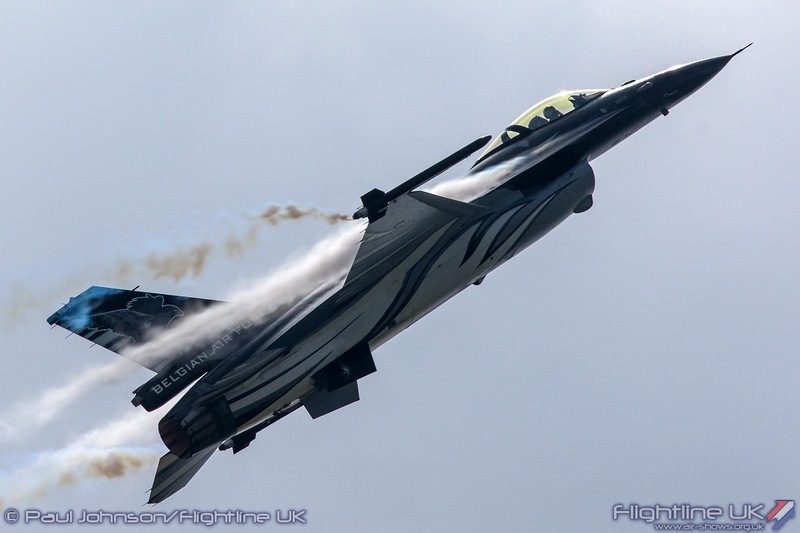 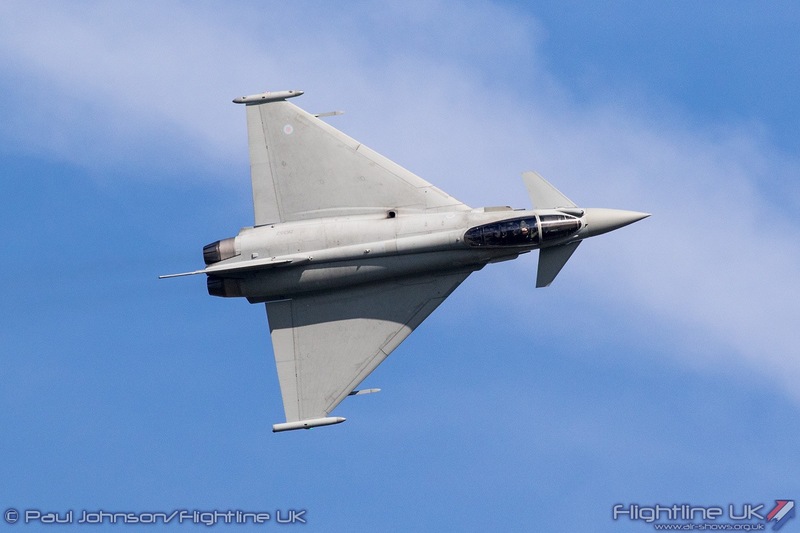 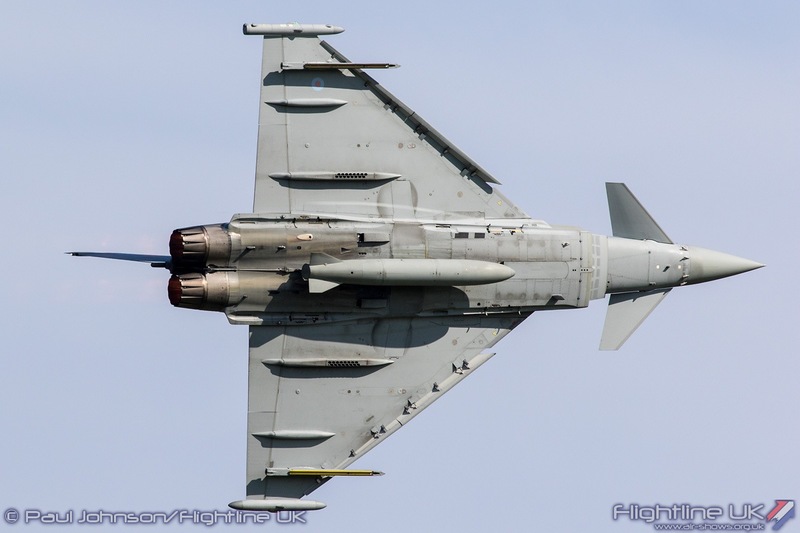 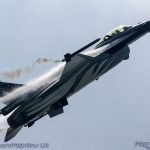 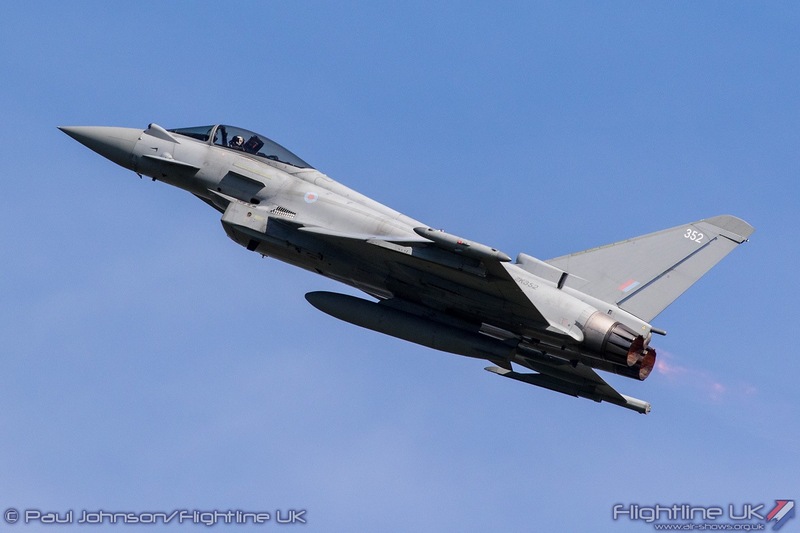 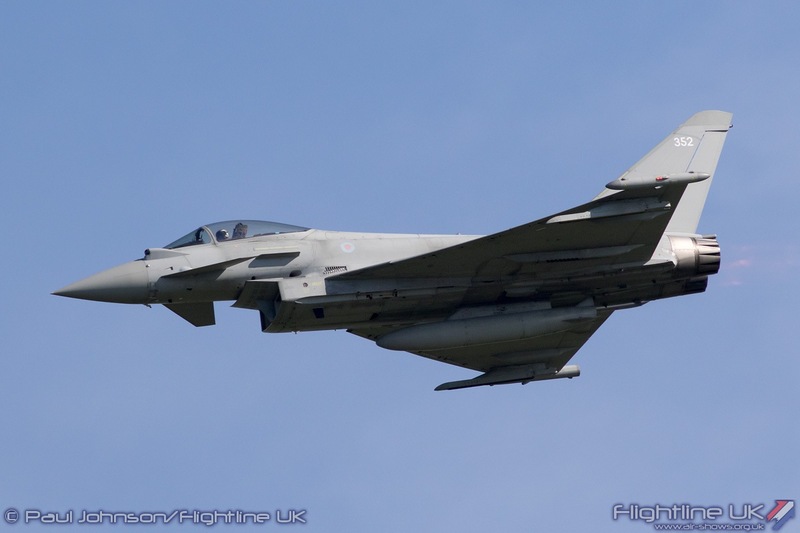 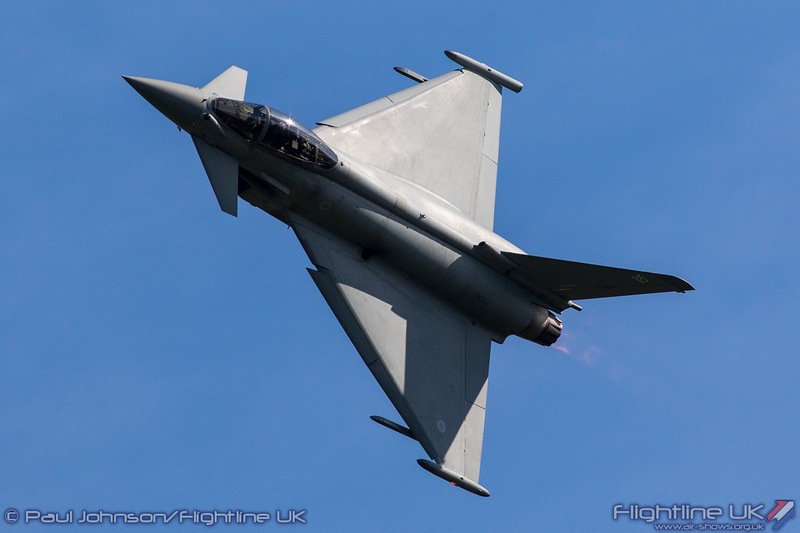 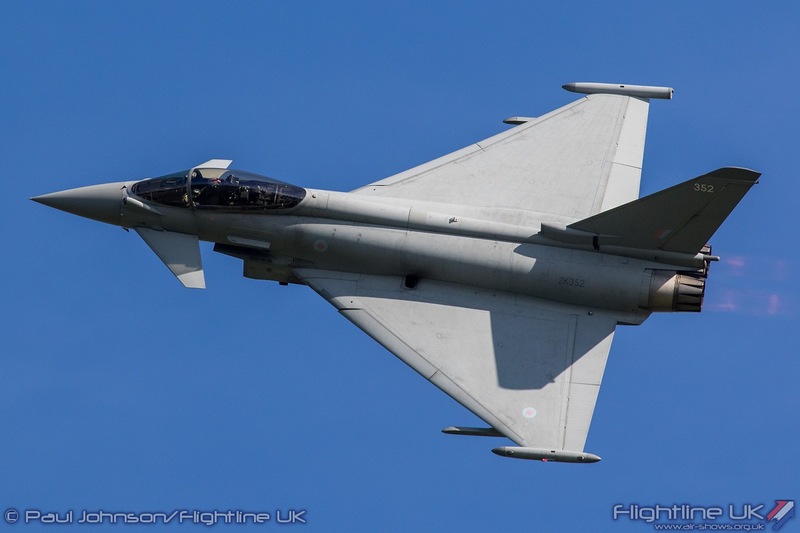 This very special RAF Cosford Air Show flying display was closed by the Eurofighter Typhoon FGR4 from No 29(R) Squadron and flown by Flt Lt Jim Peterson. 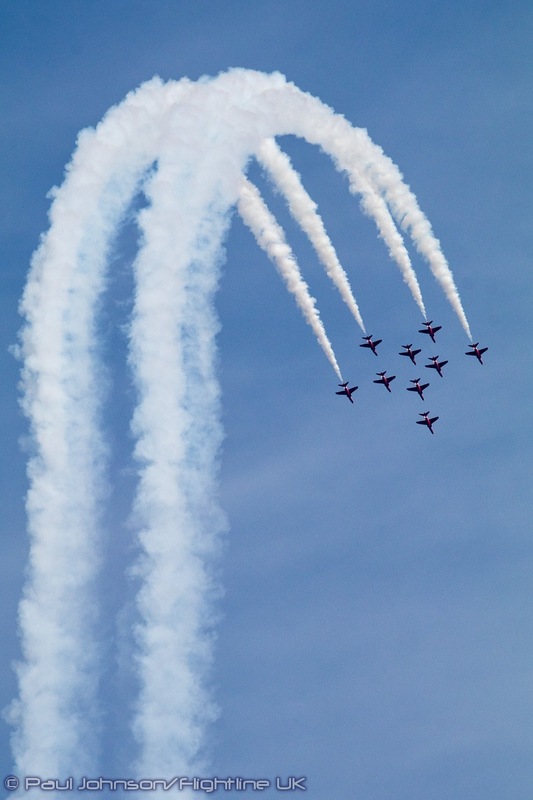 With clear blue skies, Jim was clear to perform his energetic routine to being the day to a very noisy end. 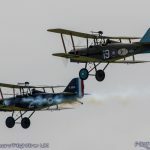 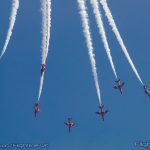 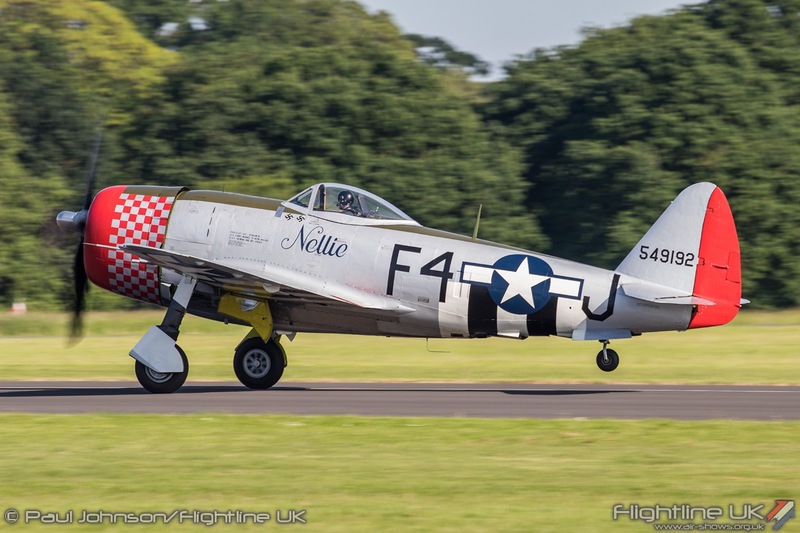 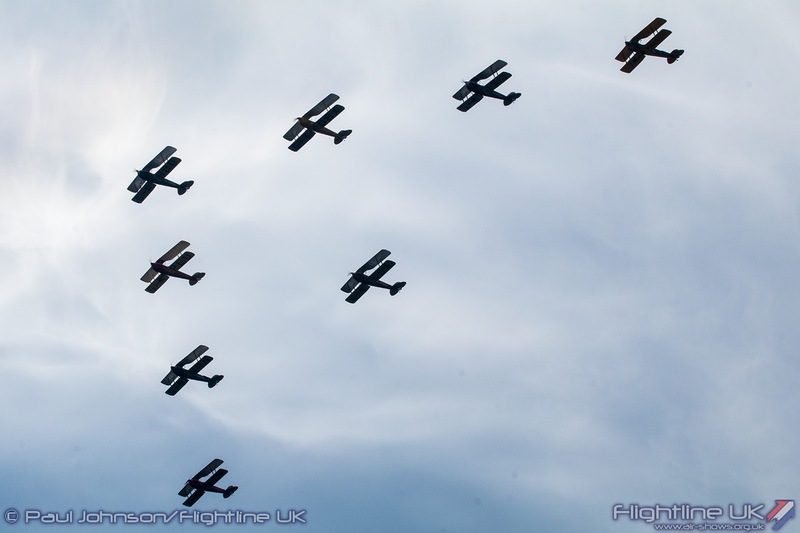 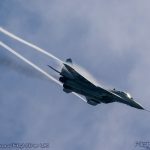 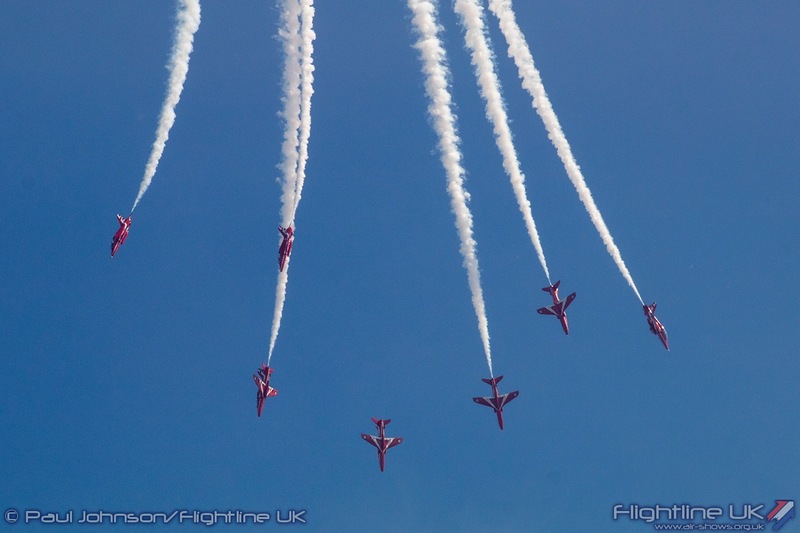 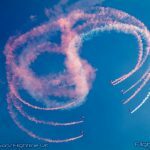 Yes, there were frustrations with traffic (entirely predictably considering the interest in the show) but this was quite simply was one of the most memorable airshows of recent years. 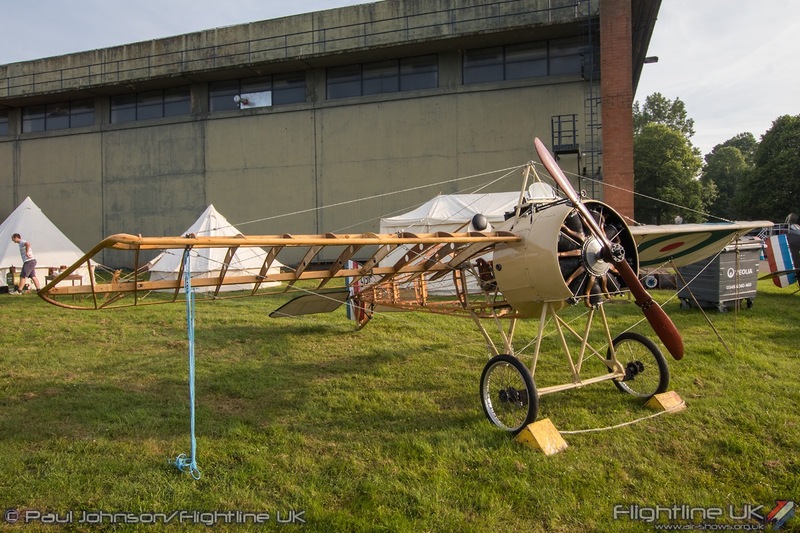 It was an outstanding exhibition of the Royal Air Force and its first 100 years. 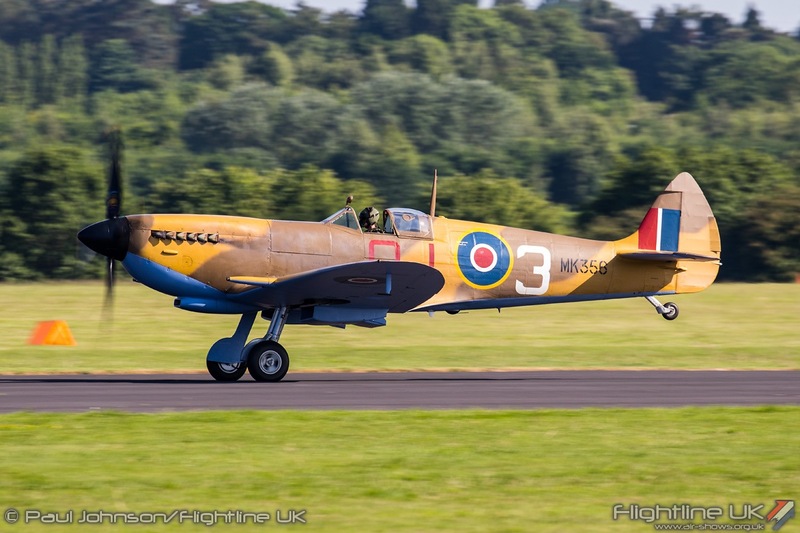 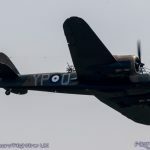 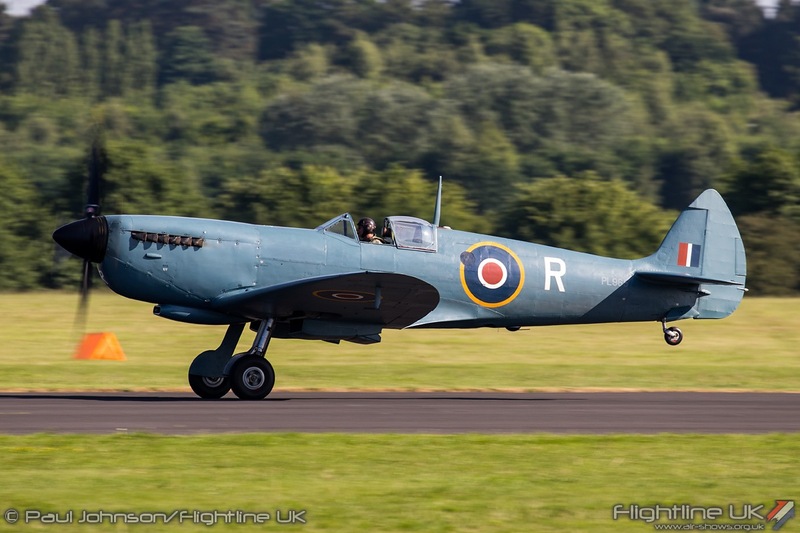 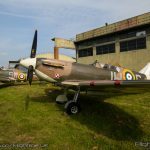 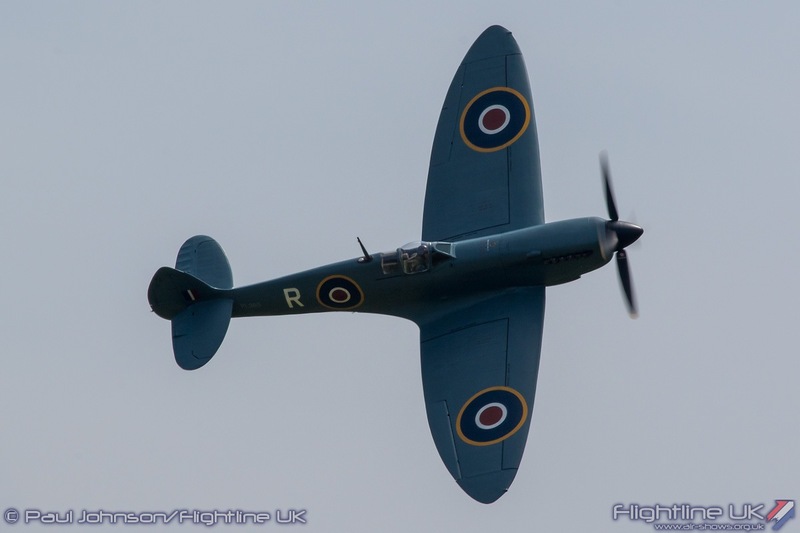 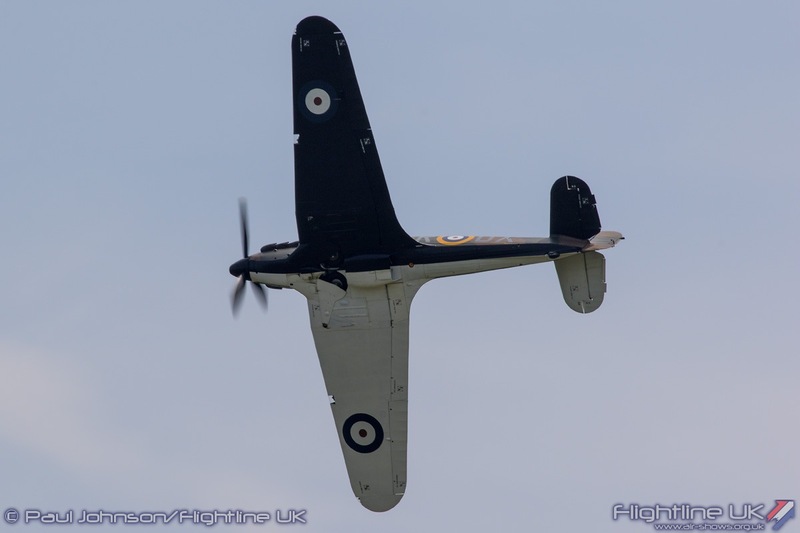 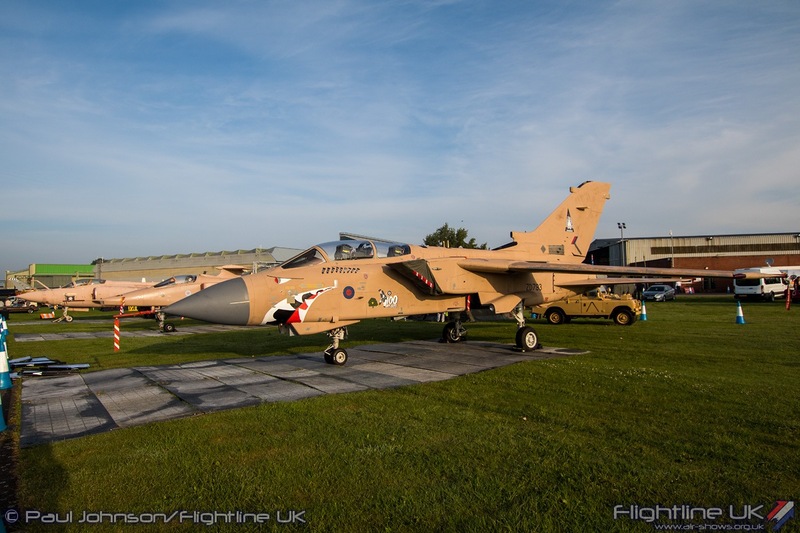 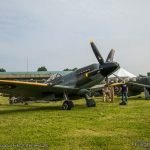 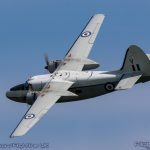 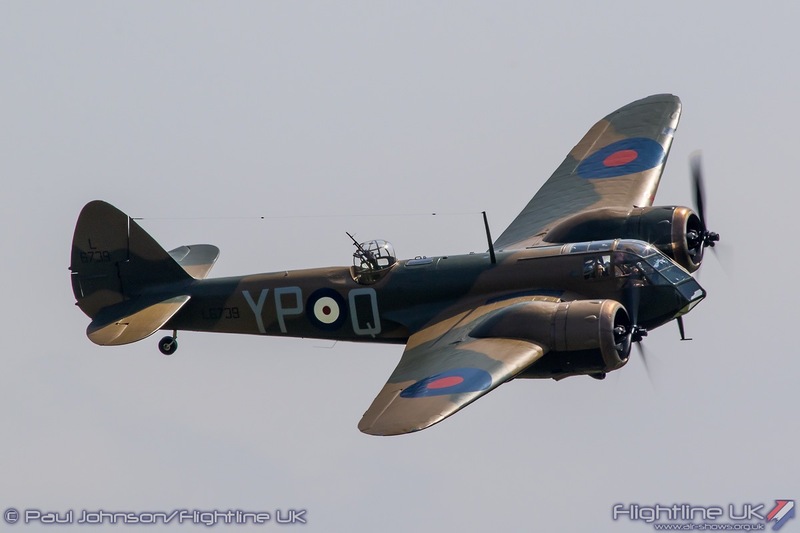 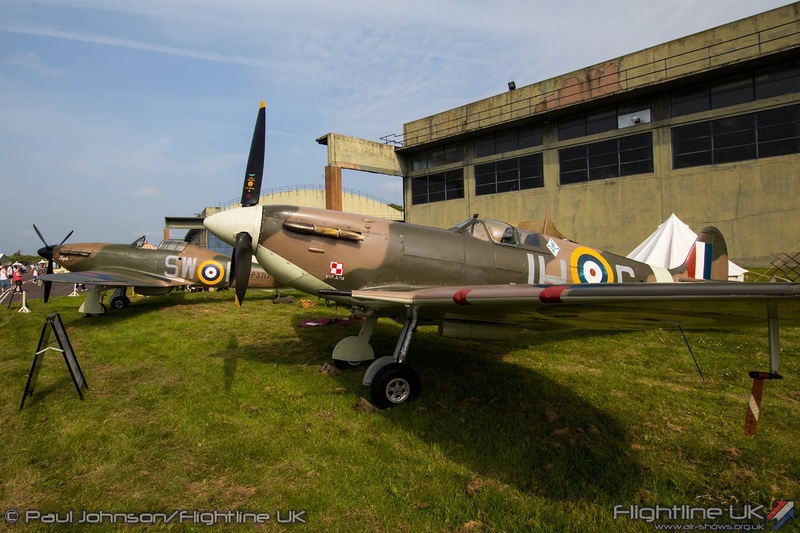 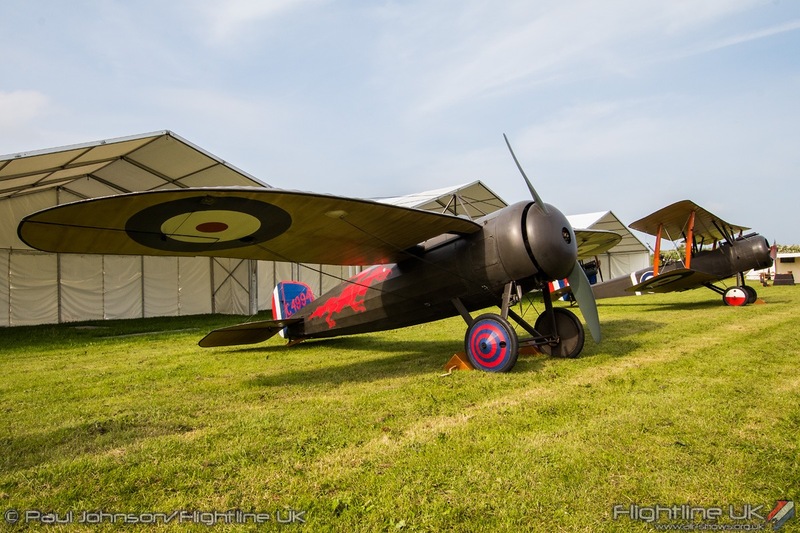 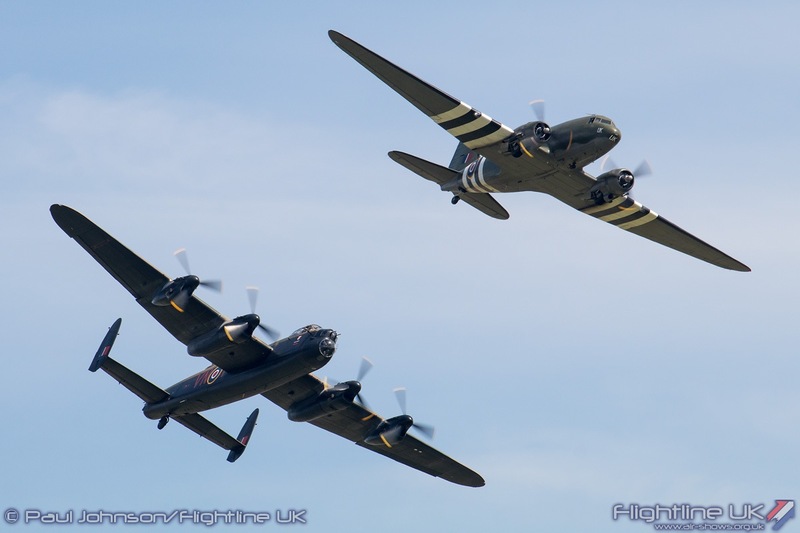 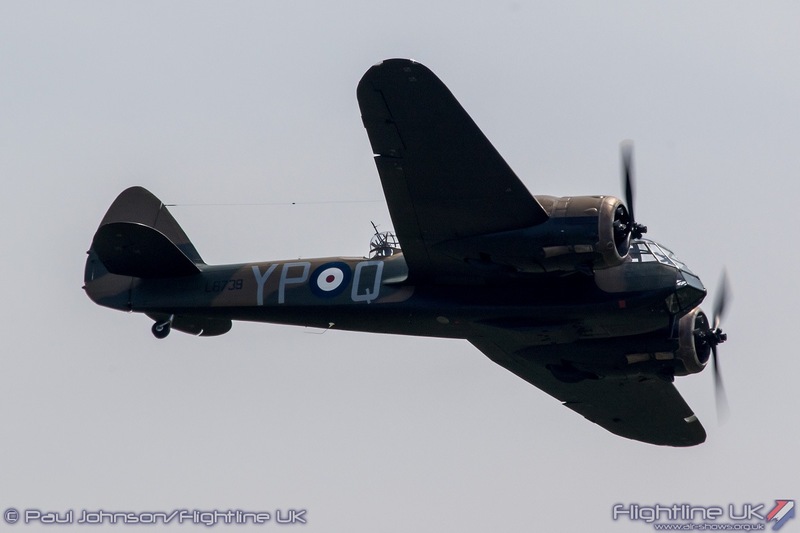 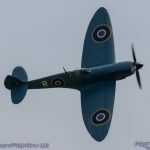 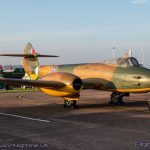 The efforts of the air show team, the RAF Museum, the Royal Air Force personnel plus those that brought airframes in by road and air created something truly special for the static display and ground exhibitions that quite possibly will never be repeated. 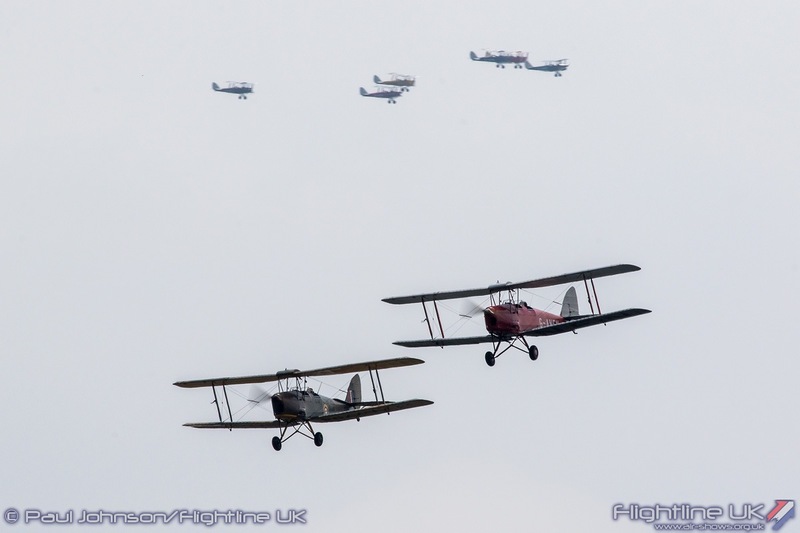 The flying display too was really very good with some real historic and international gems. 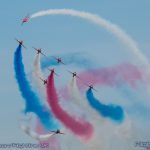 All at RAF Cosford should be very proud of the air show they staged as they’ve set the bar very high for subsequent RAF100 events.